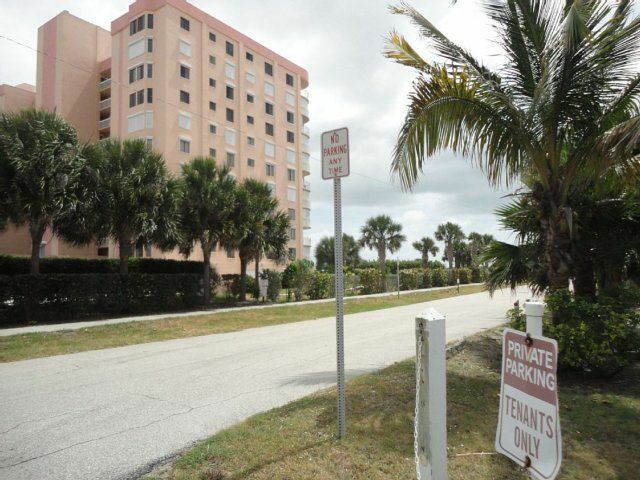 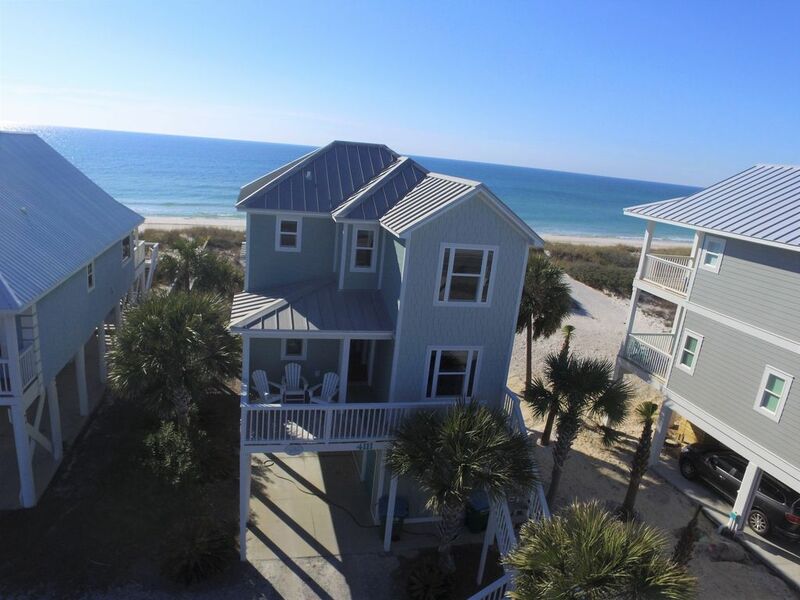 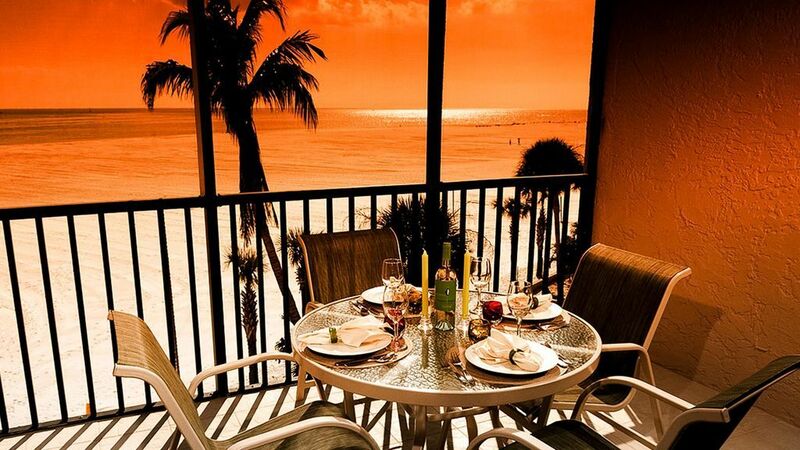 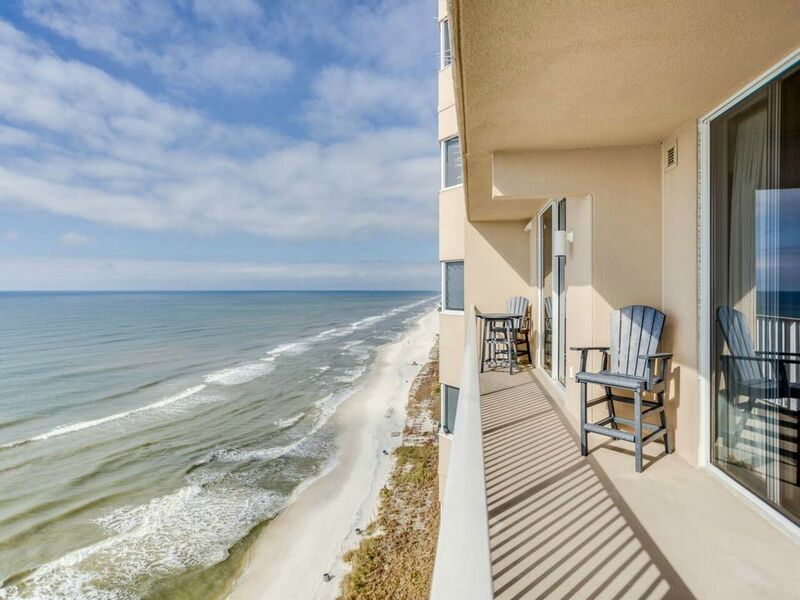 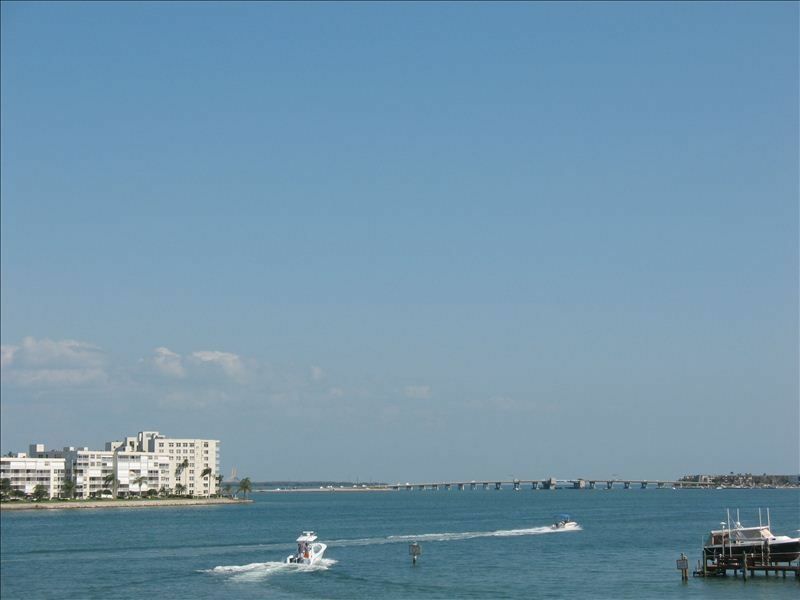 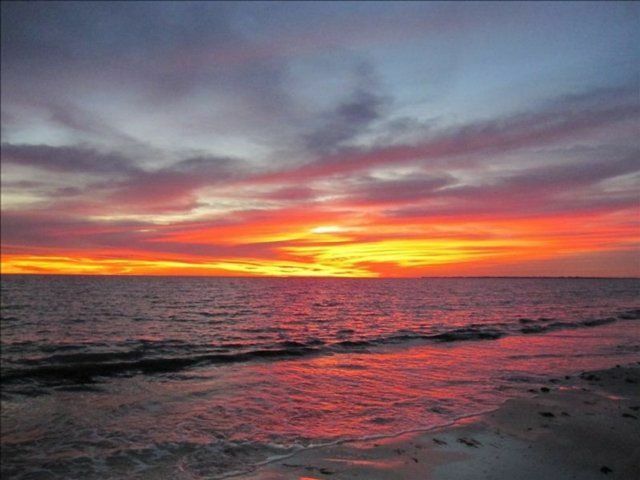 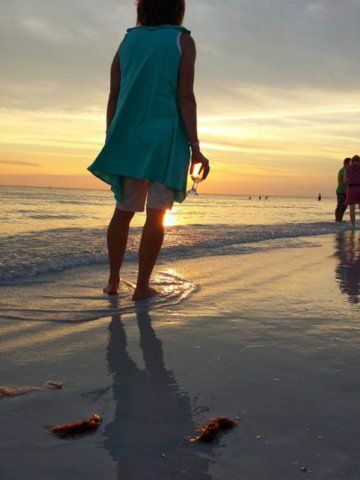 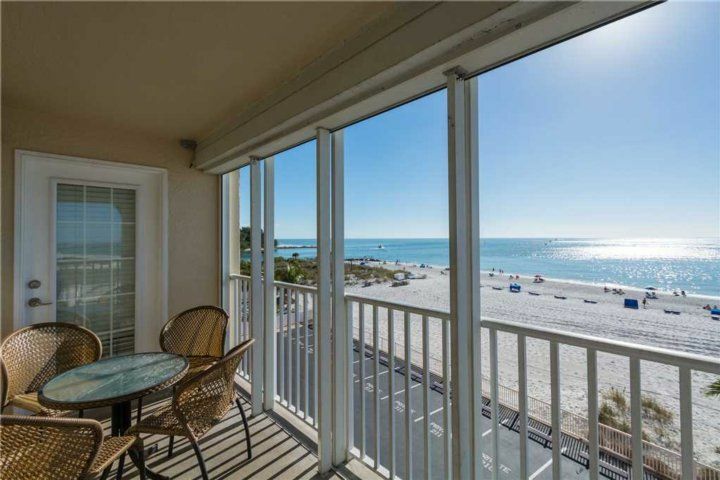 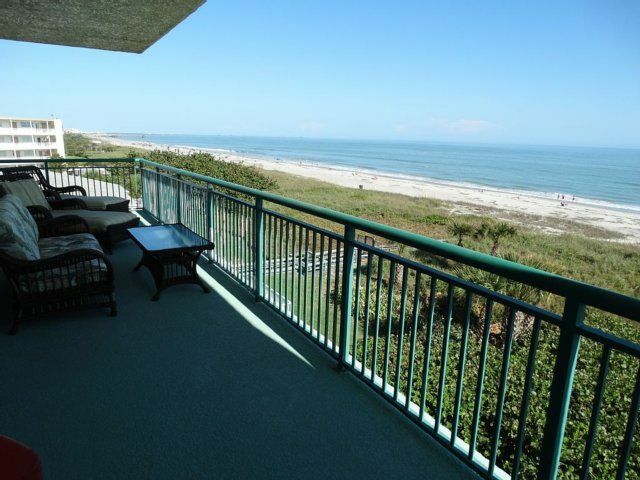 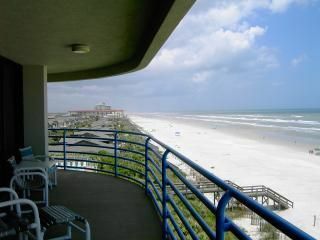 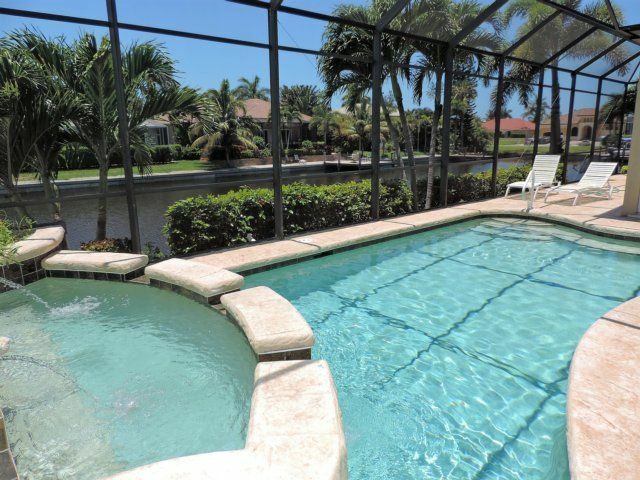 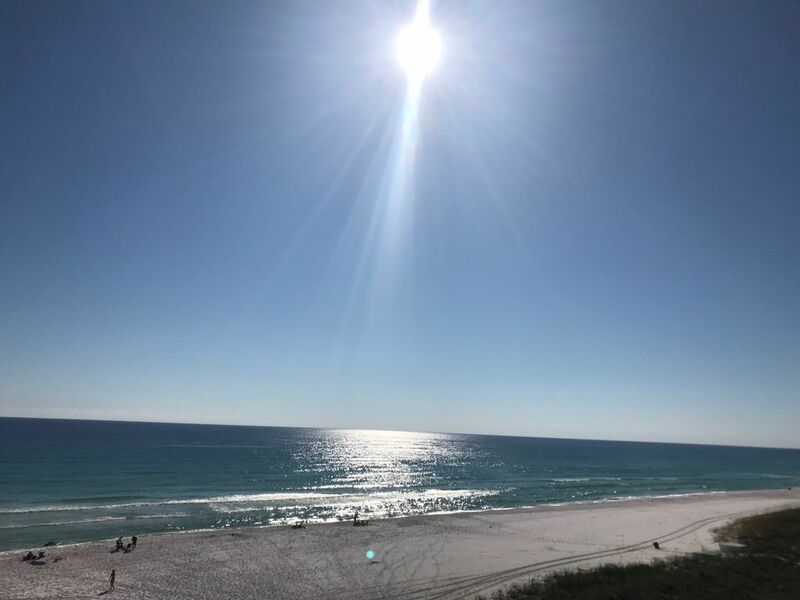 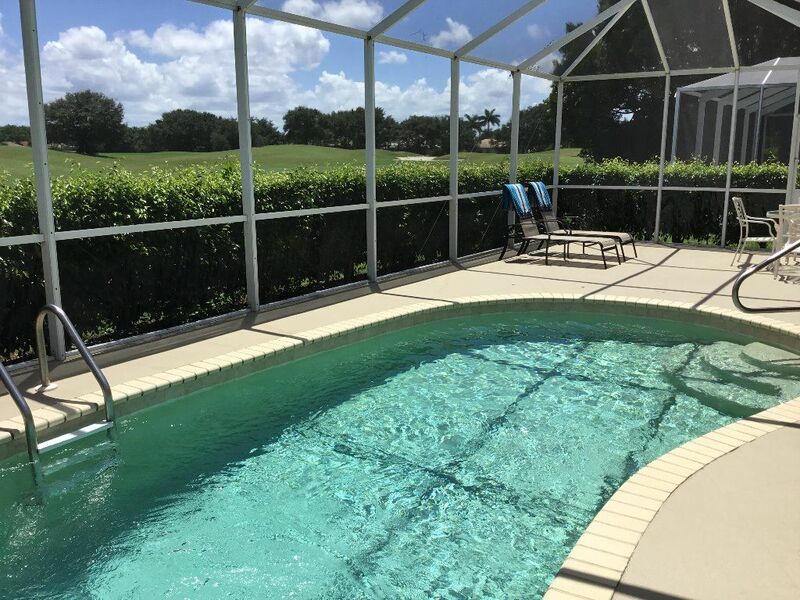 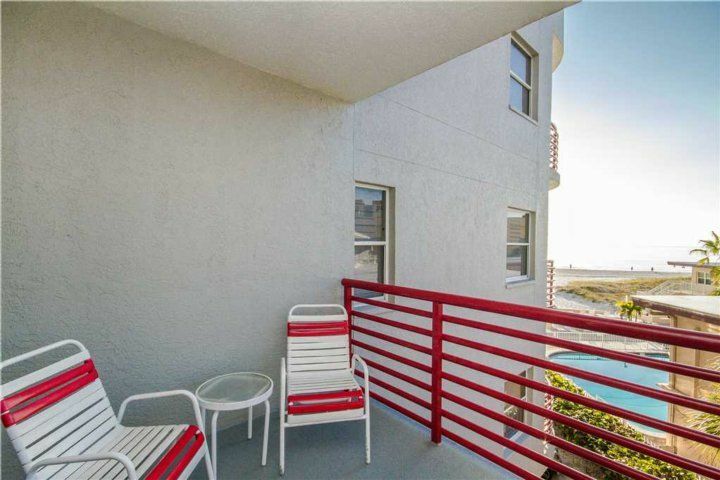 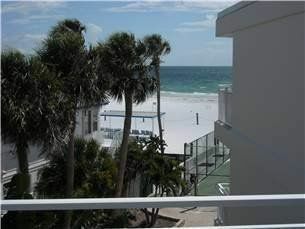 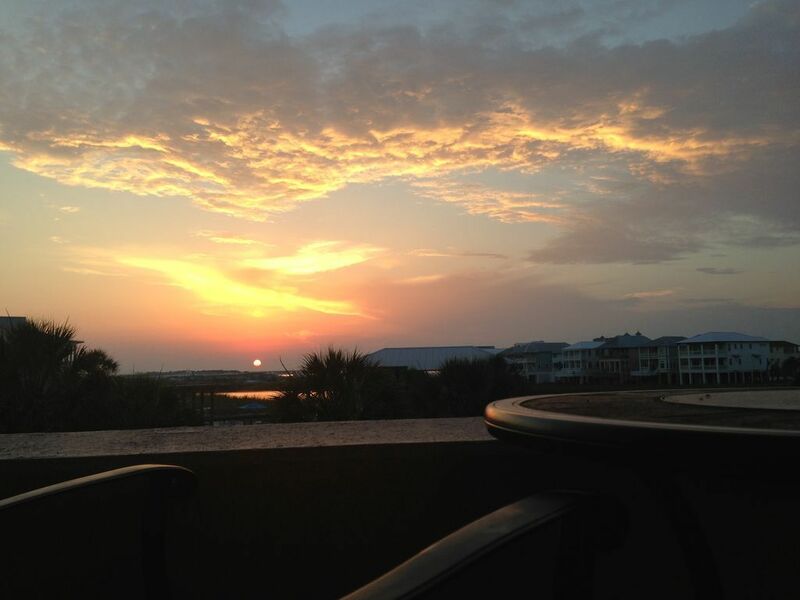 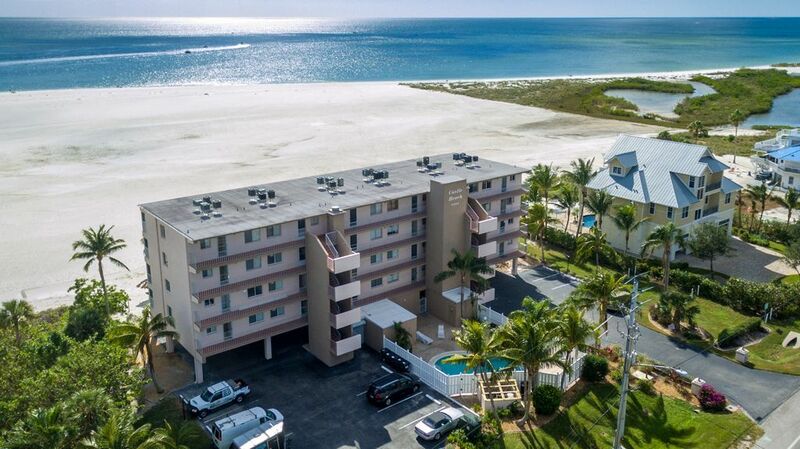 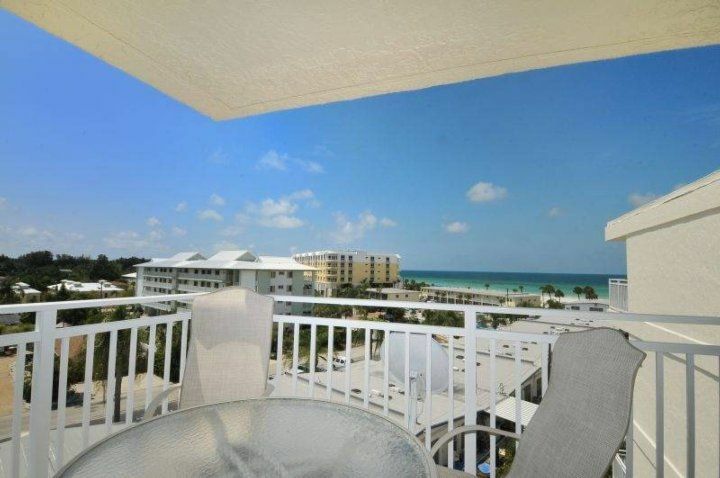 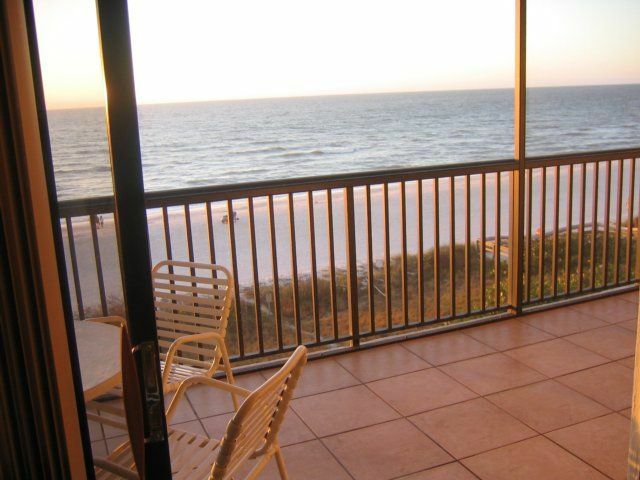 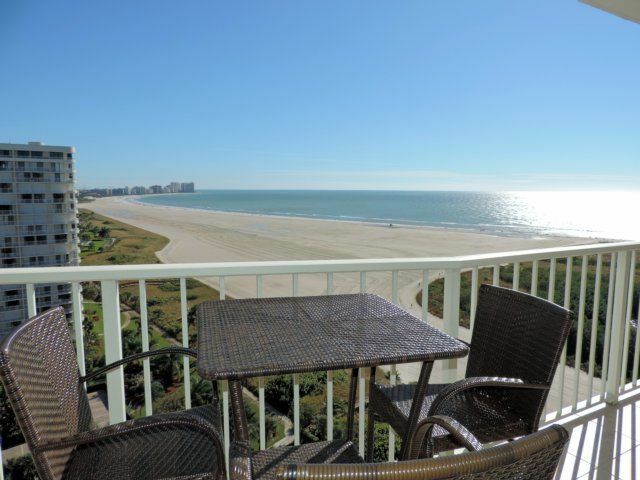 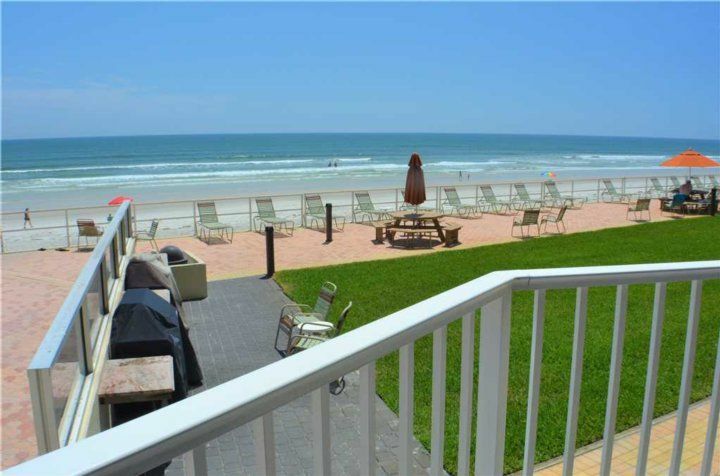 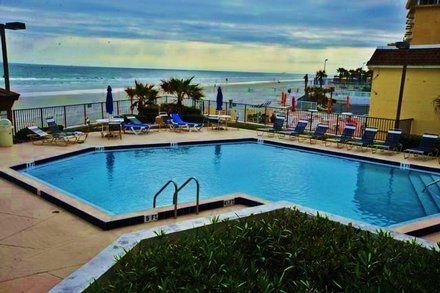 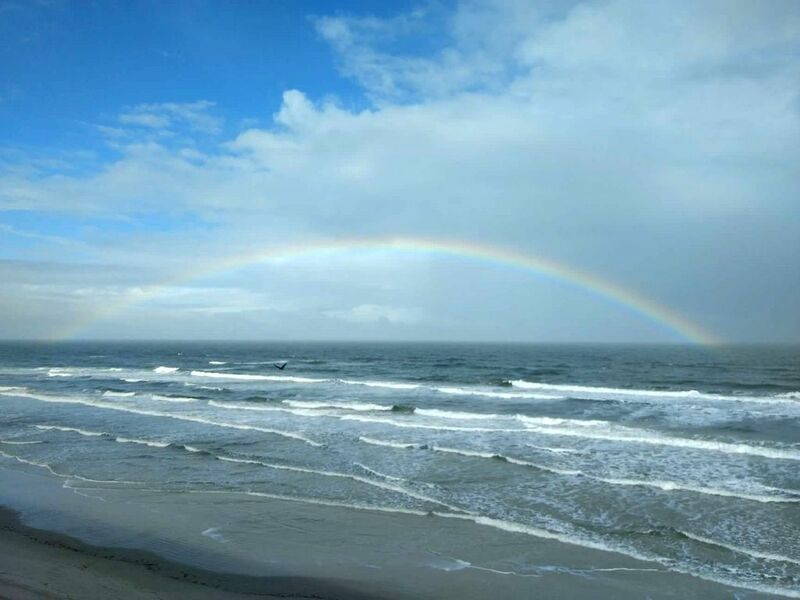 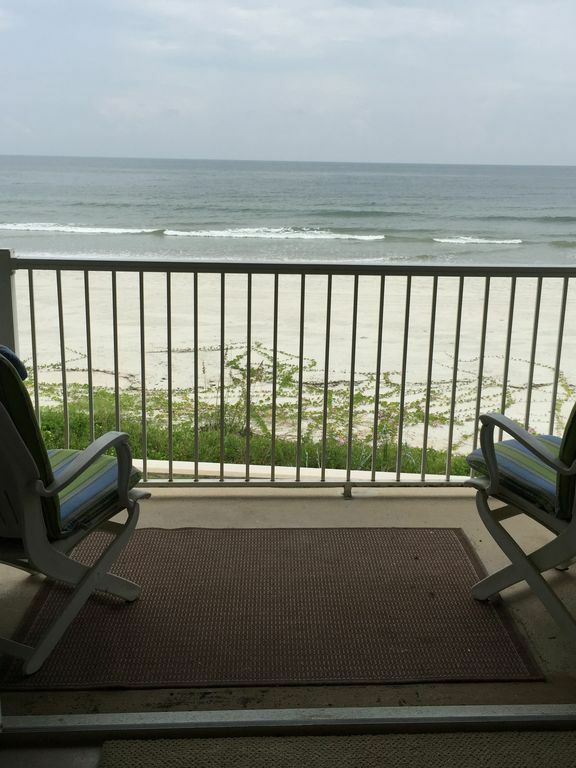 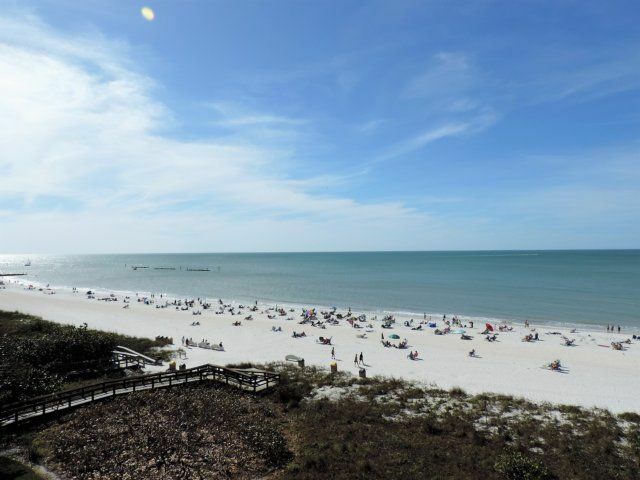 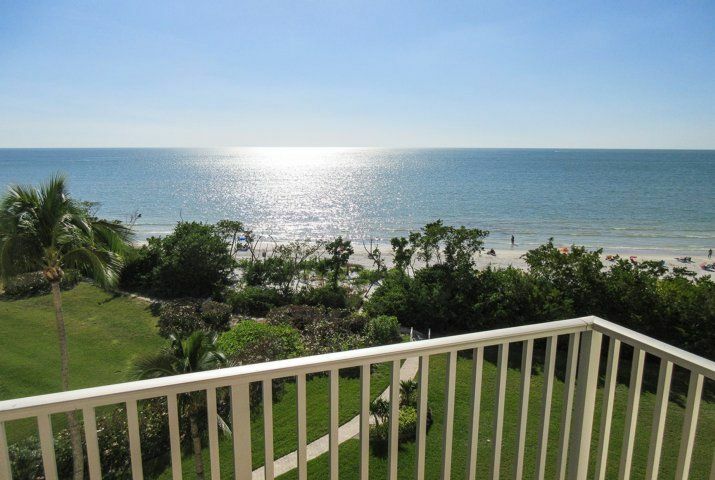 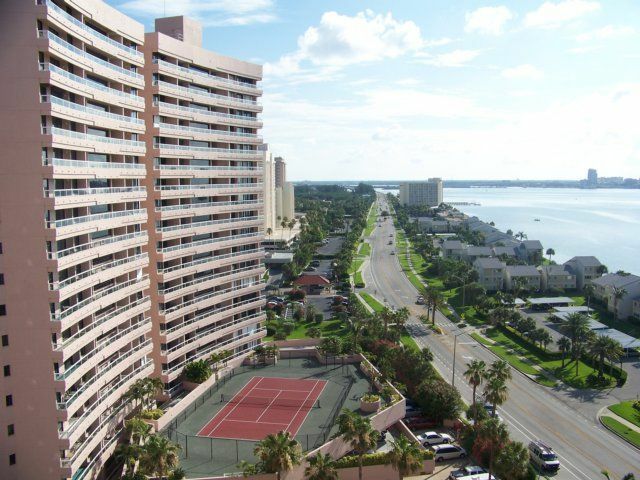 When you stay at Crescent Street Manor, you can walk to the east side of Siesta Key in just minutes to catch the sunrise over the Gulf of Mexico. 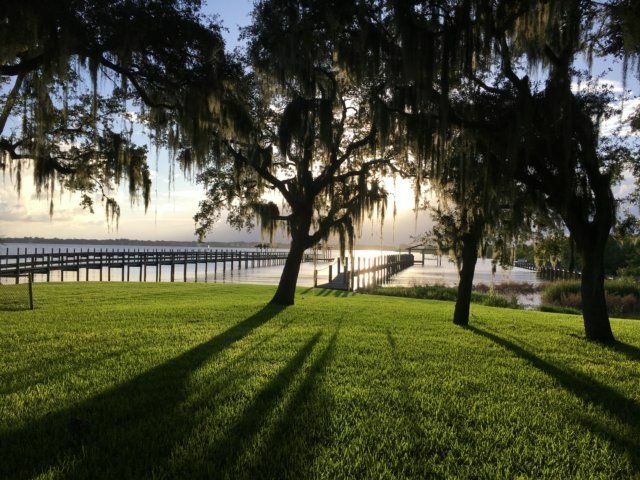 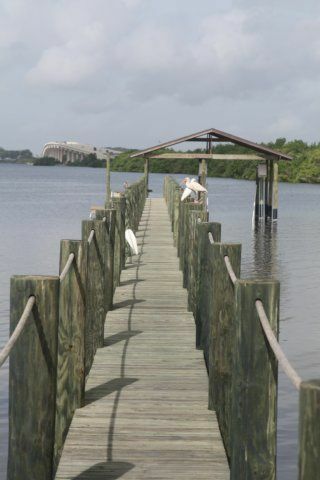 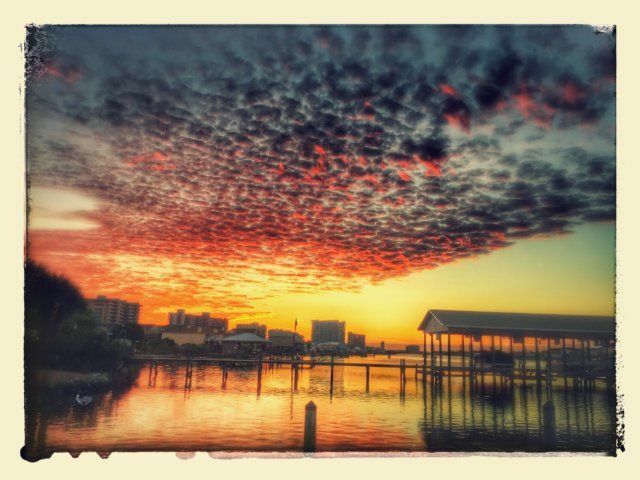 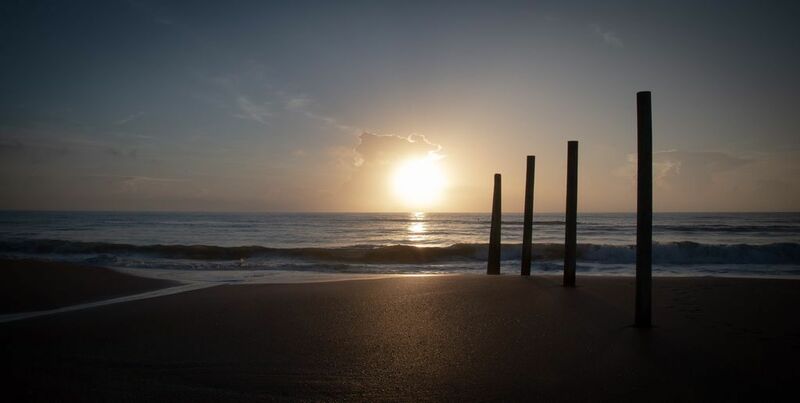 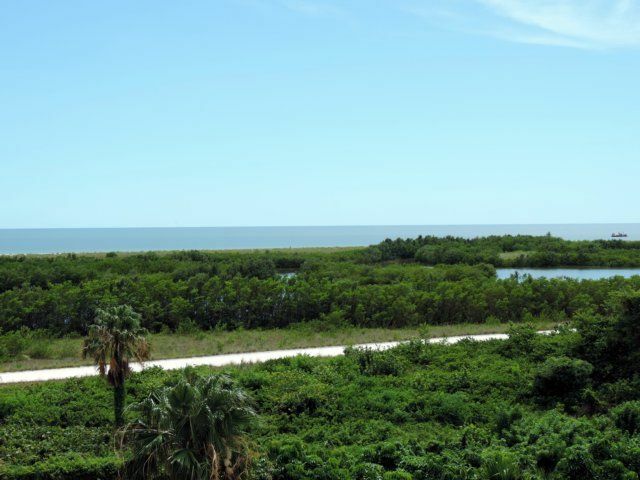 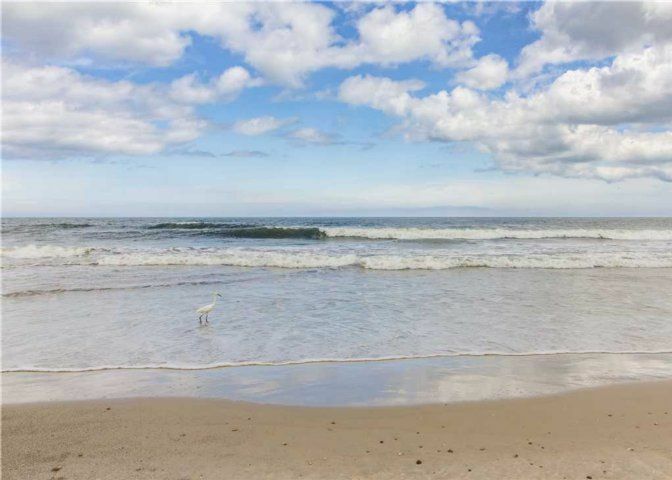 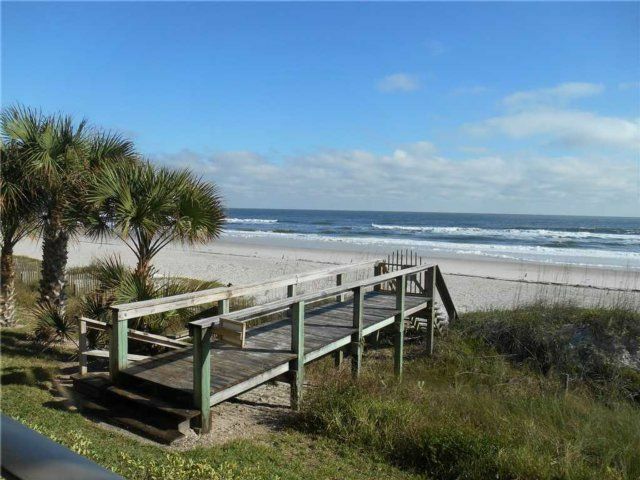 Then later, just before dusk, you can take an equally brief stroll over to the west side of the barrier island to watch the sunset over the gulf! 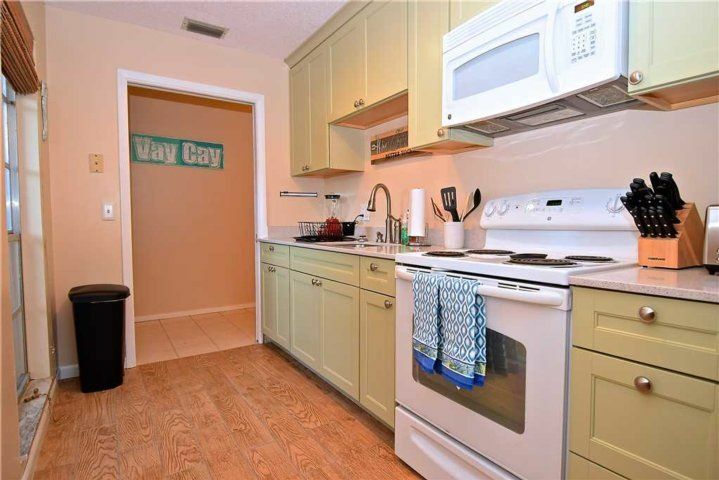 That’s all thanks to Crescent Street’s prime location. 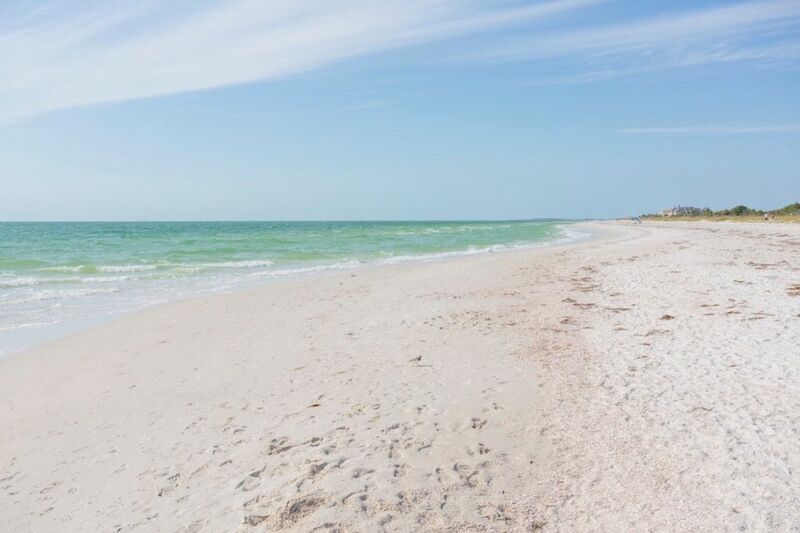 A quiet, sandy walkway will take you to Crescent Beach, renowned for its shimmering quartz sand, and to Point of Rocks. 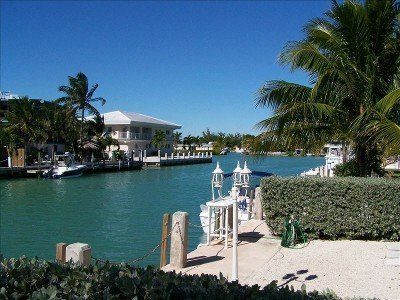 This beautiful spot is popular with novice snorkelers for its relatively shallow water—and with snorkelers in general for its coral formations and fish, crabs, even the occasional small octopus. 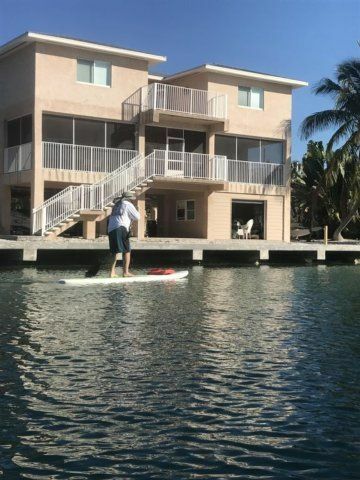 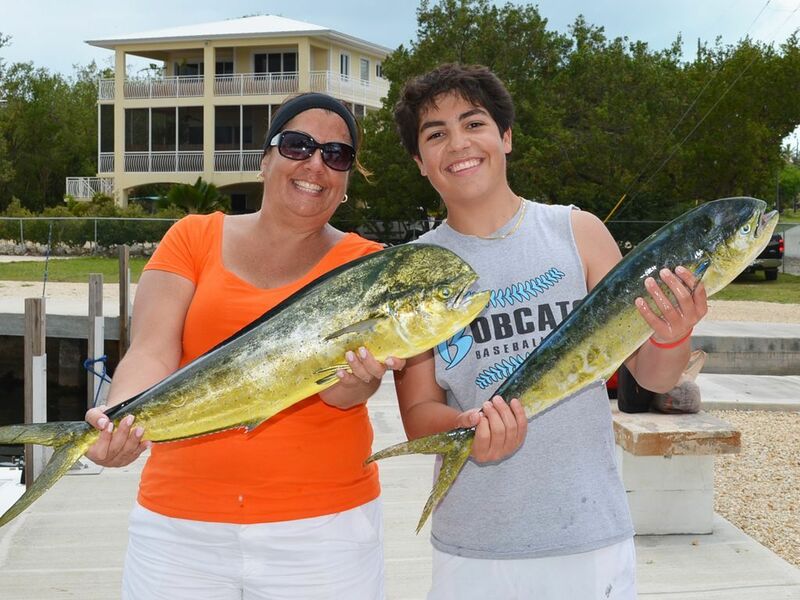 When you’re not snorkeling, fishing, swimming or collecting shells, you can paddleboard, parasail, canoe, or kayak. 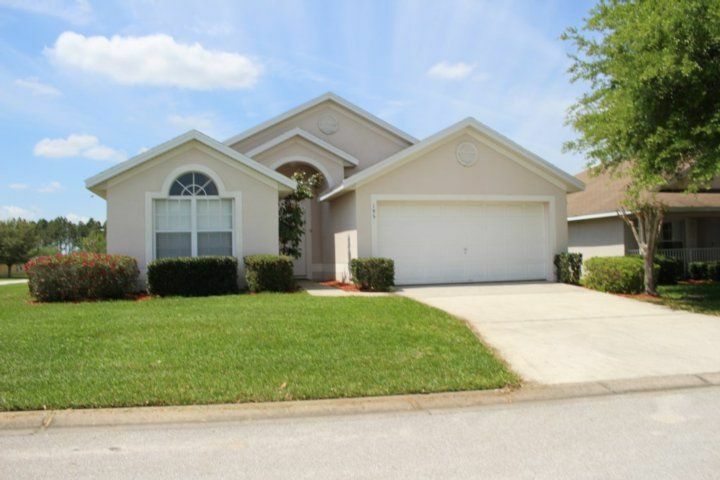 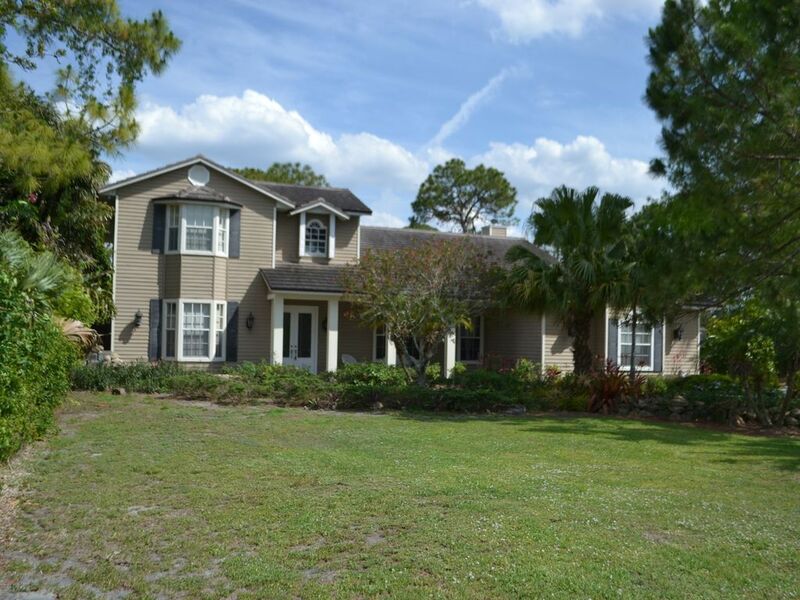 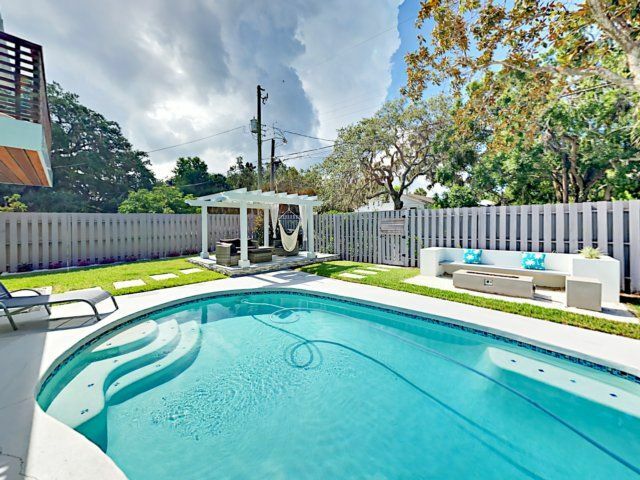 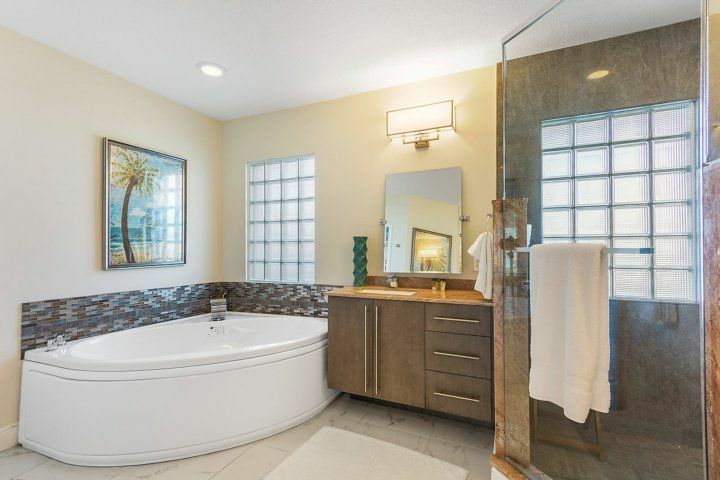 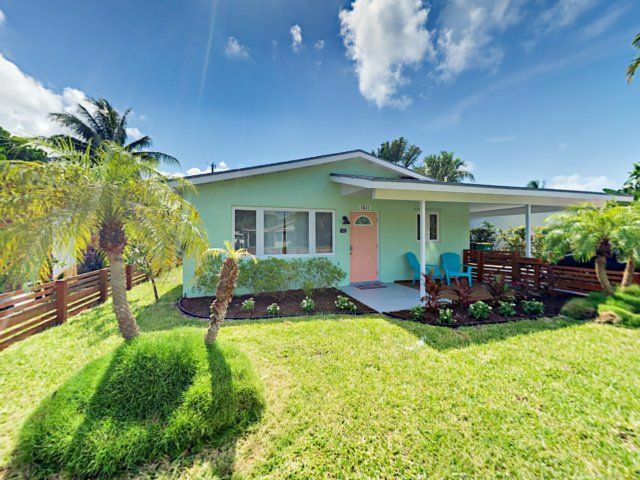 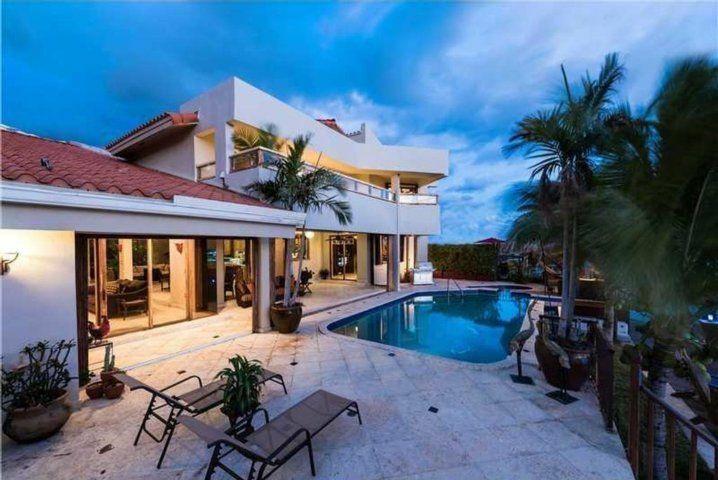 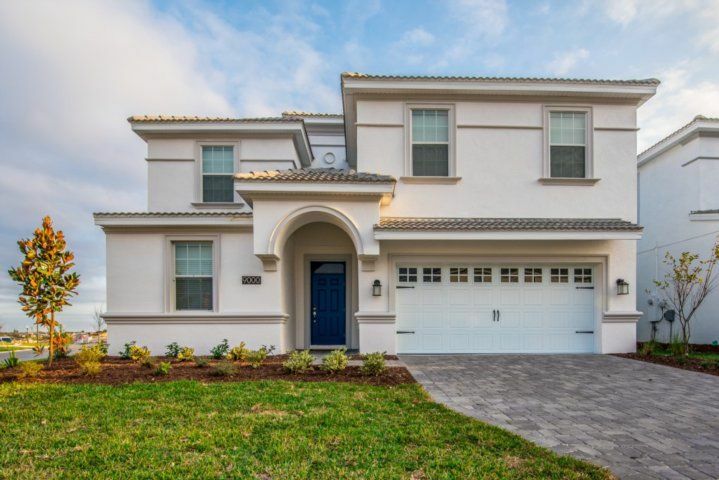 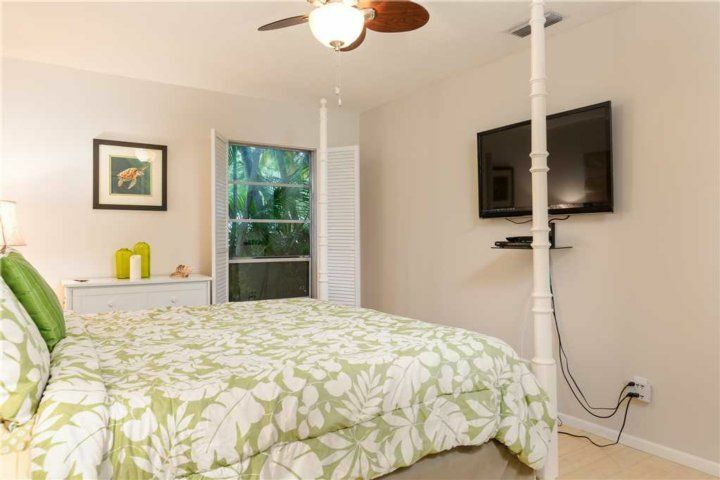 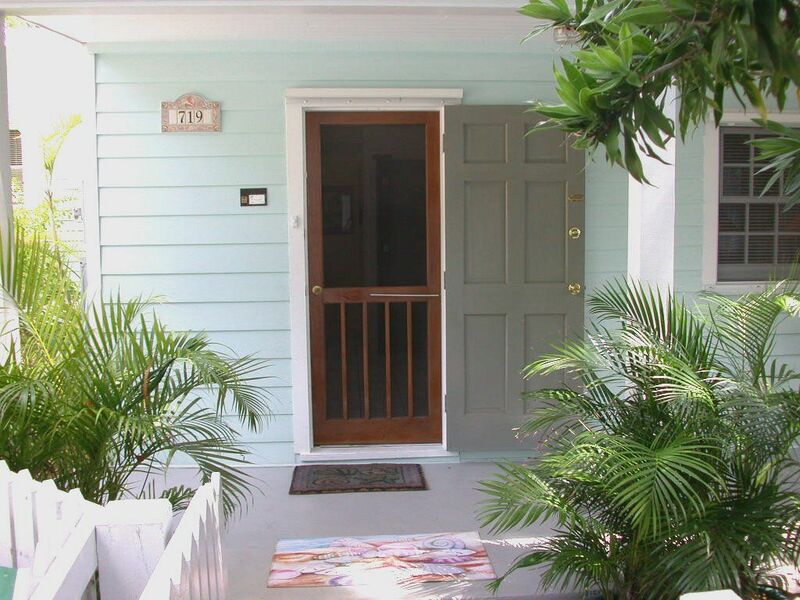 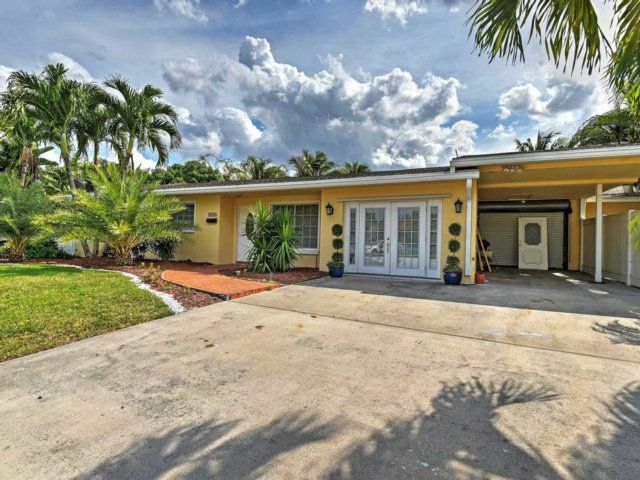 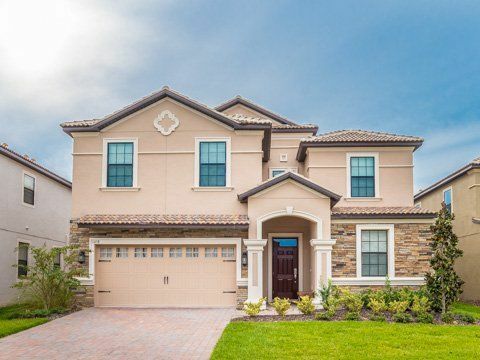 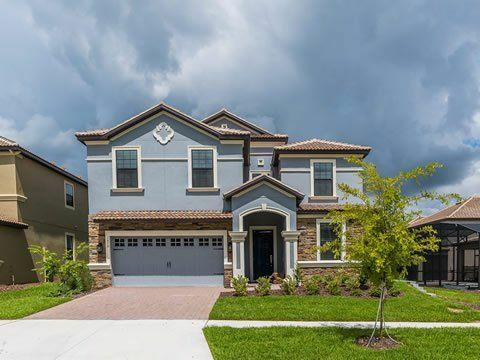 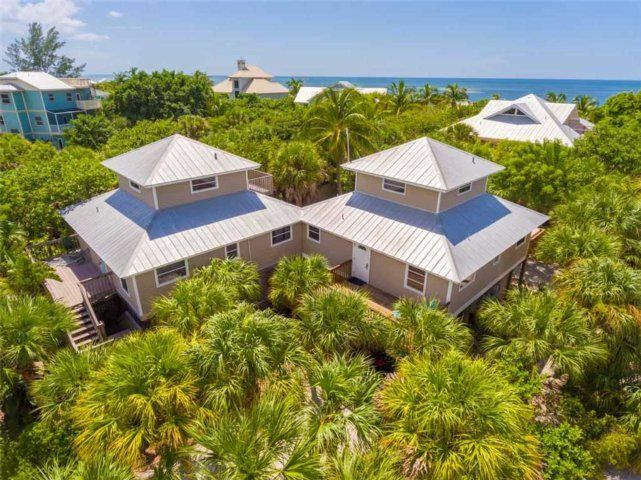 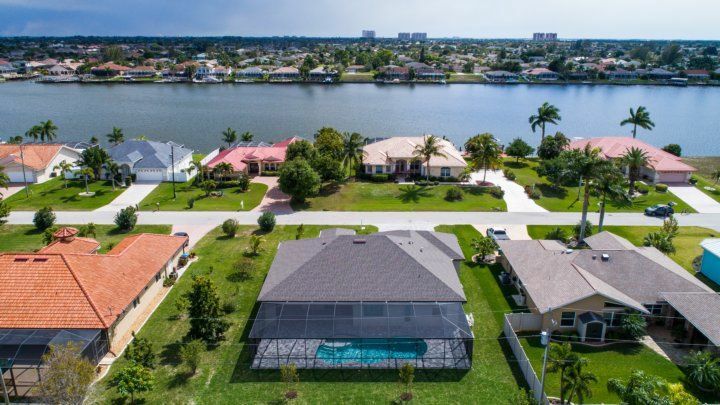 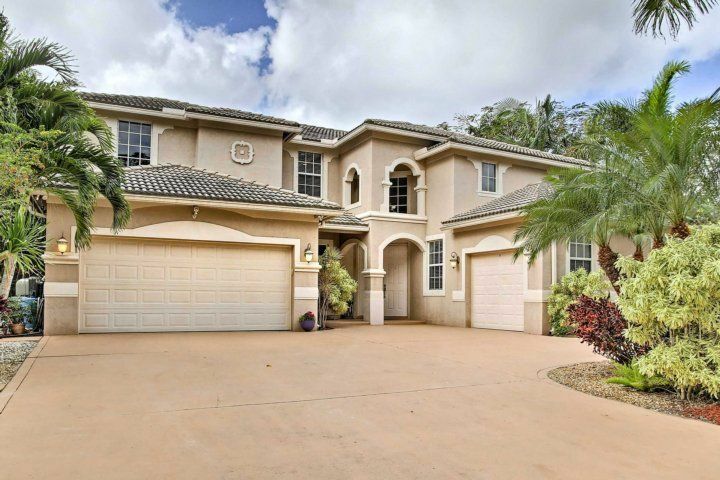 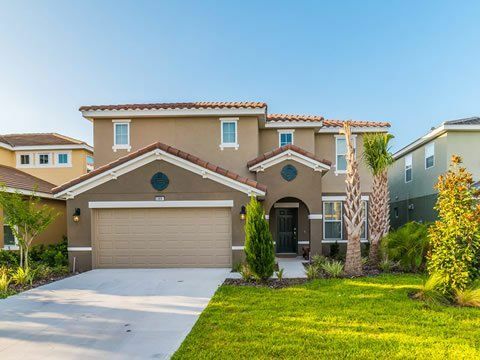 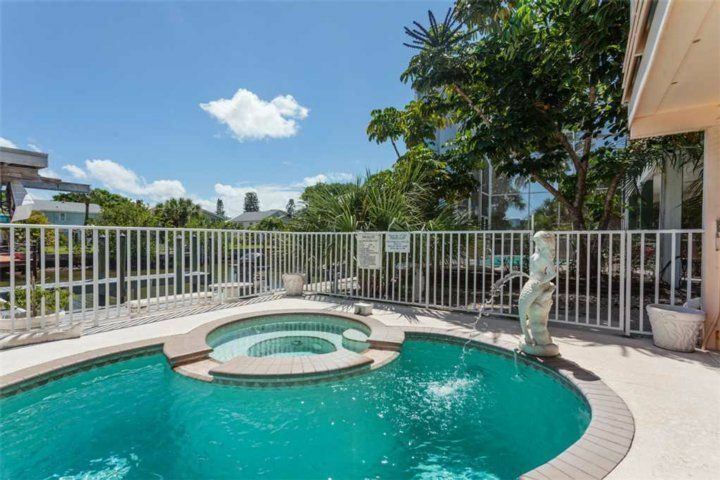 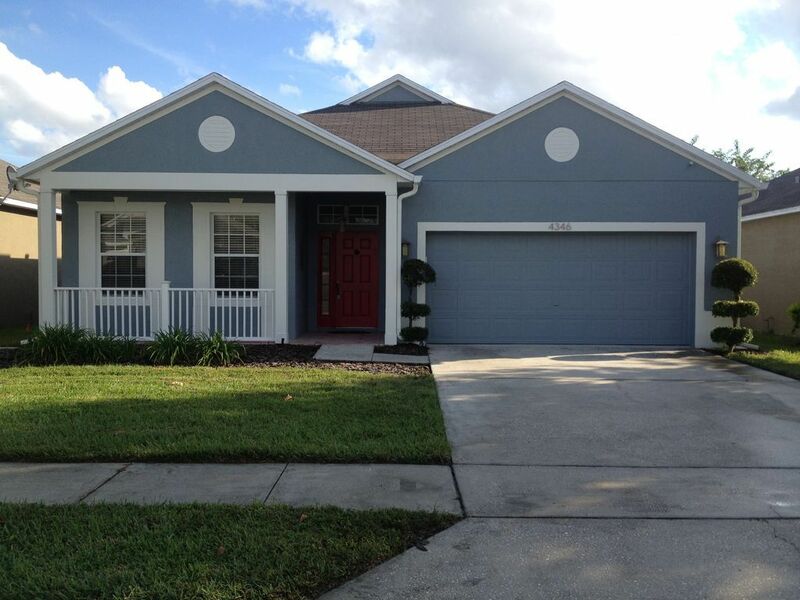 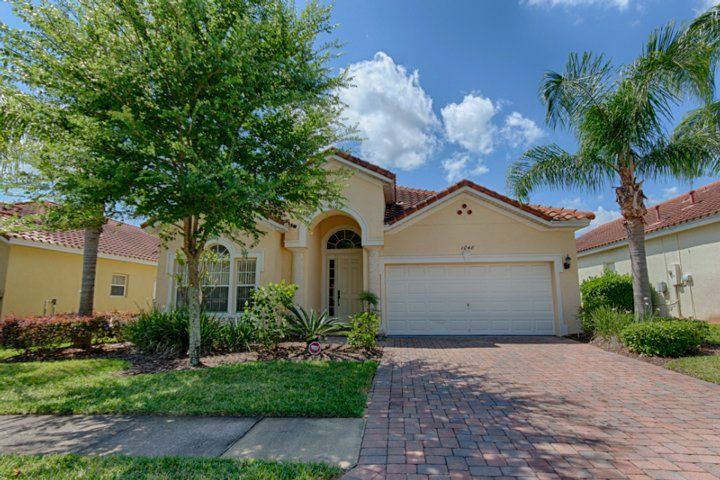 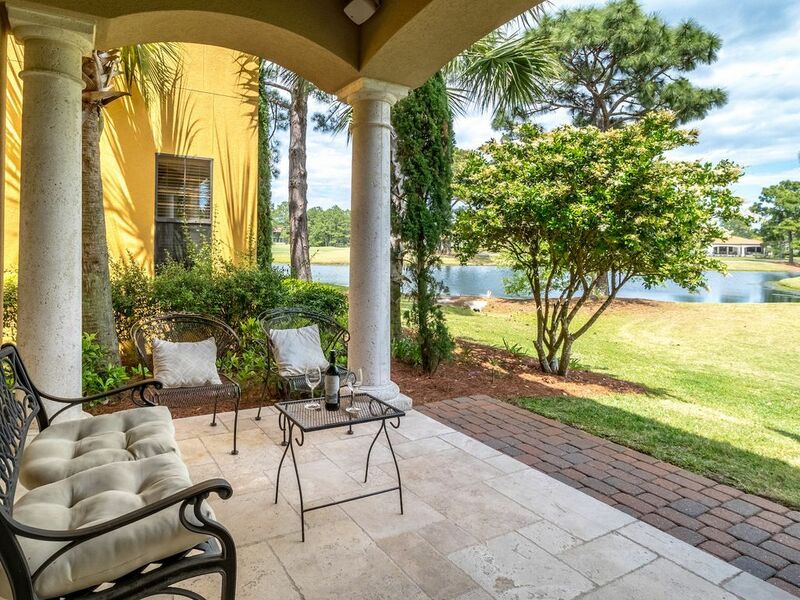 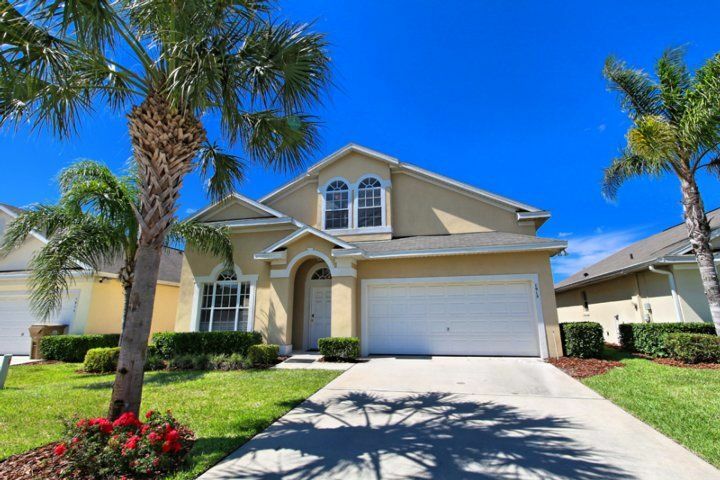 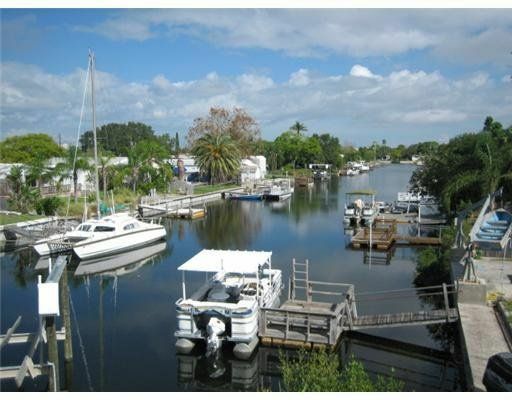 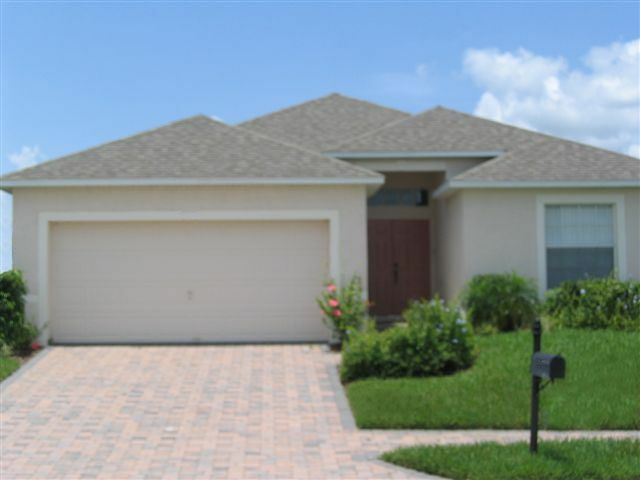 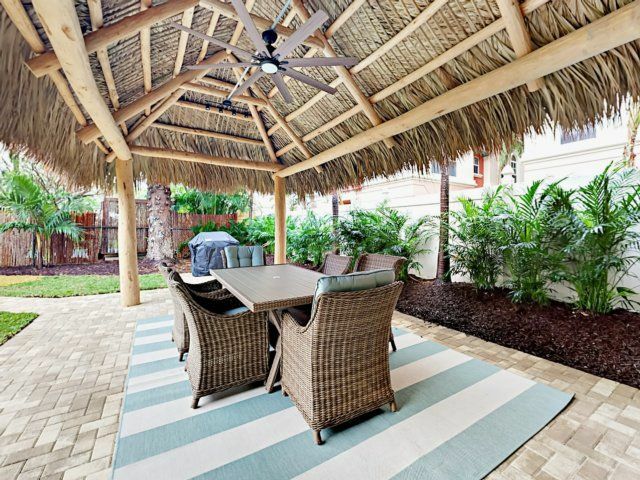 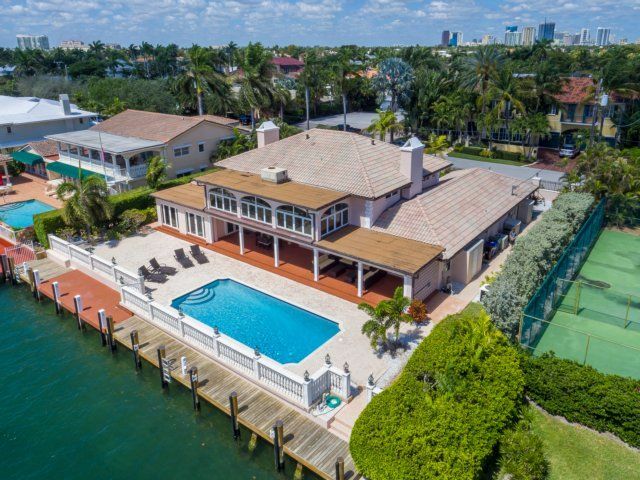 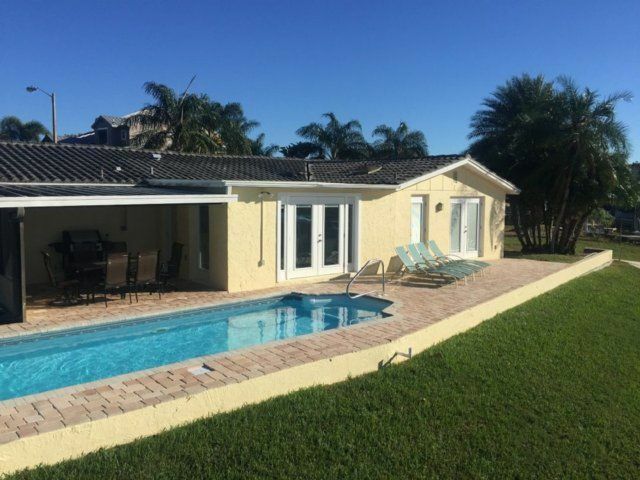 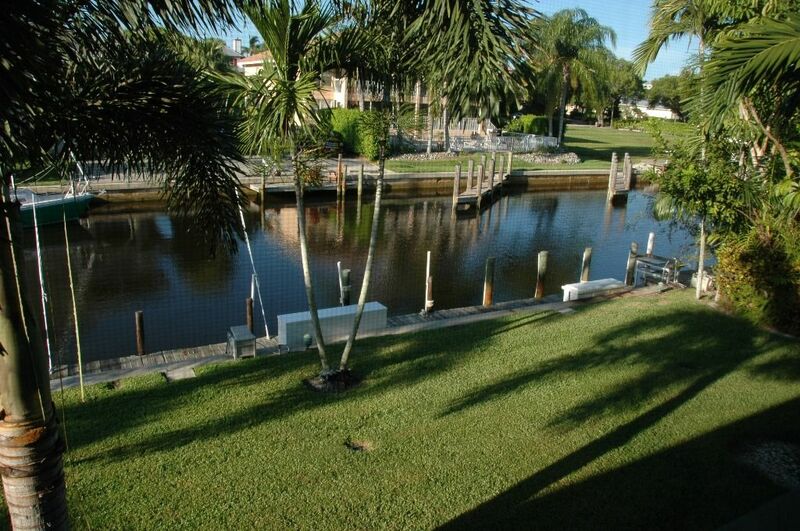 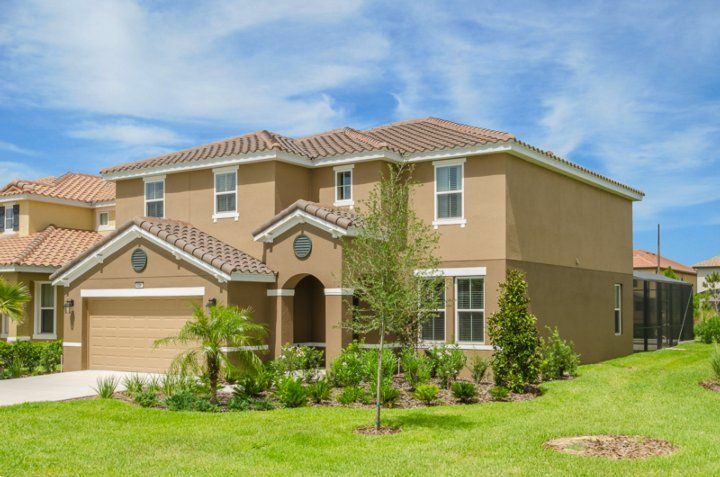 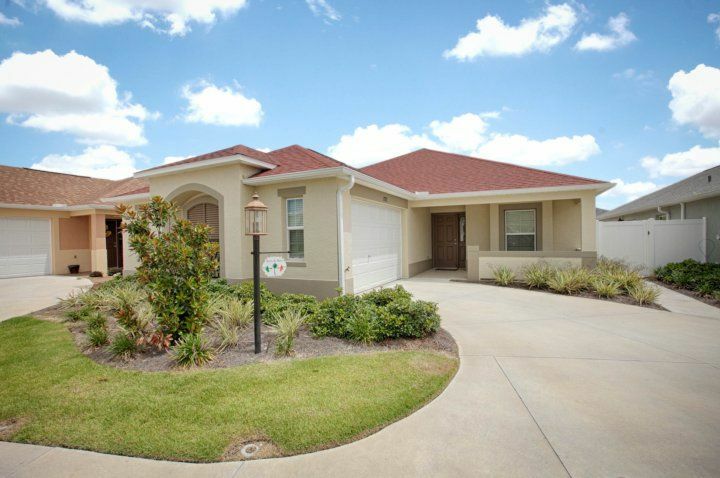 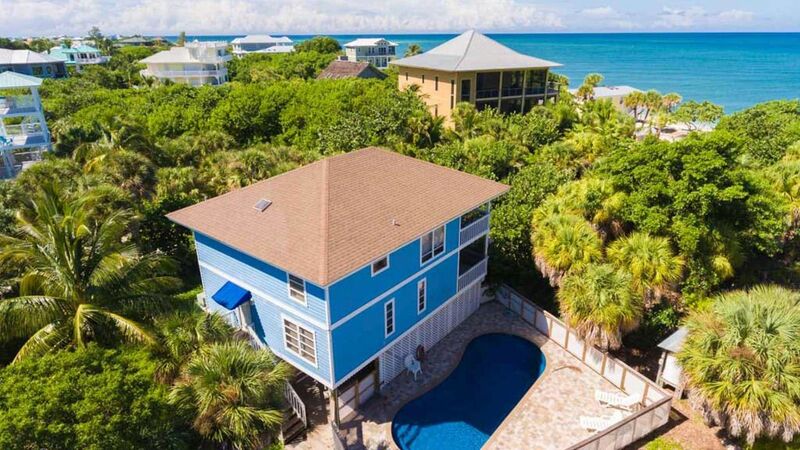 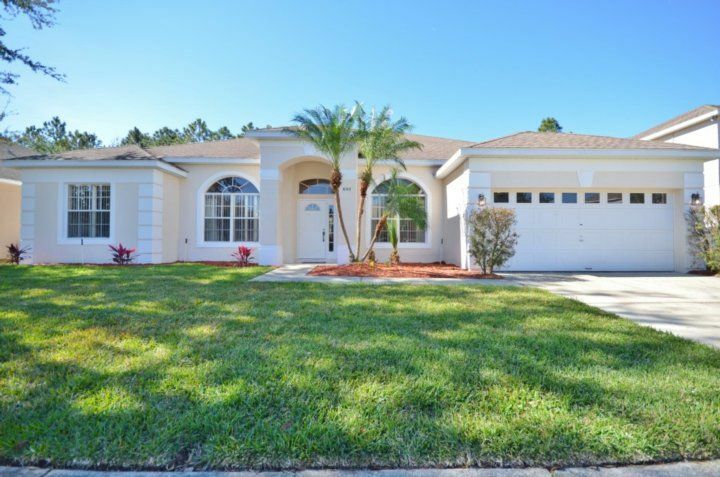 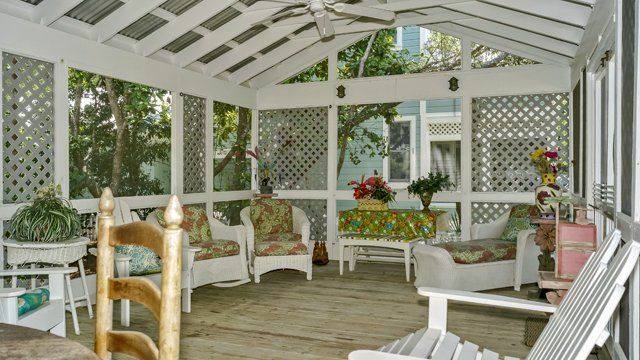 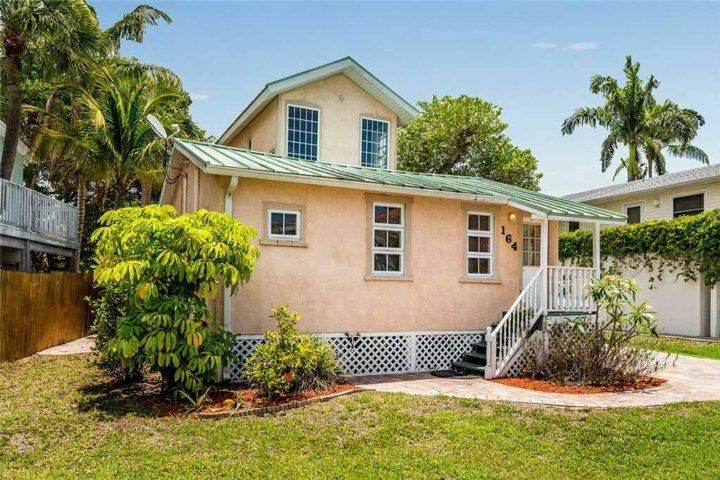 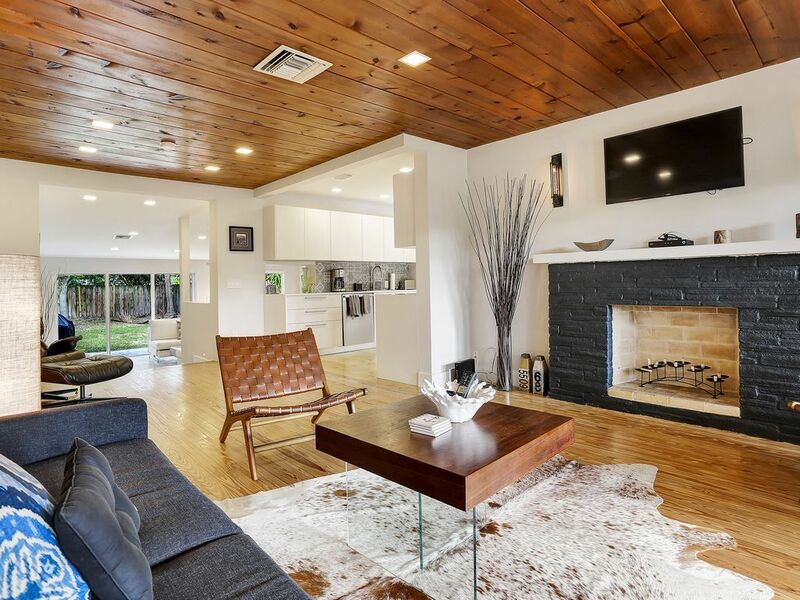 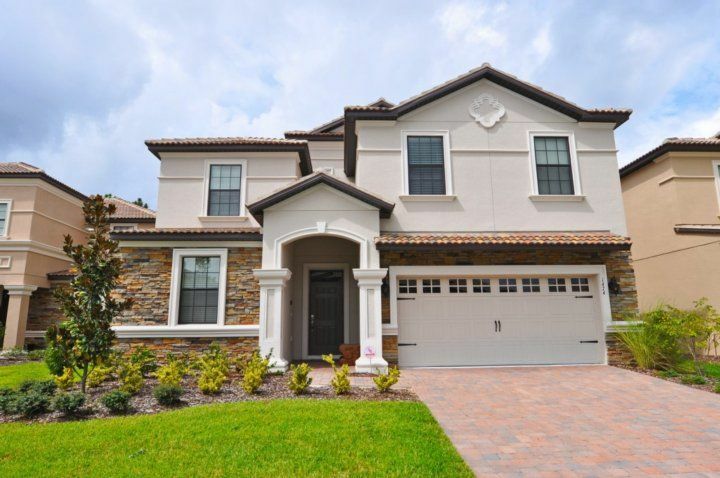 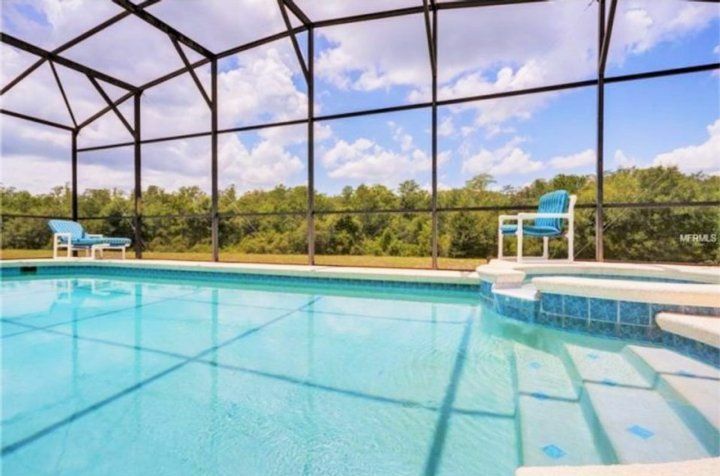 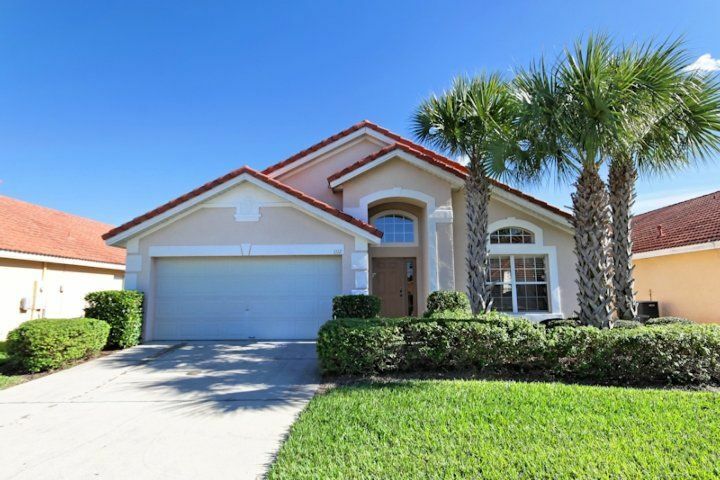 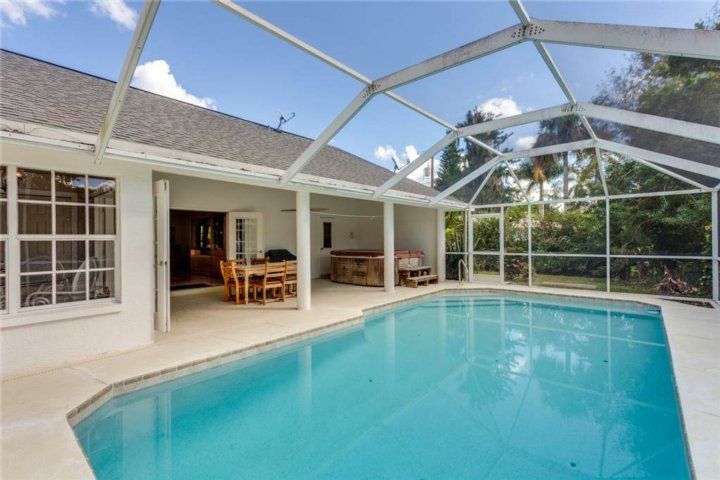 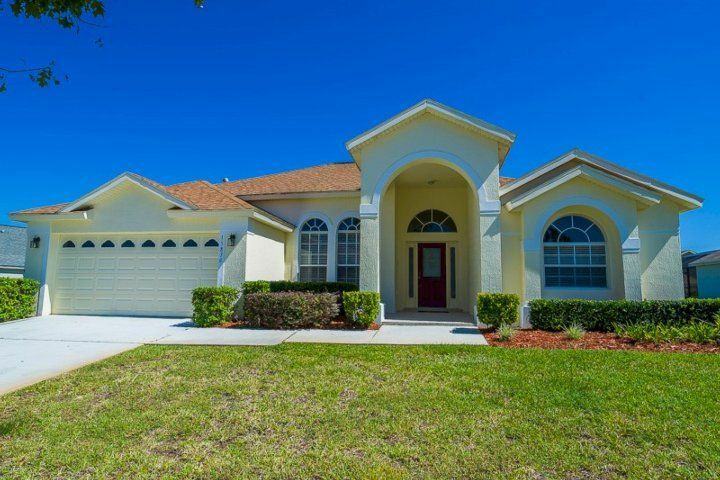 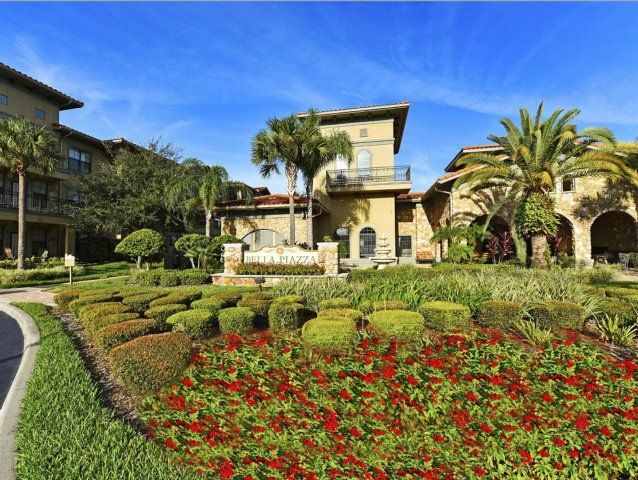 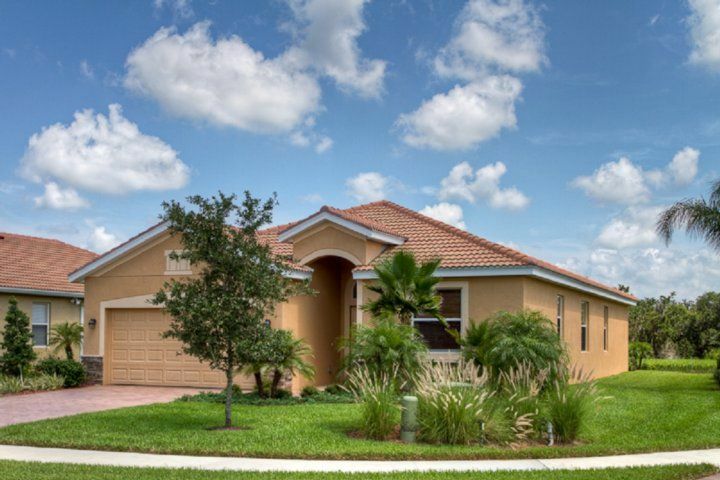 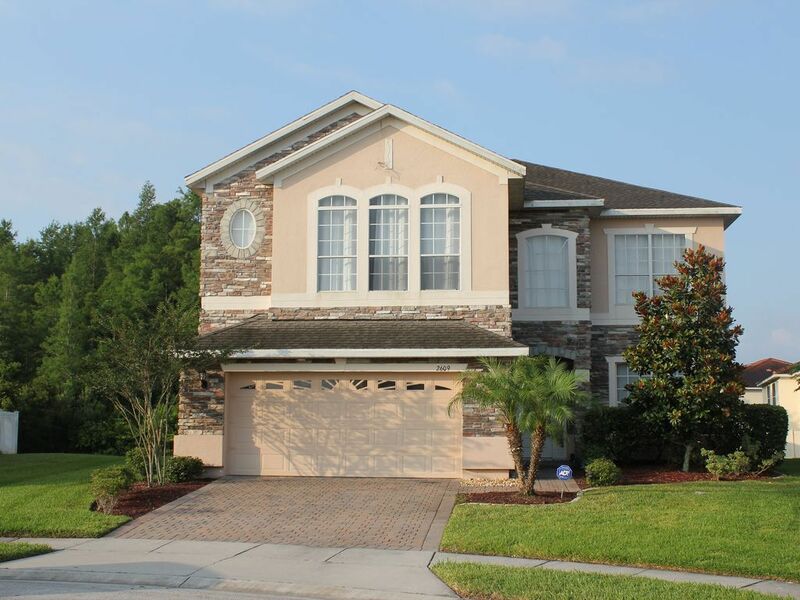 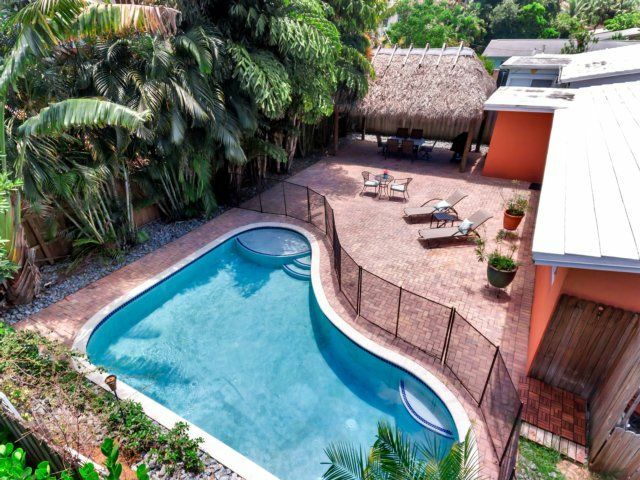 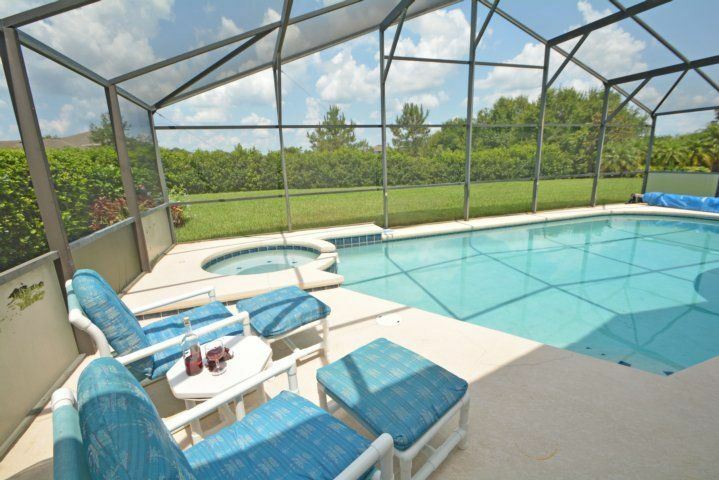 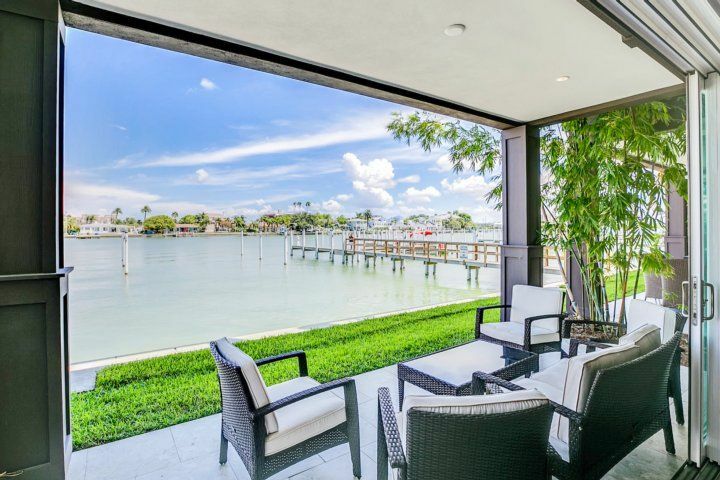 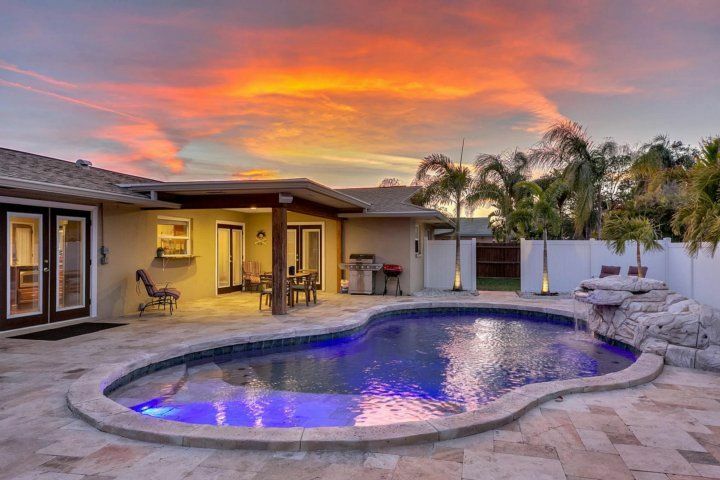 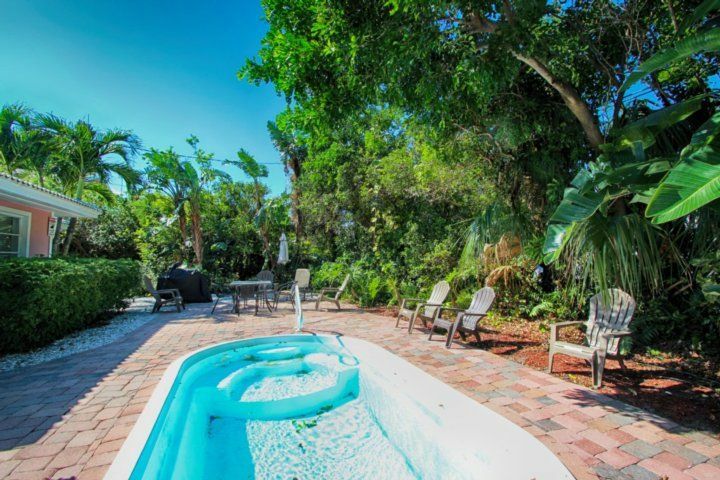 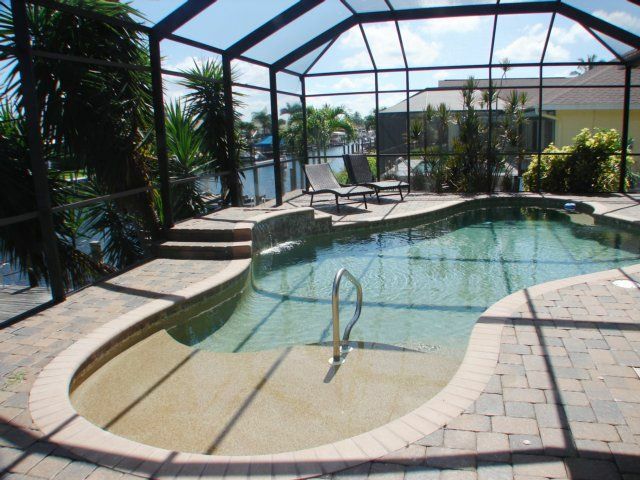 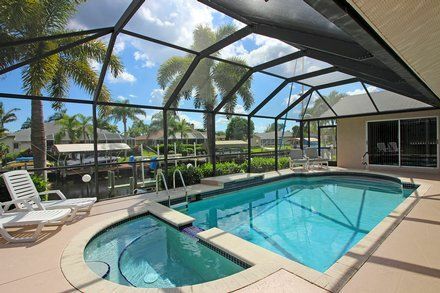 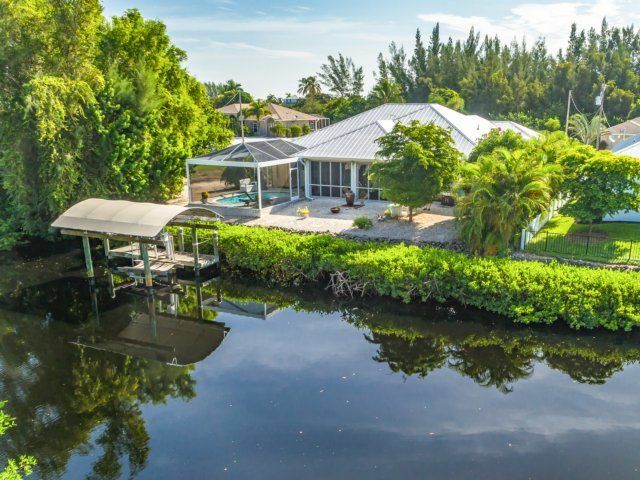 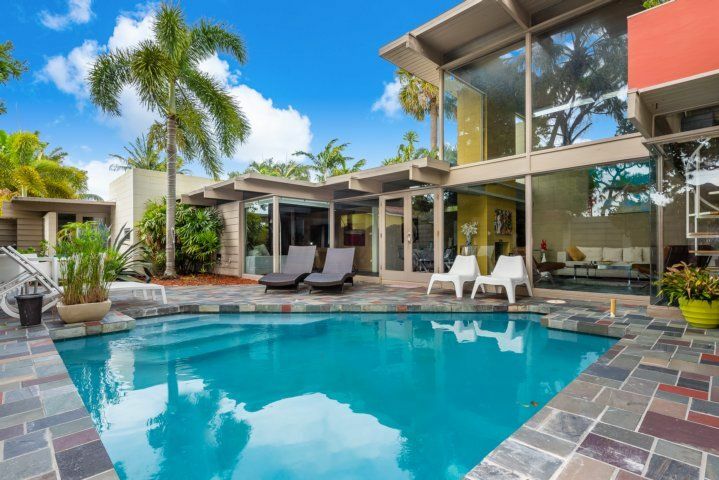 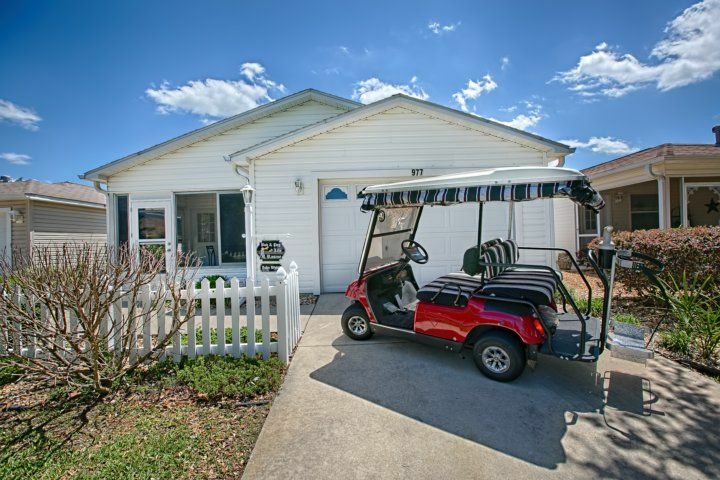 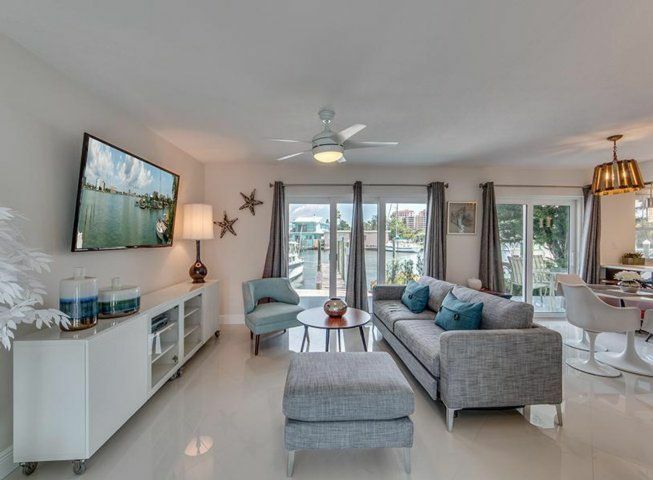 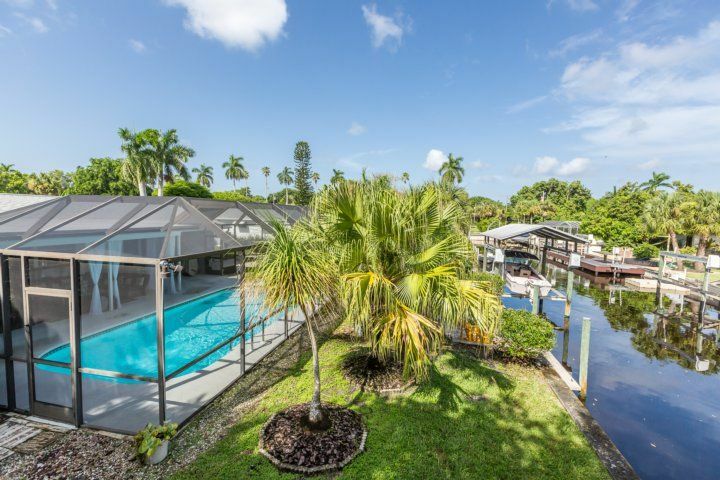 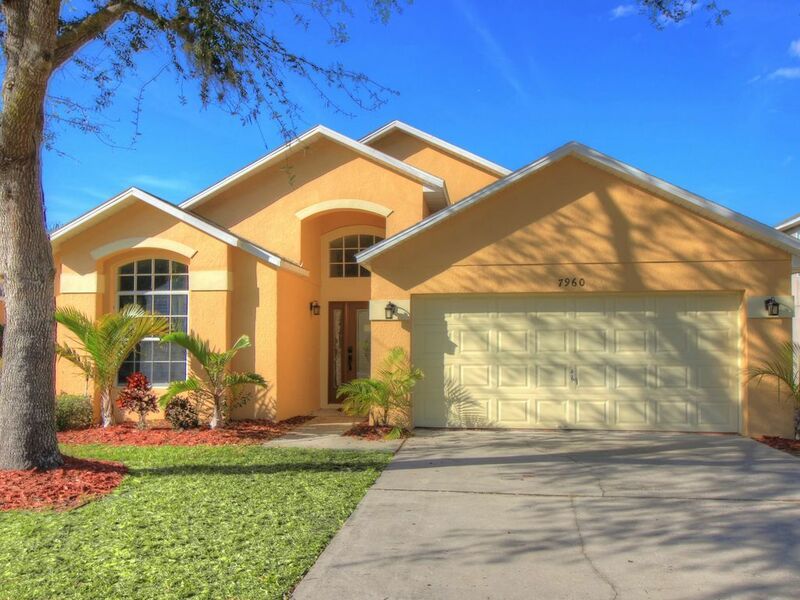 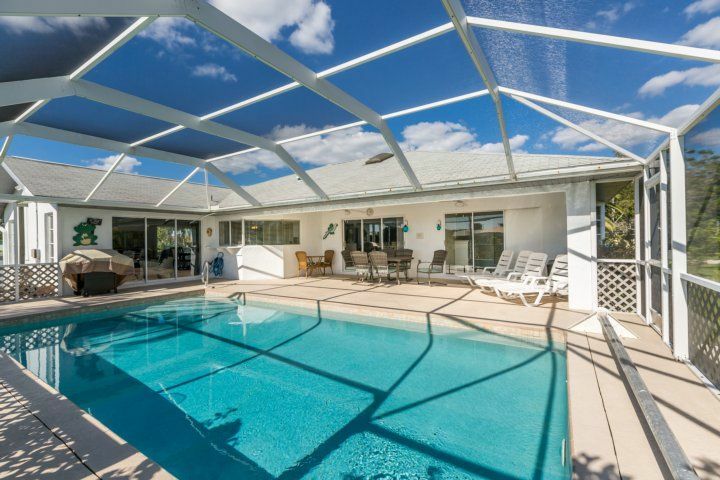 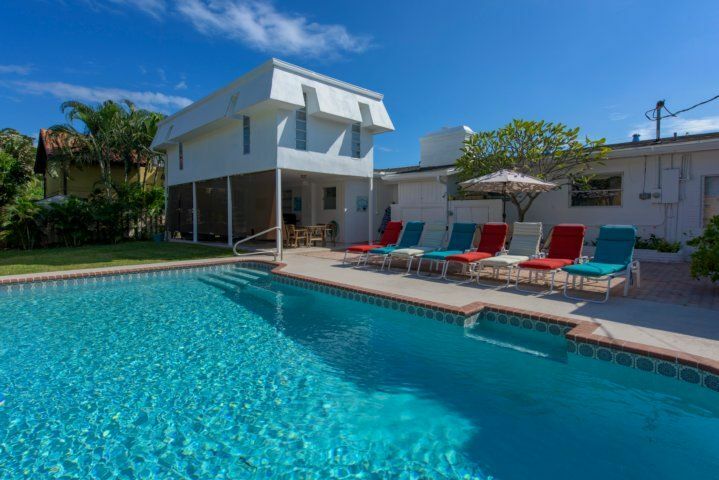 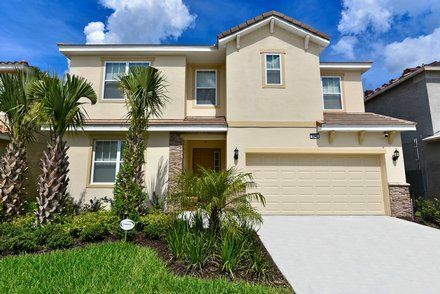 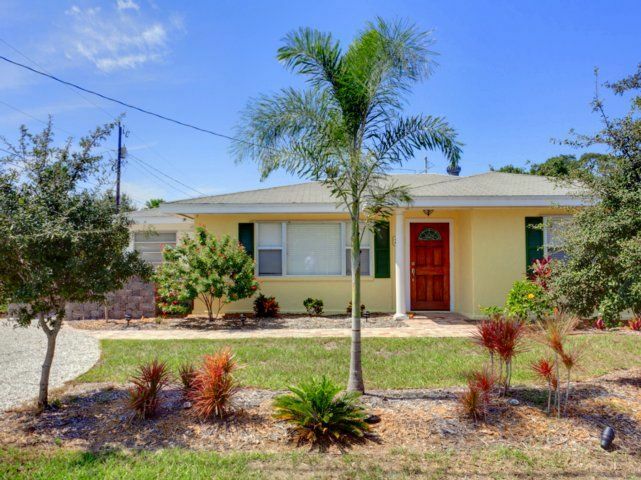 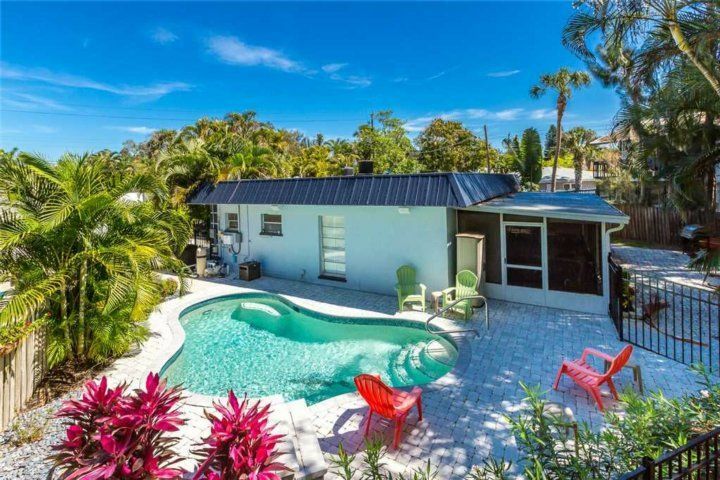 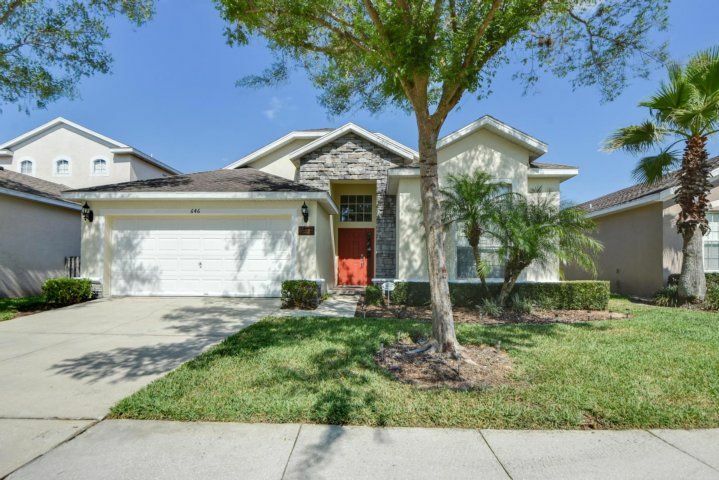 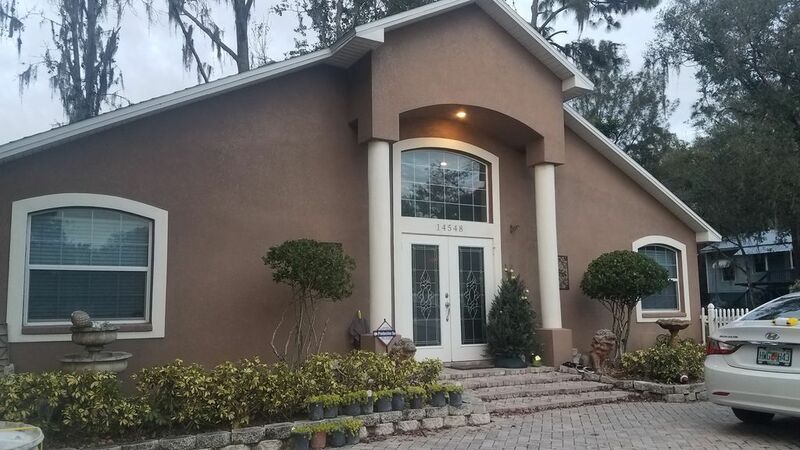 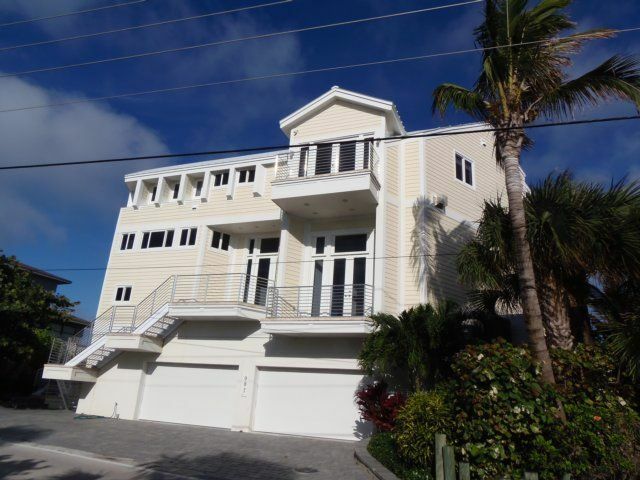 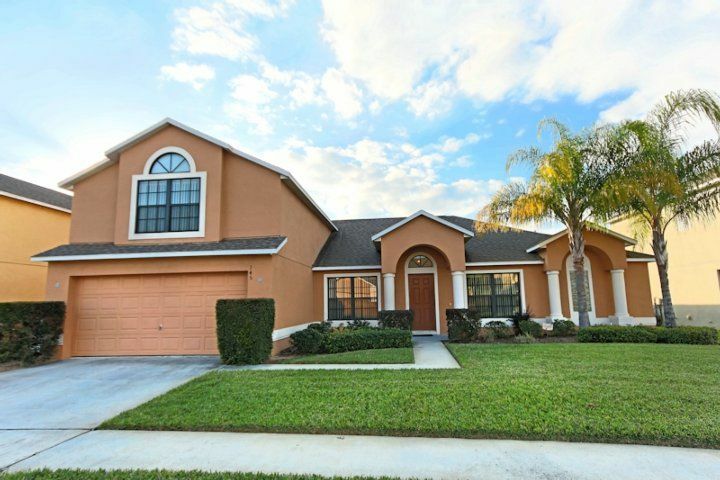 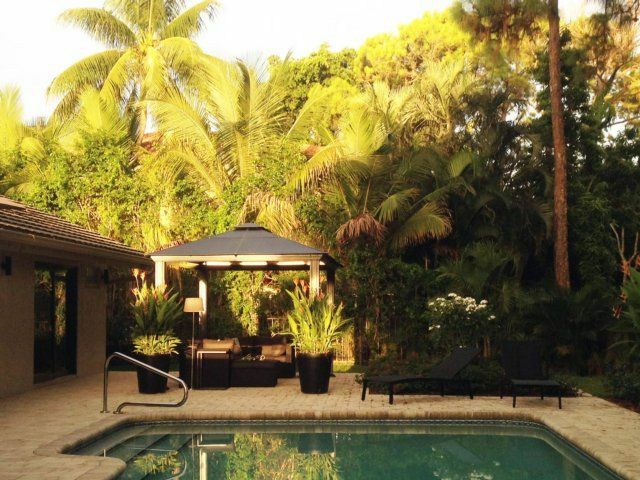 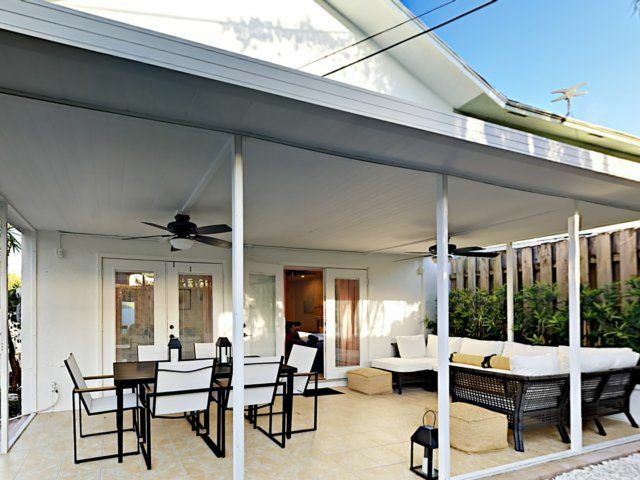 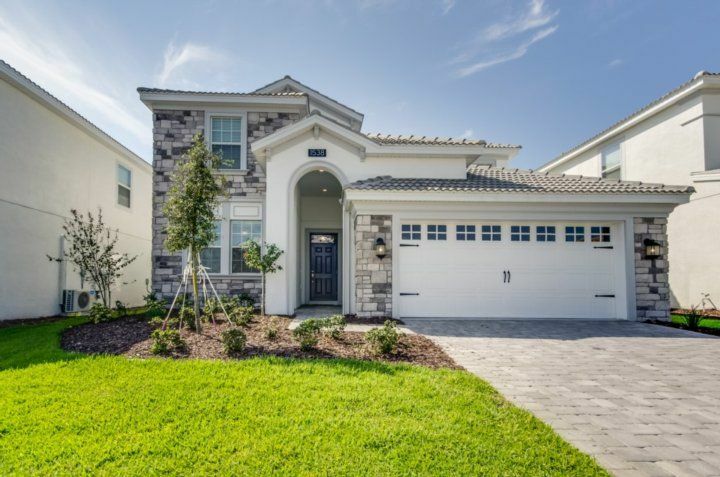 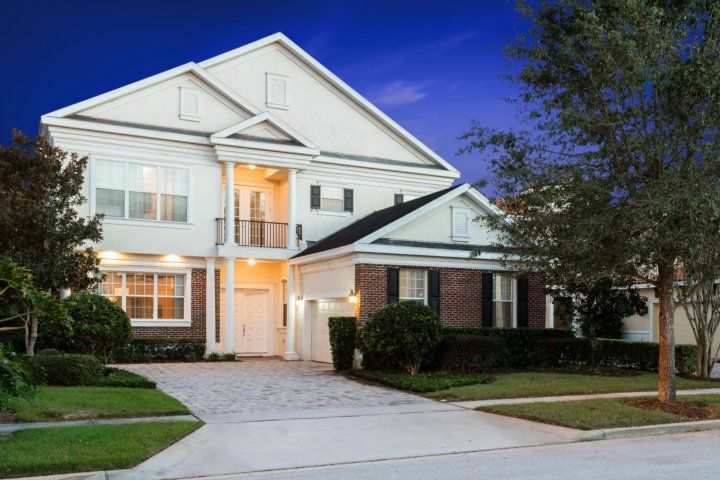 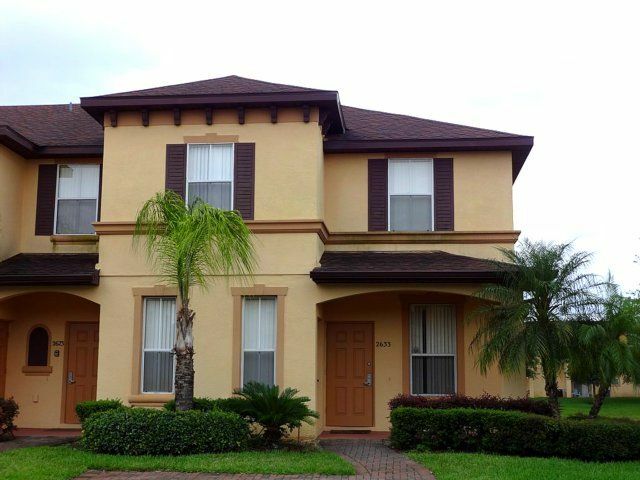 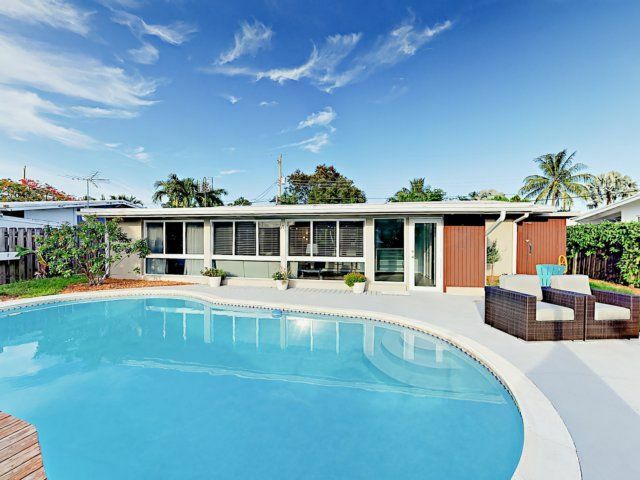 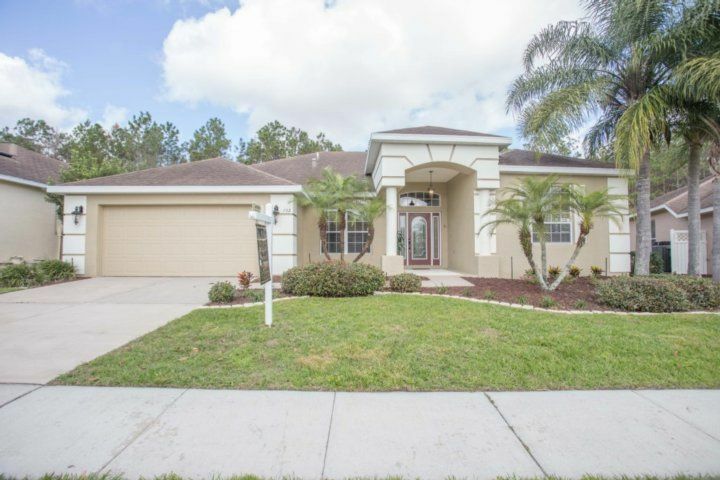 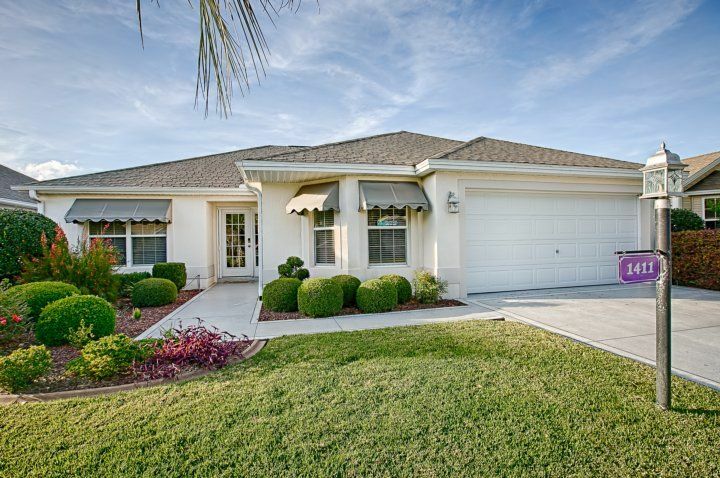 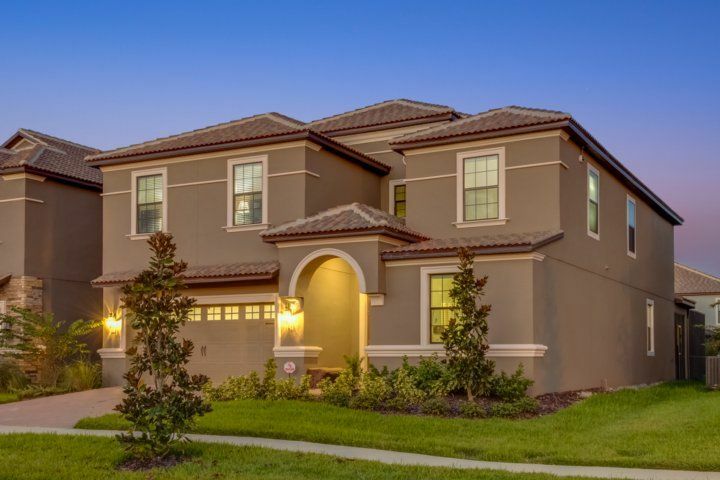 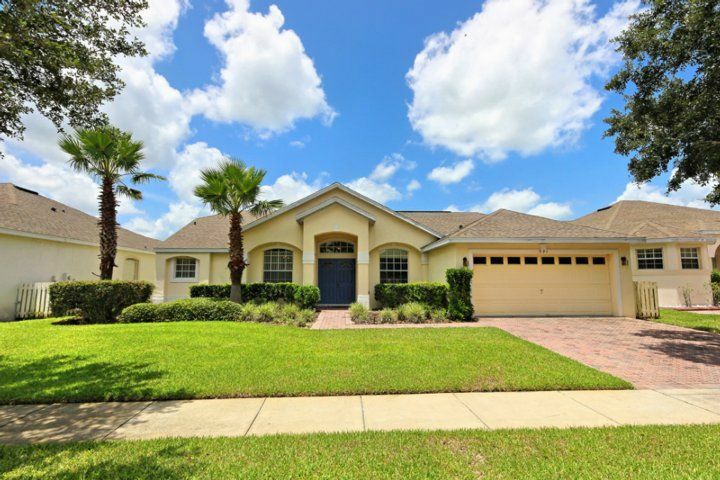 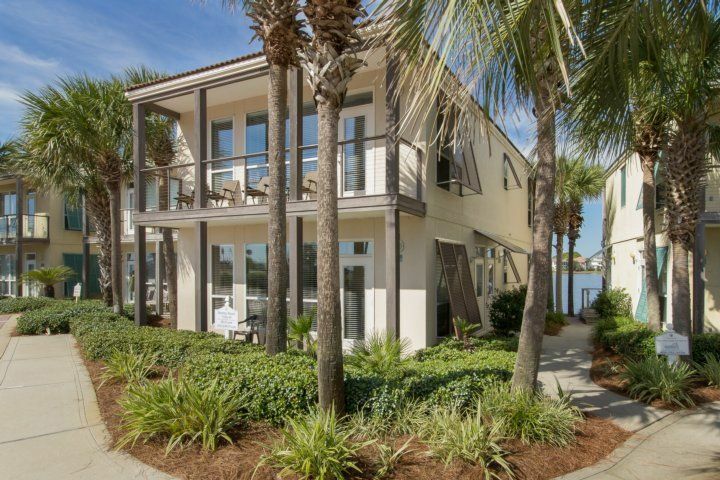 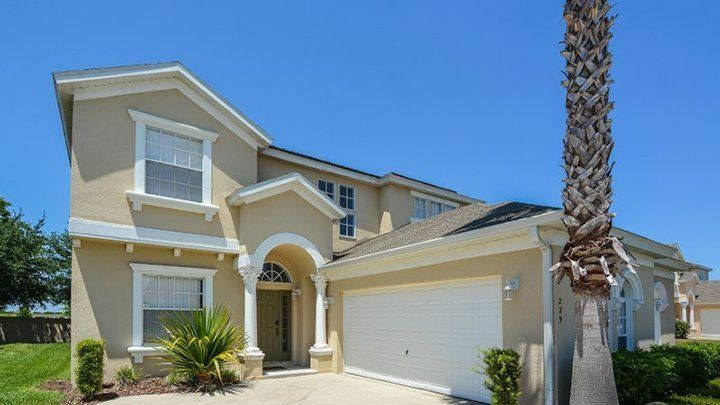 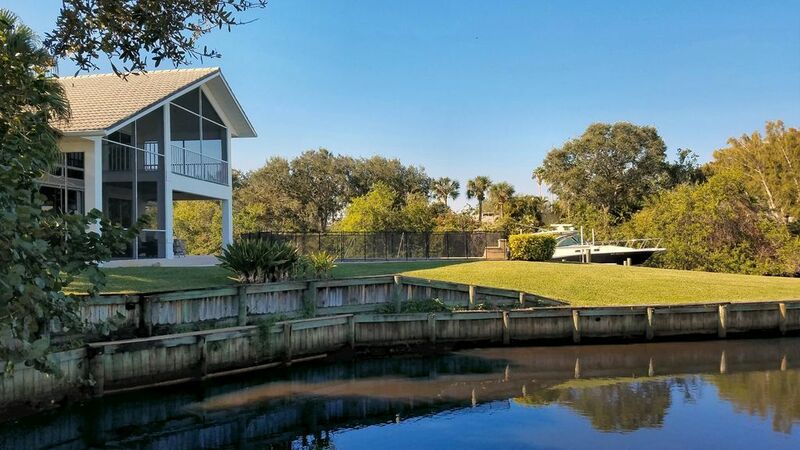 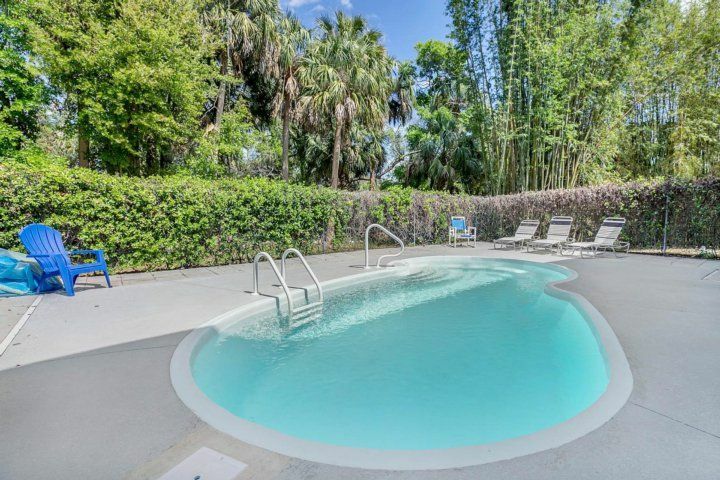 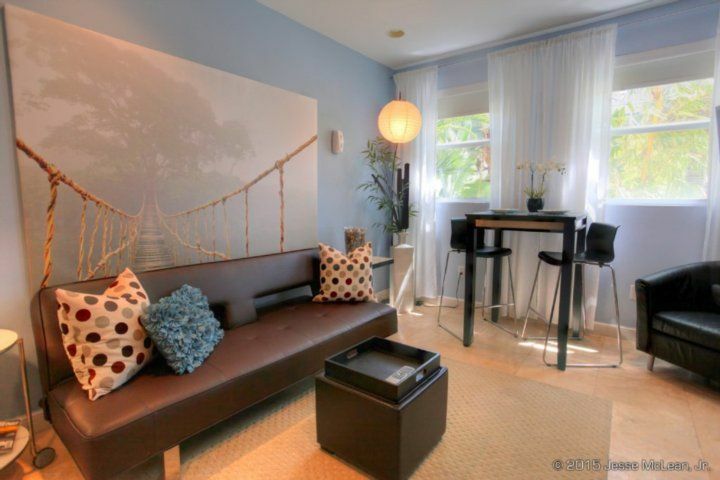 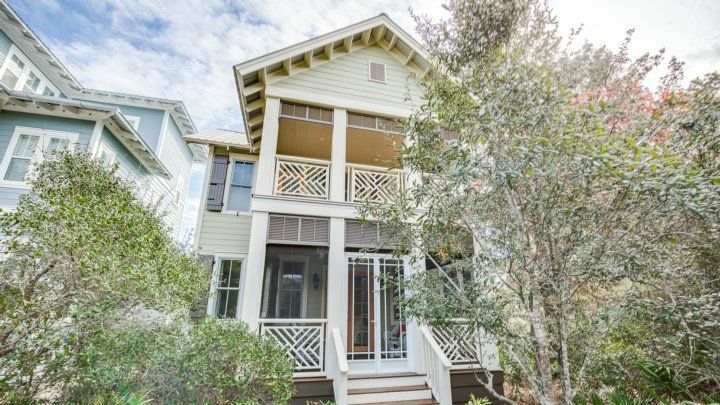 While Crescent Street’s location is reason enough to make it your Florida home away from home, the 3-bedroom retreat has numerous other charms too. 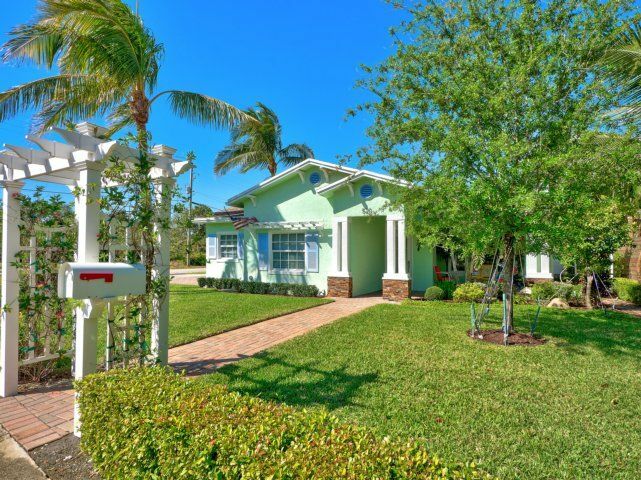 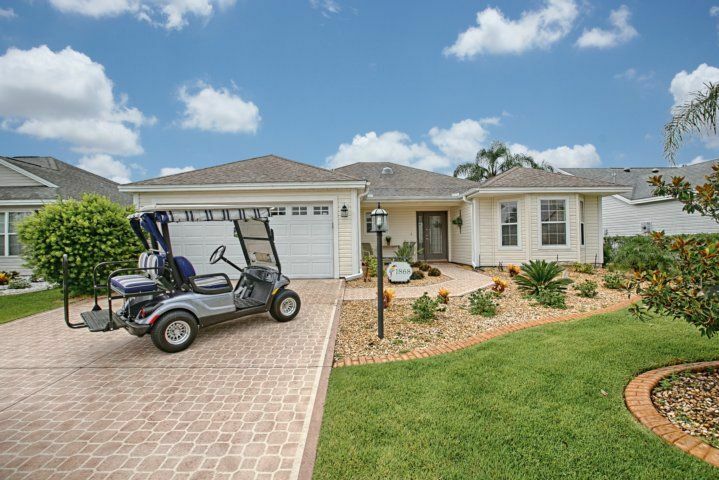 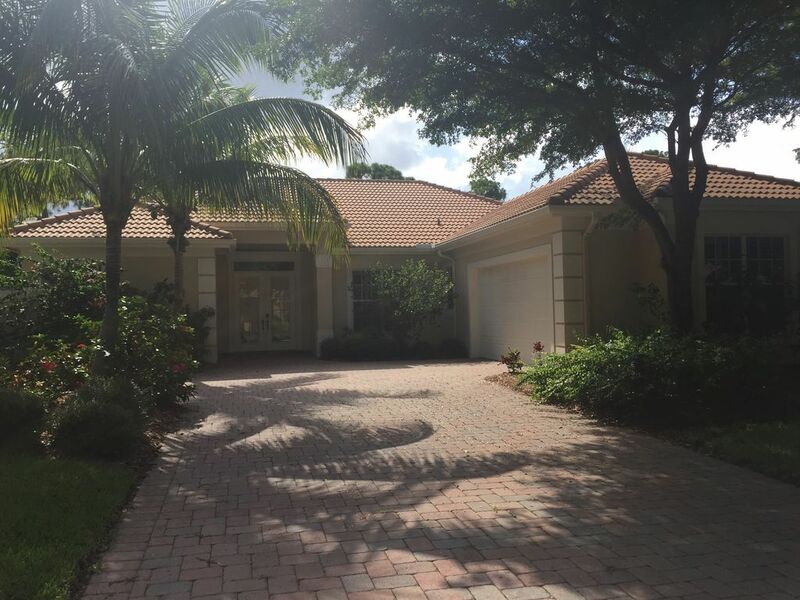 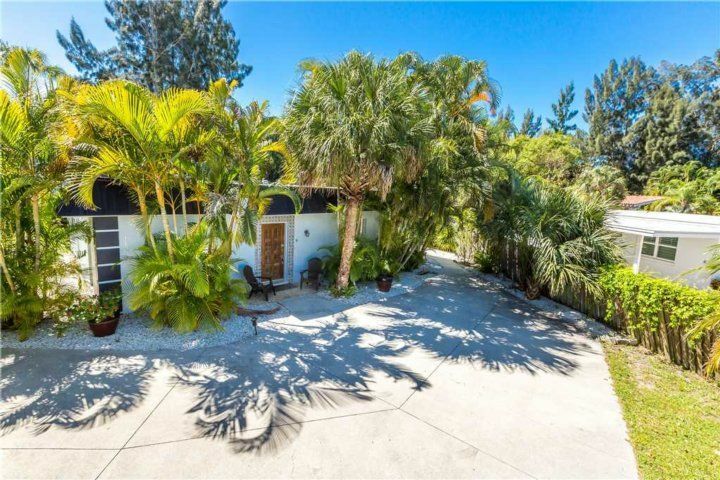 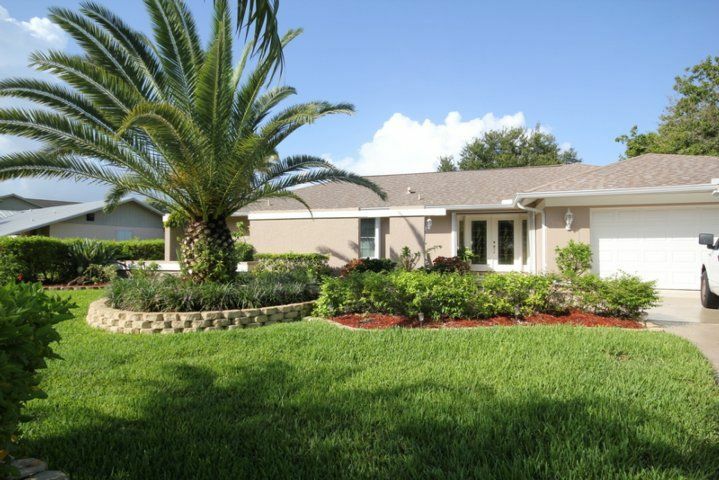 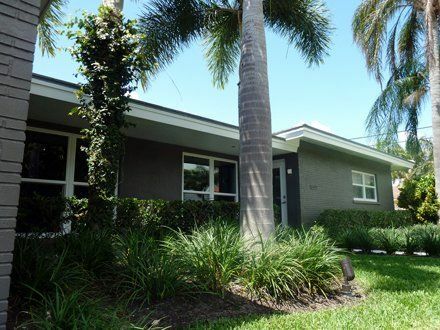 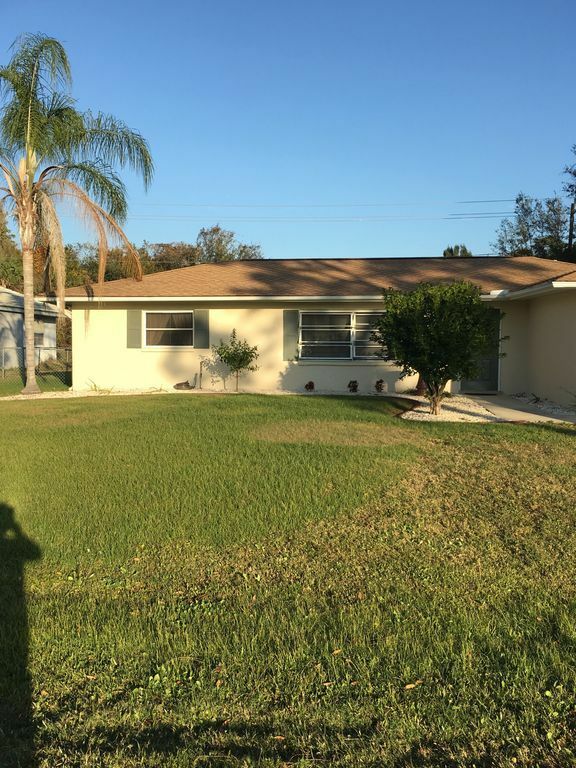 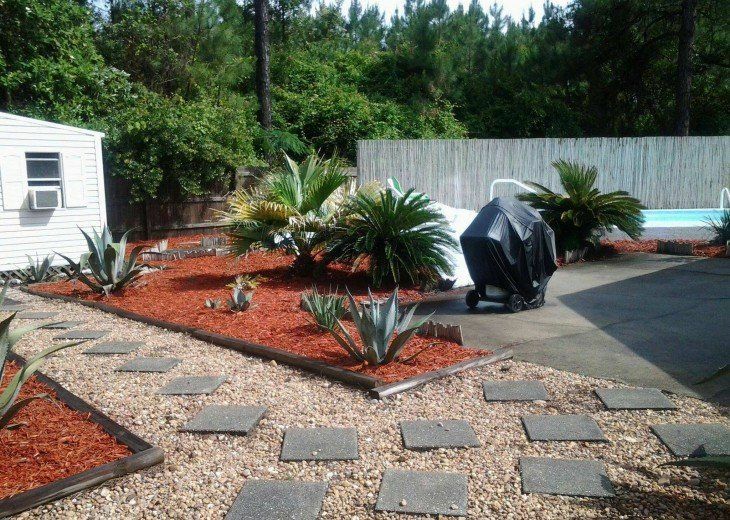 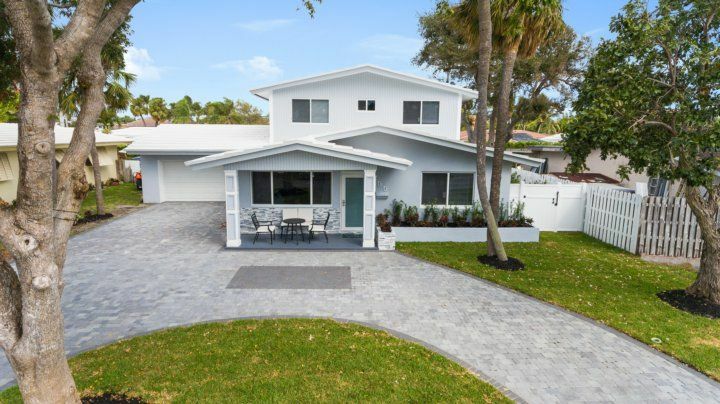 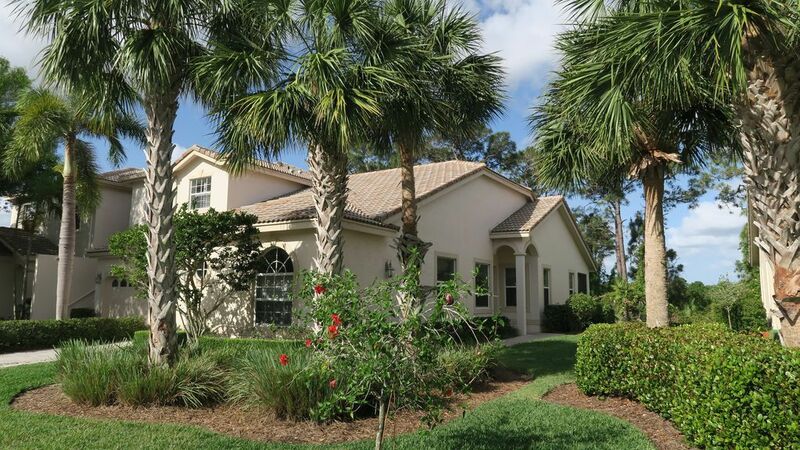 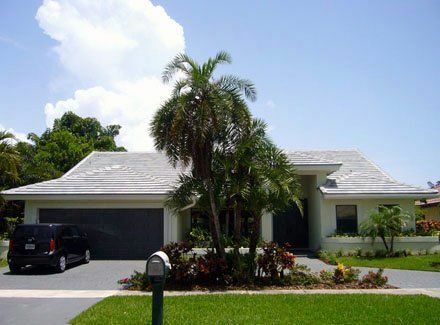 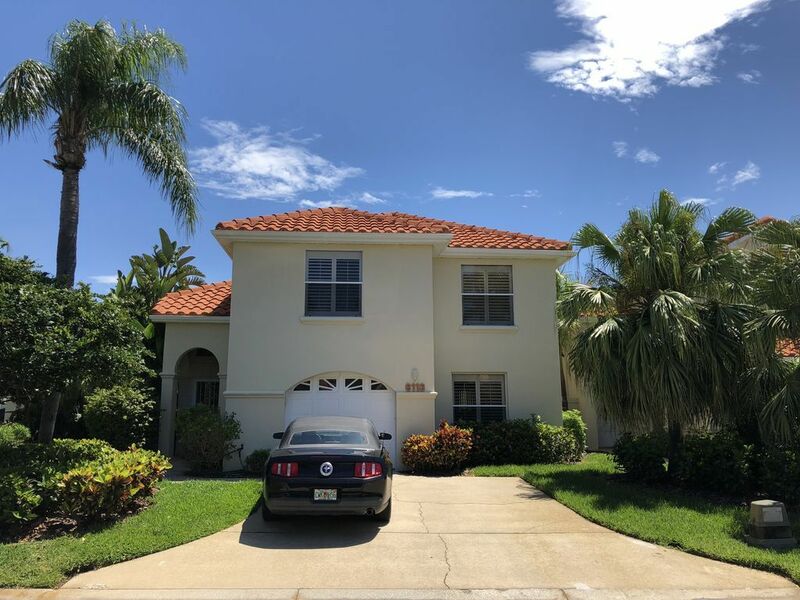 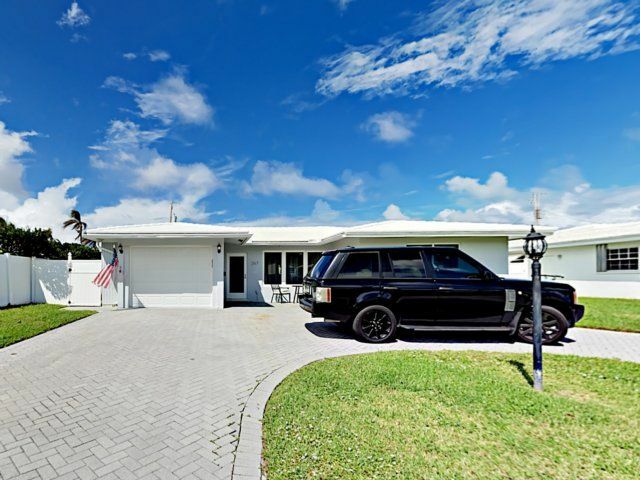 As soon as you drive up to the house, you’ll be won over by the leafy palm trees and well-manicured grounds (not to mention the ample parking). 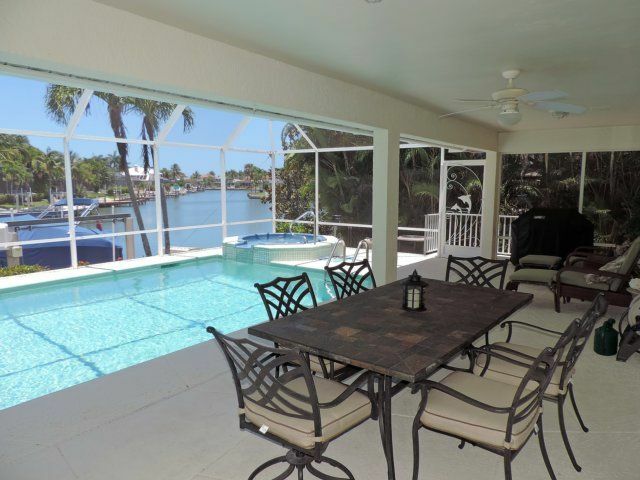 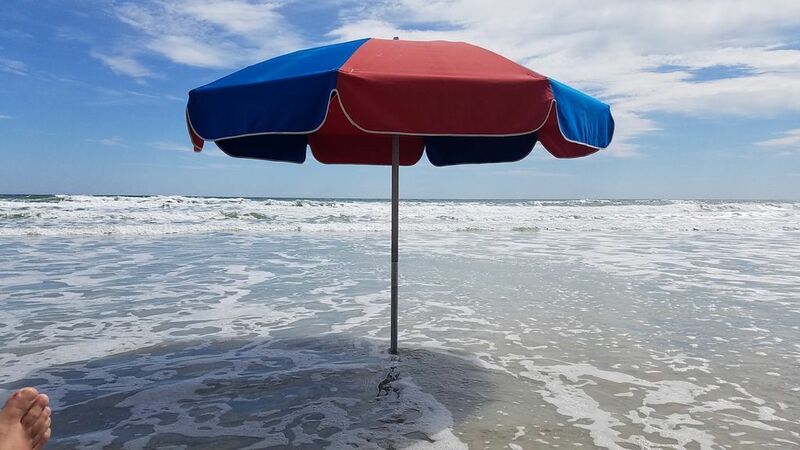 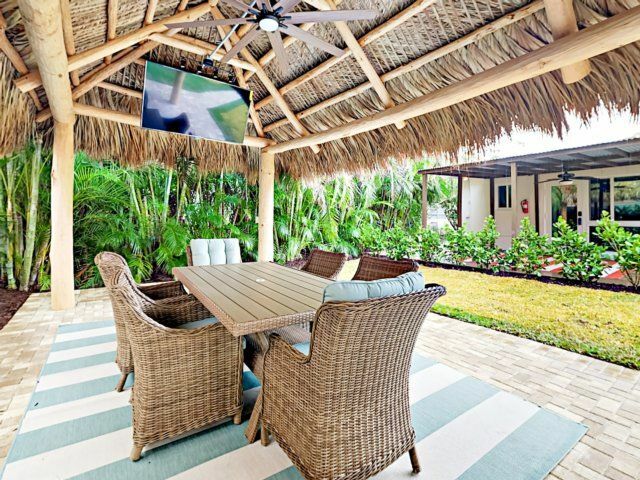 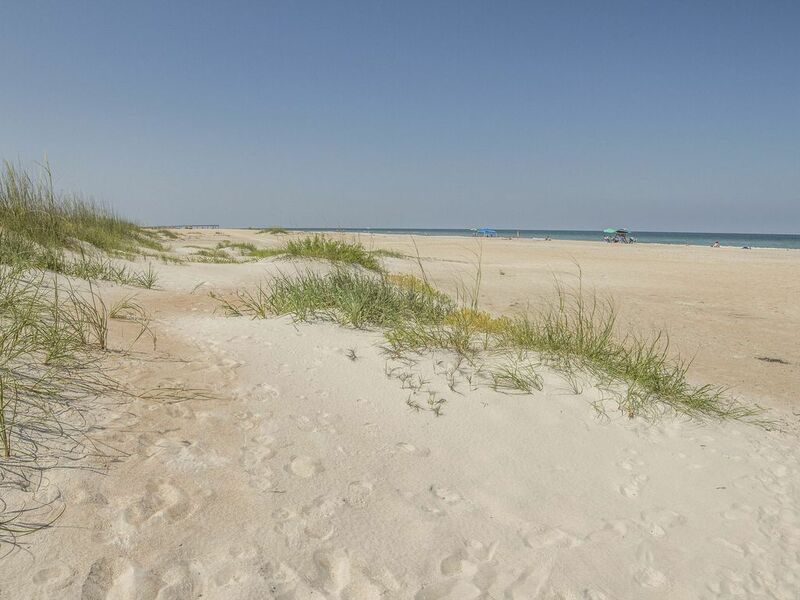 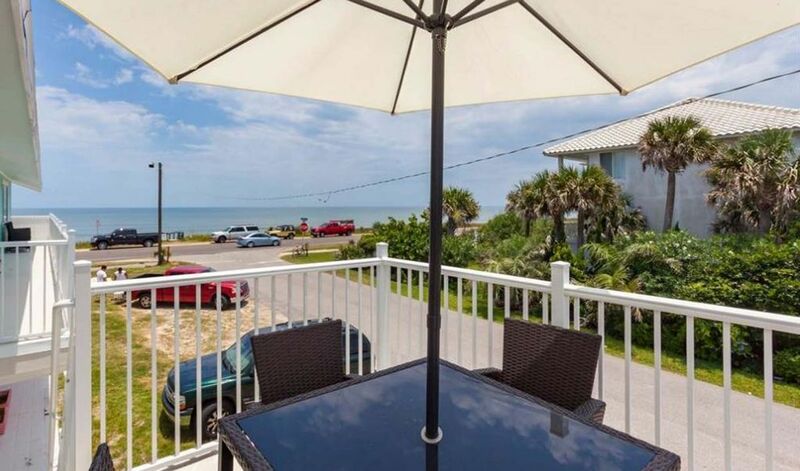 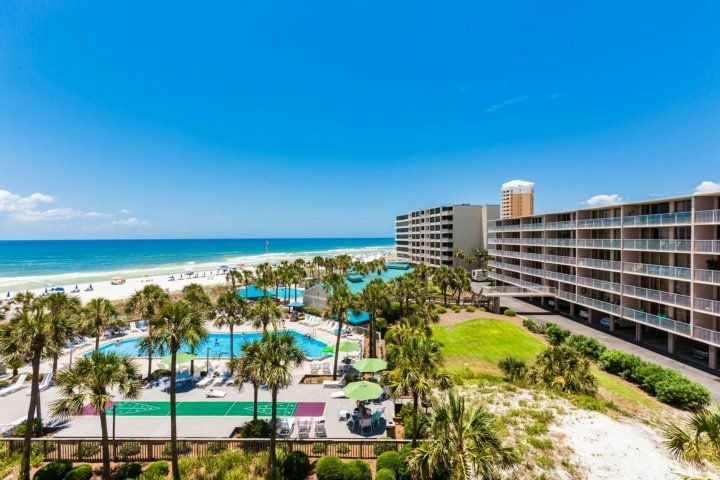 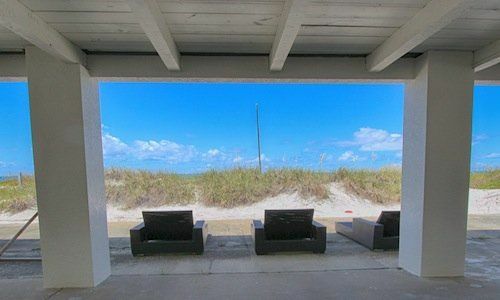 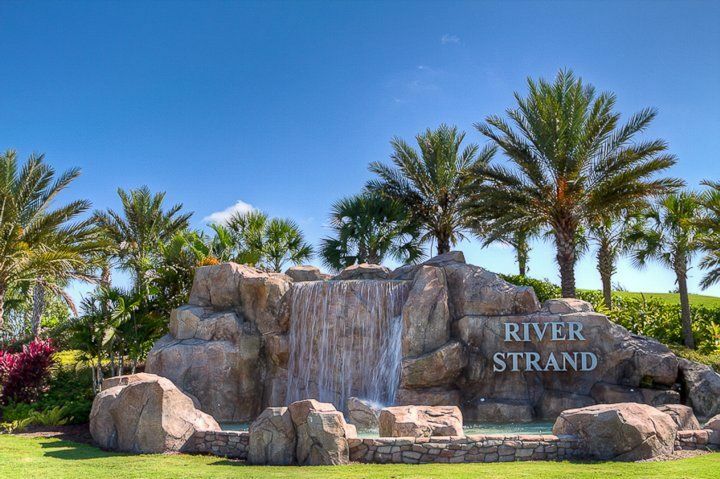 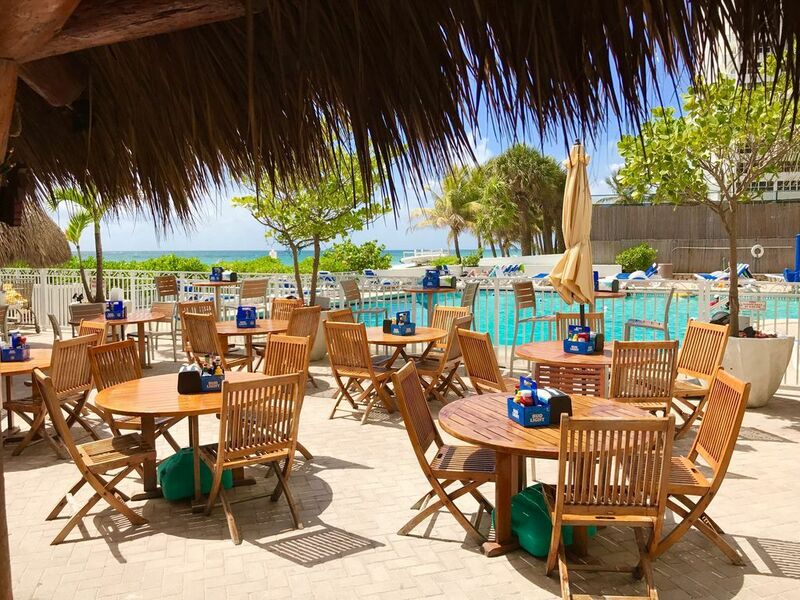 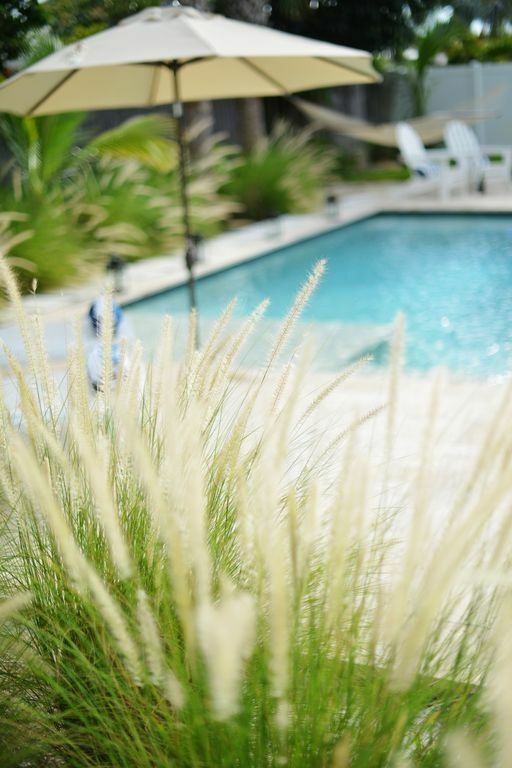 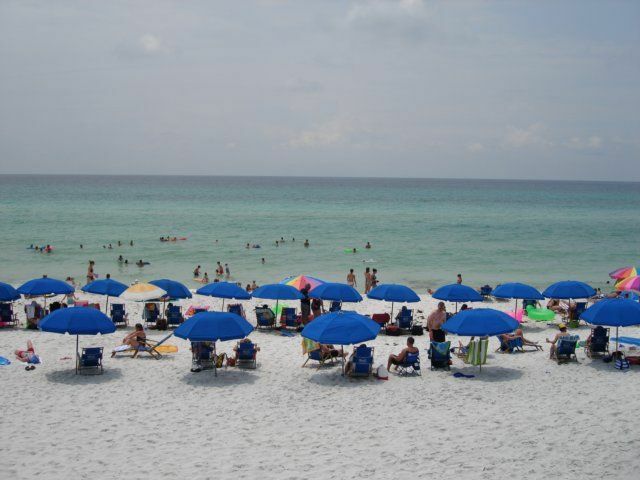 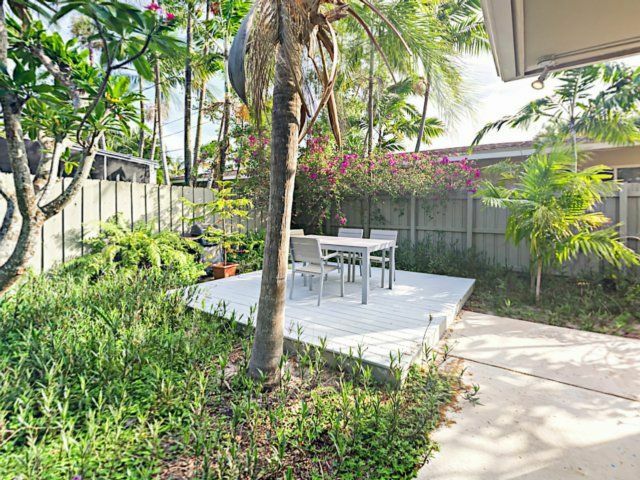 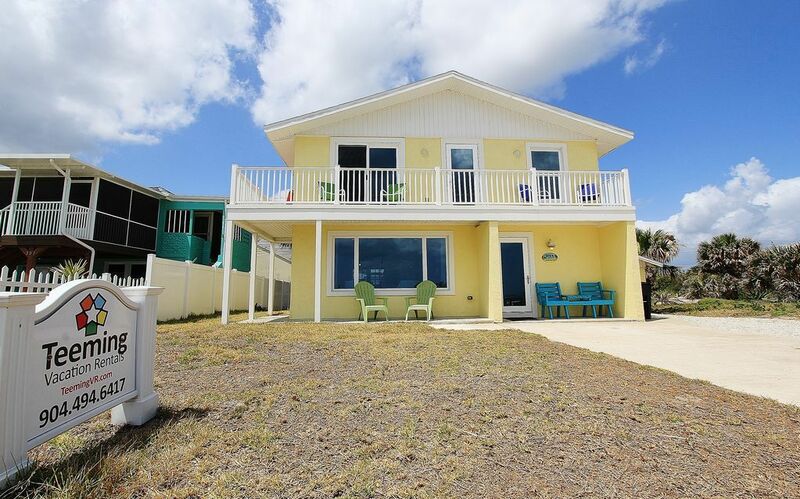 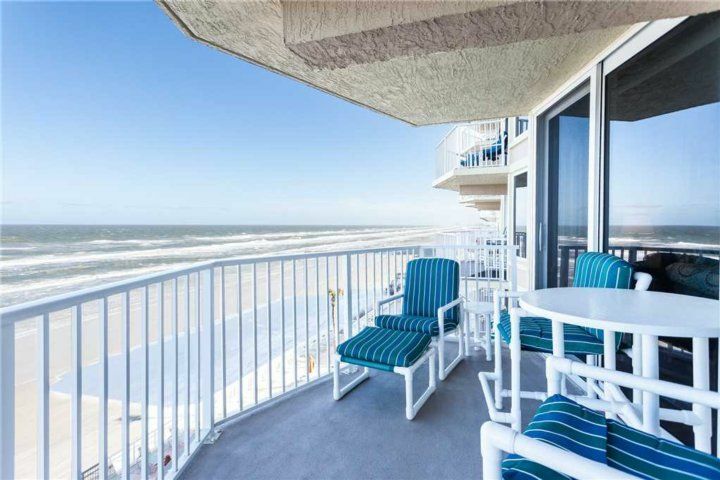 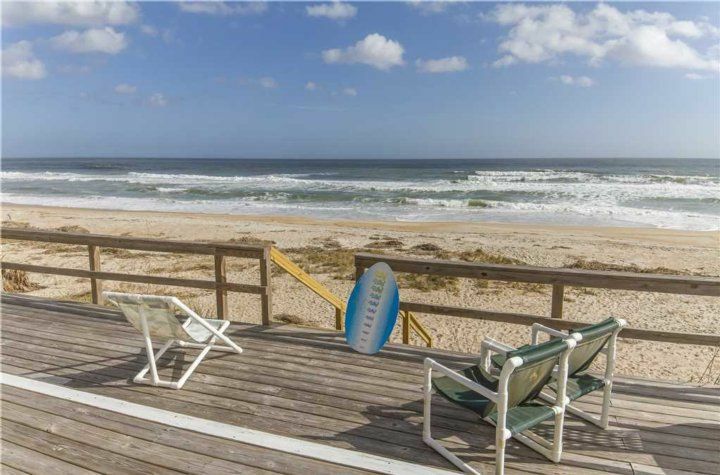 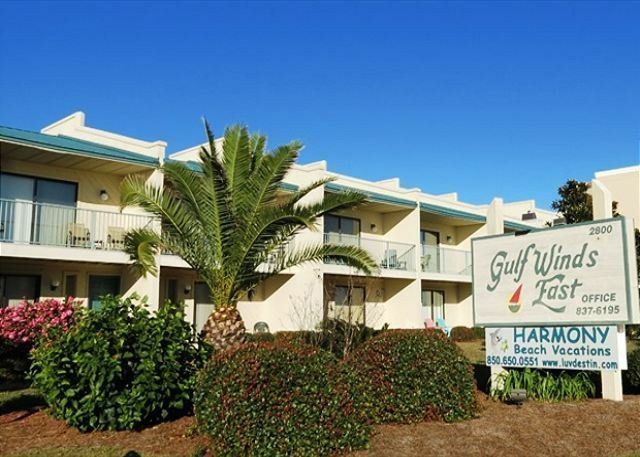 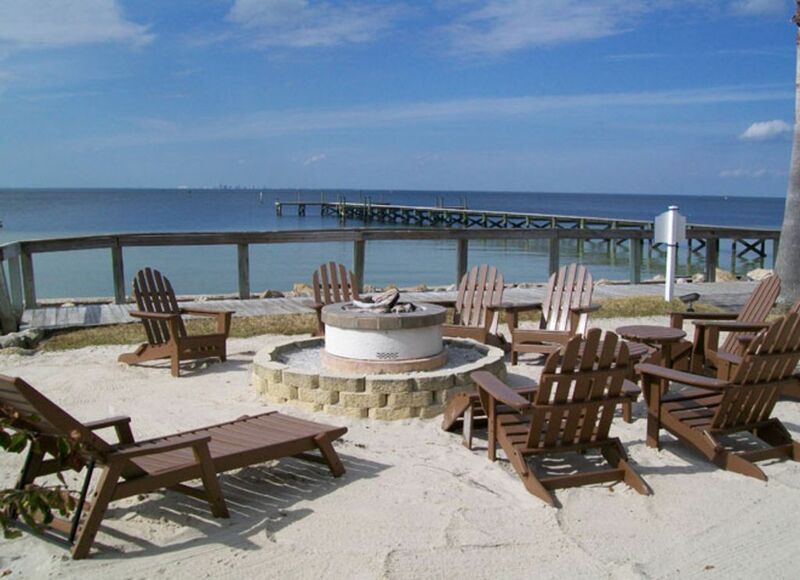 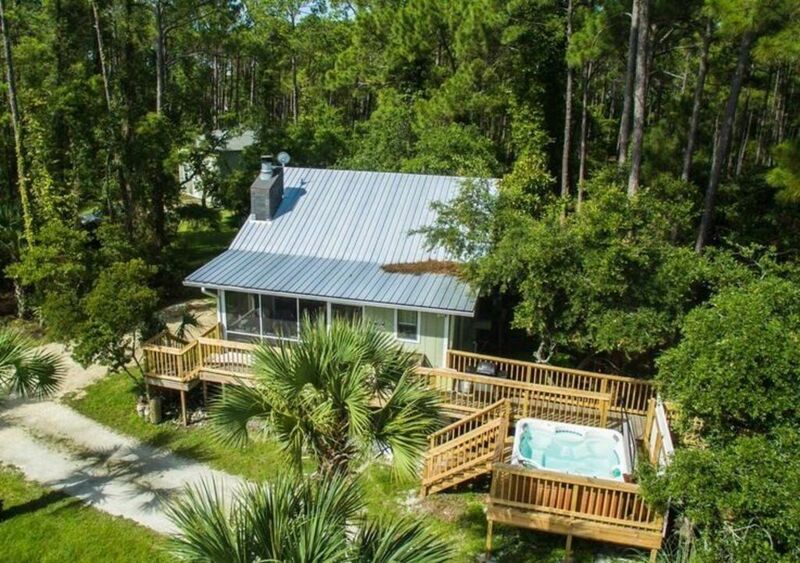 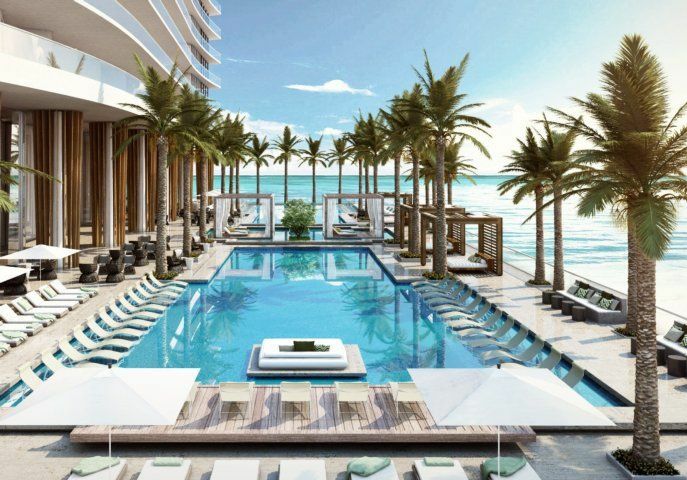 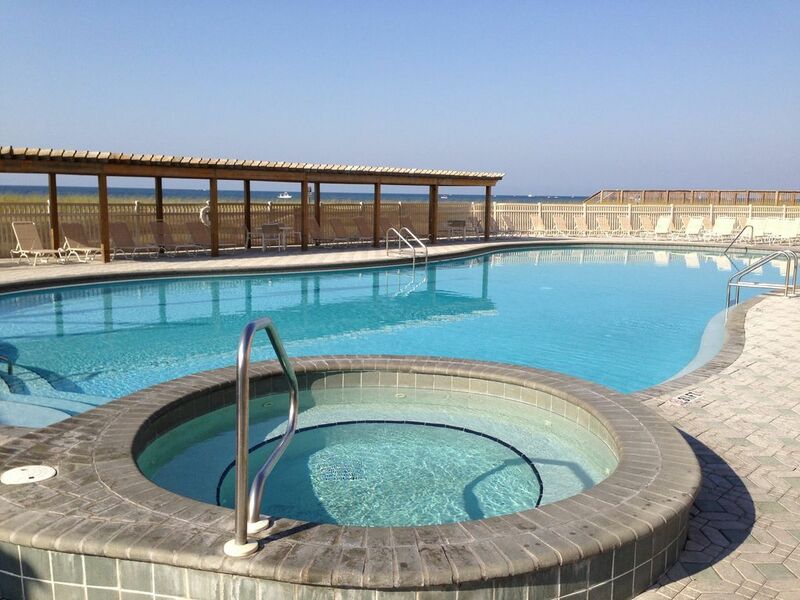 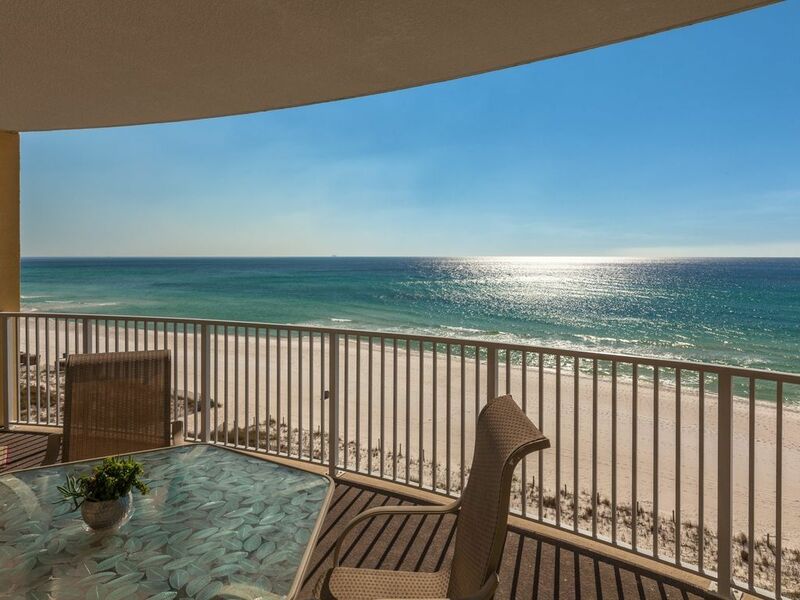 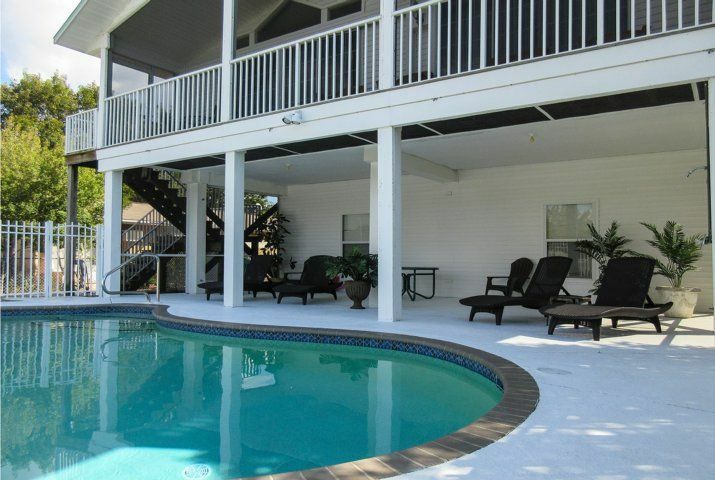 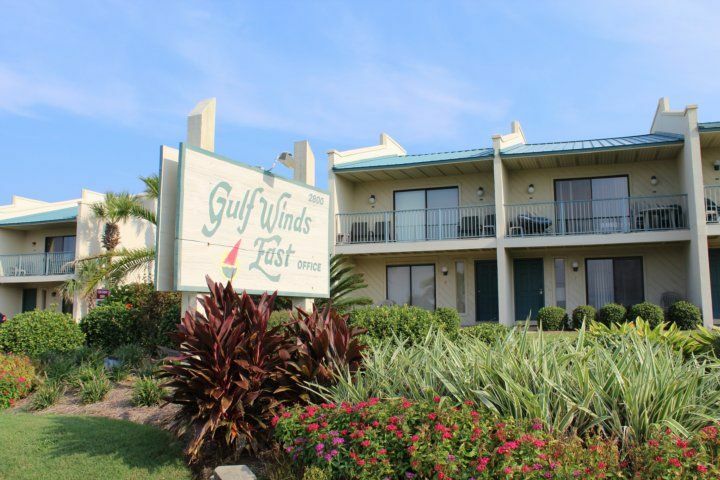 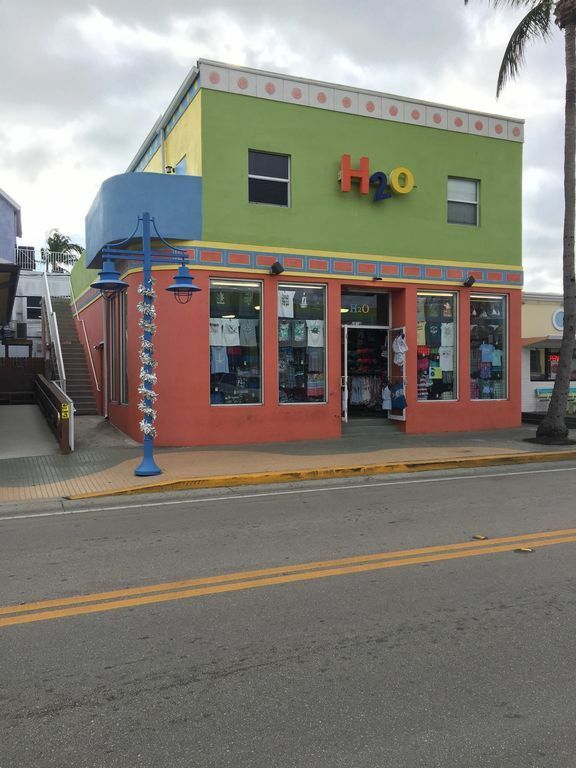 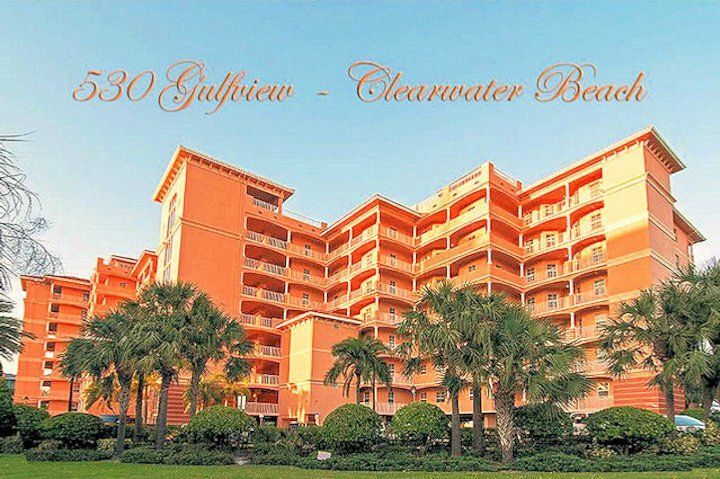 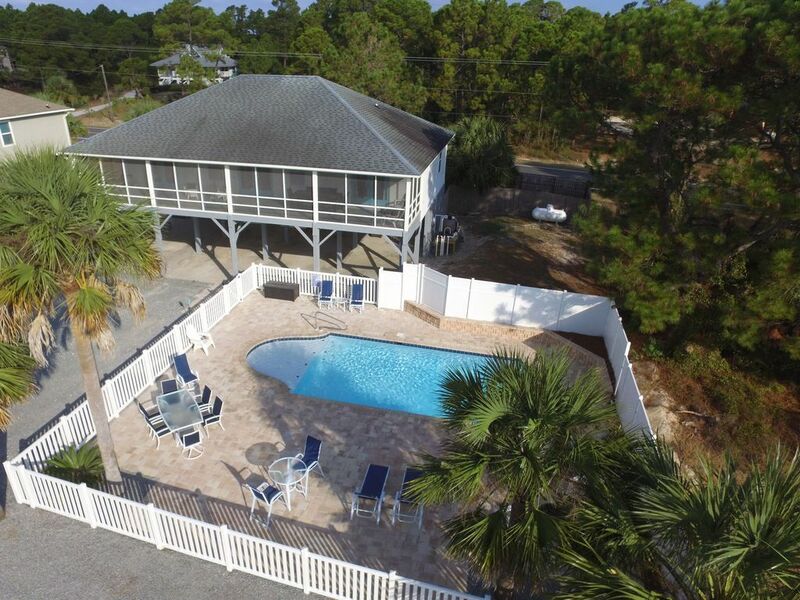 Head around to the back and you’ll find a beautifully paved area with a charcoal grill, plenty of chairs and a table for alfresco dining, and perhaps best of all, a heated in-ground pool, just in case the gulf waters are a little too chilly for your liking. 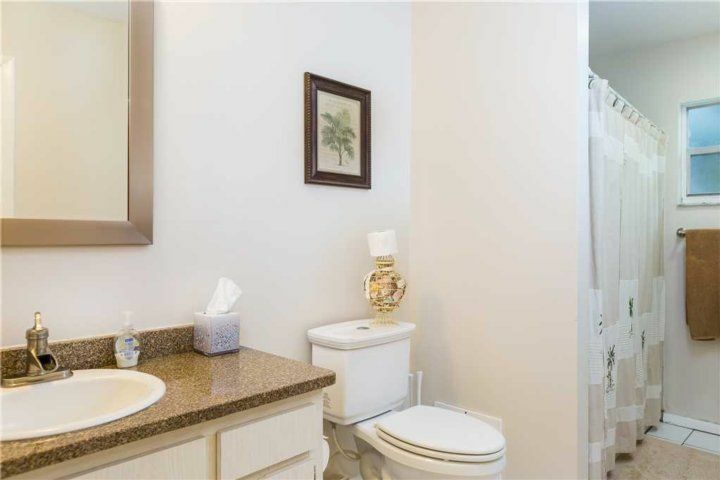 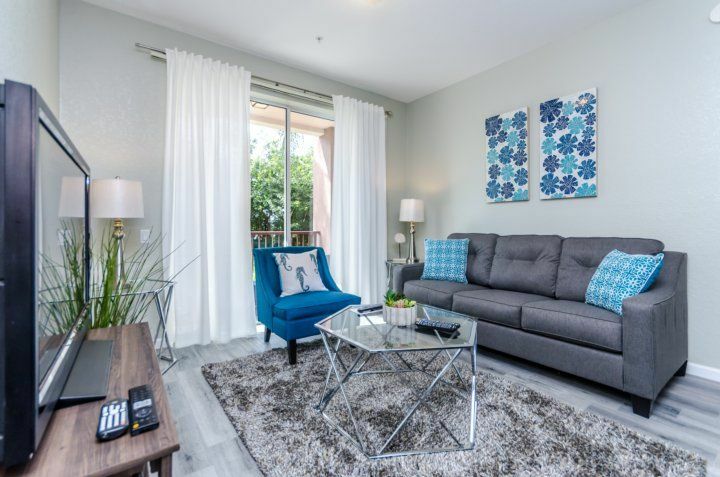 And because Crescent Street Manor is a duplex comprised of a 2 bedroom unit and a 1 bedroom unit, you can have privacy, while still being able to spend time with your travelling companions. 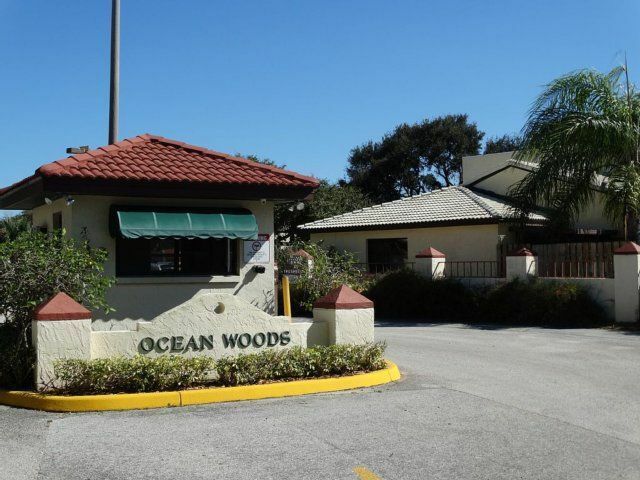 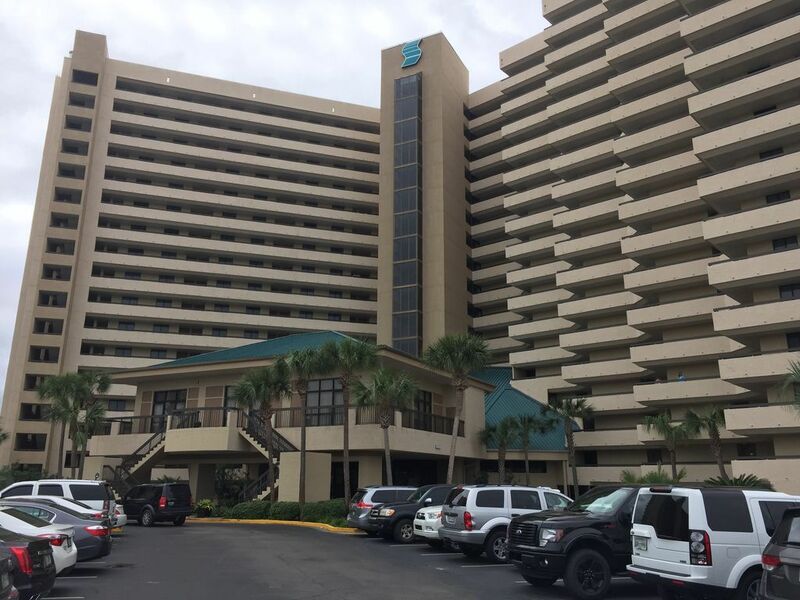 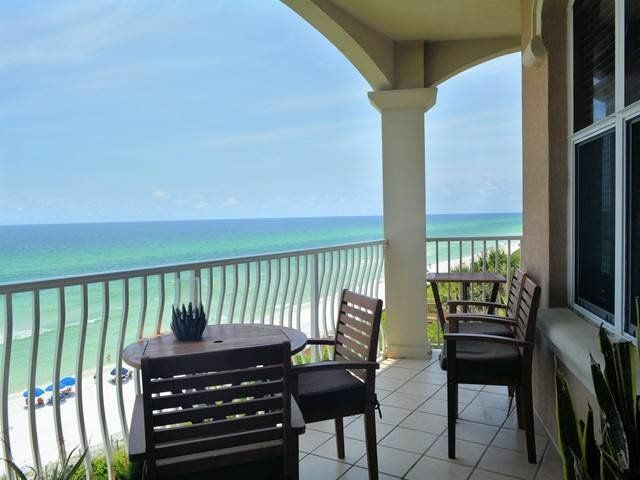 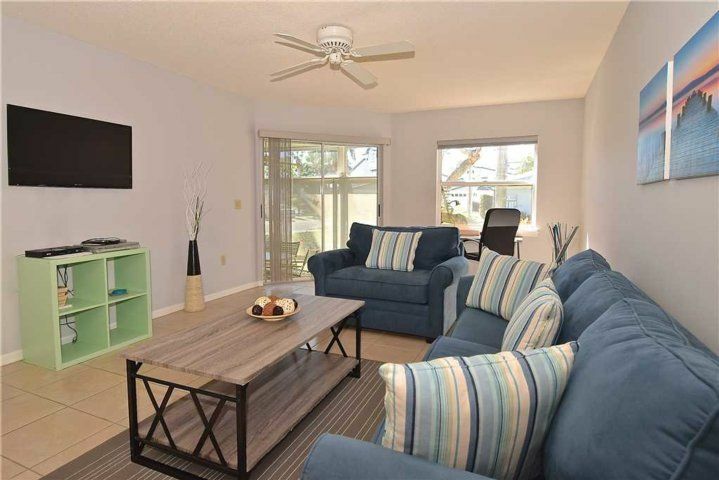 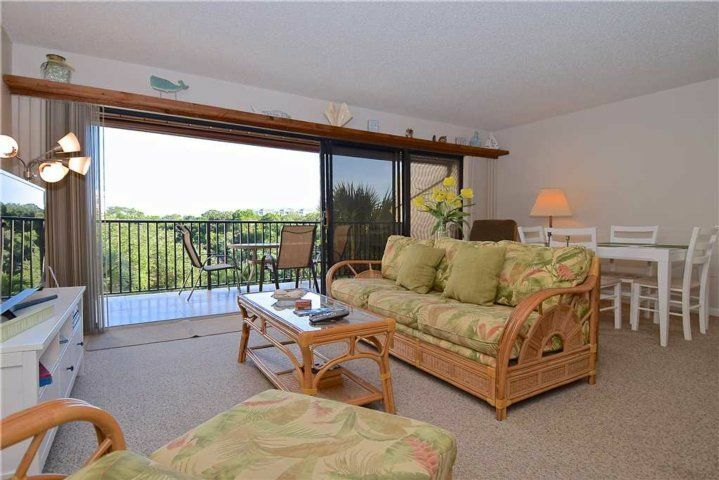 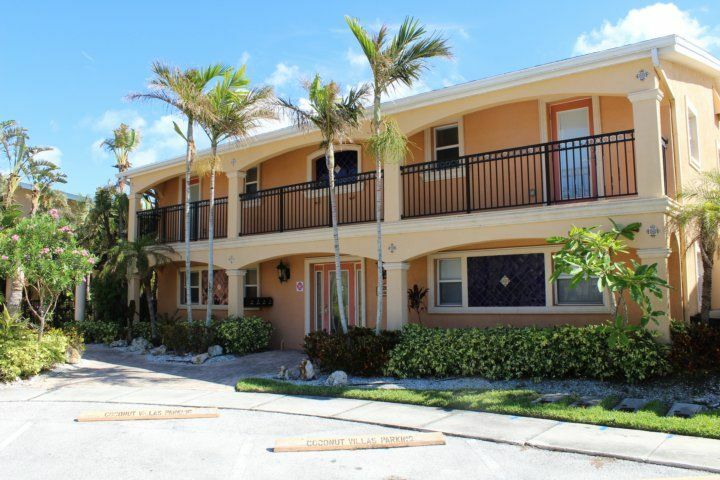 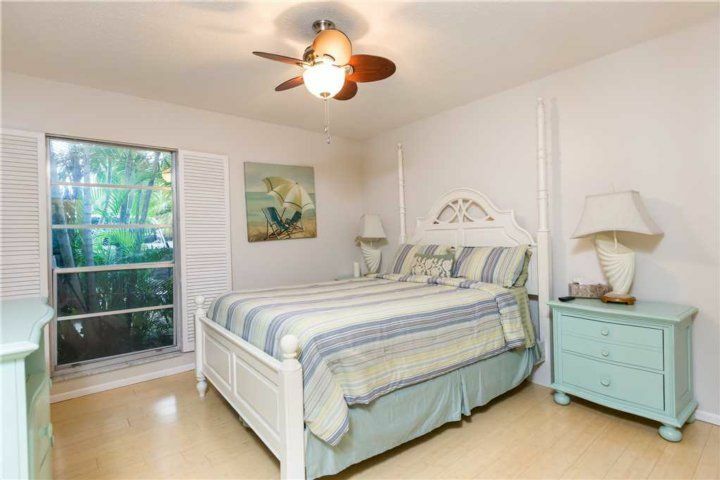 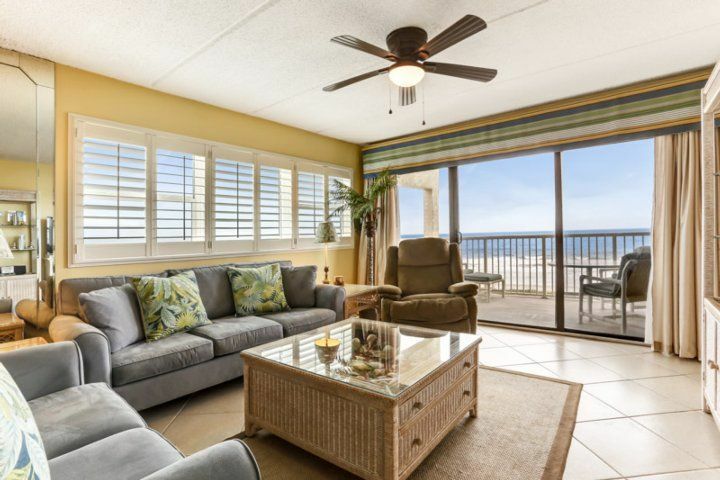 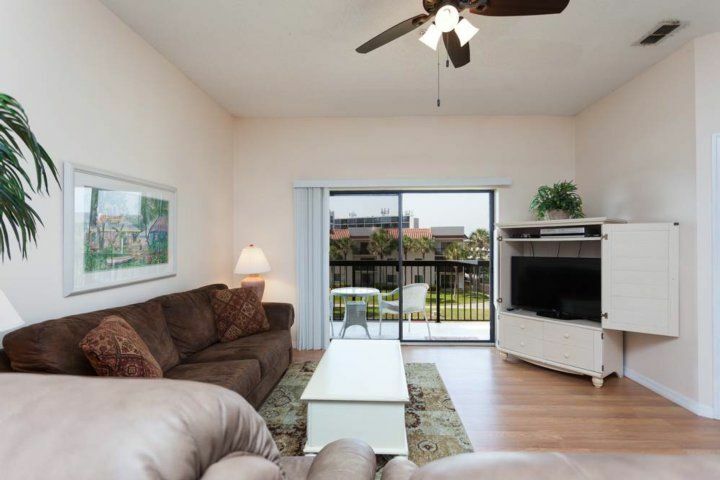 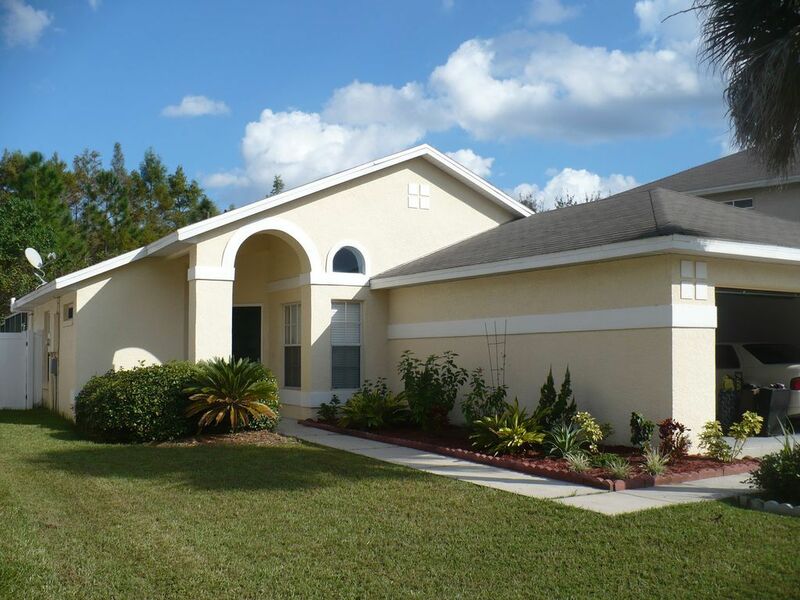 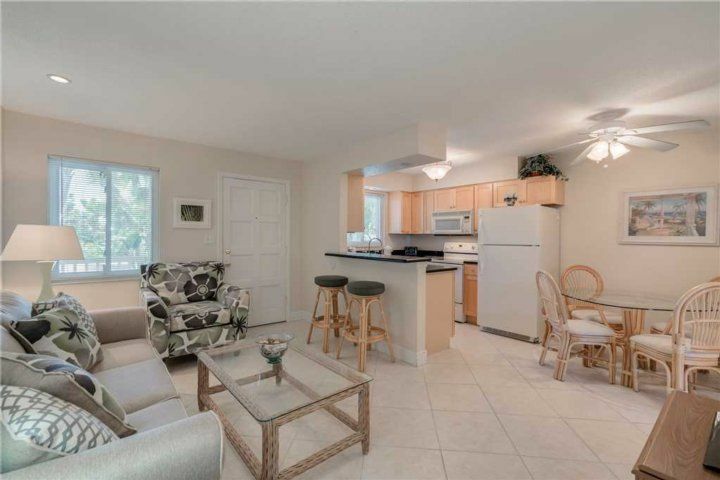 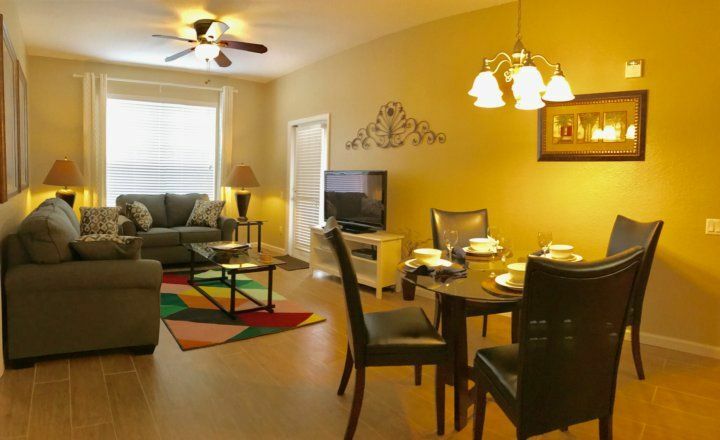 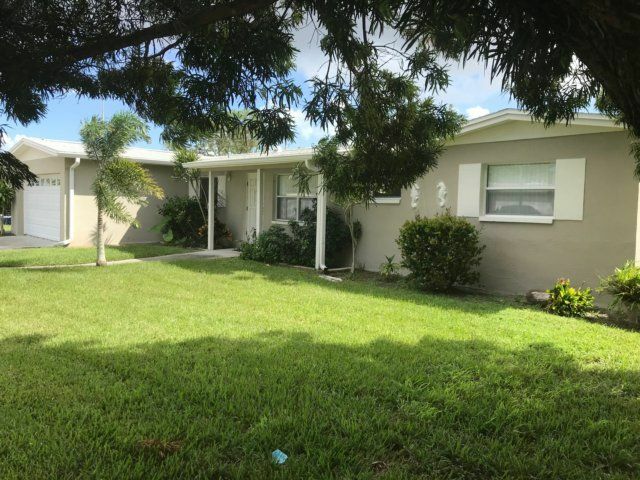 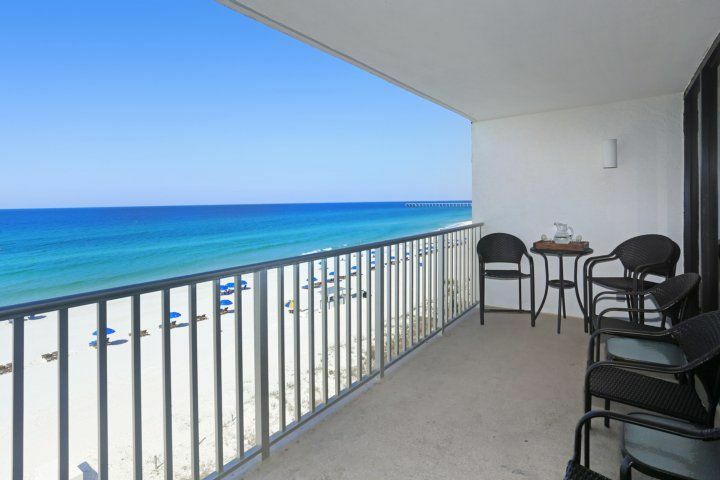 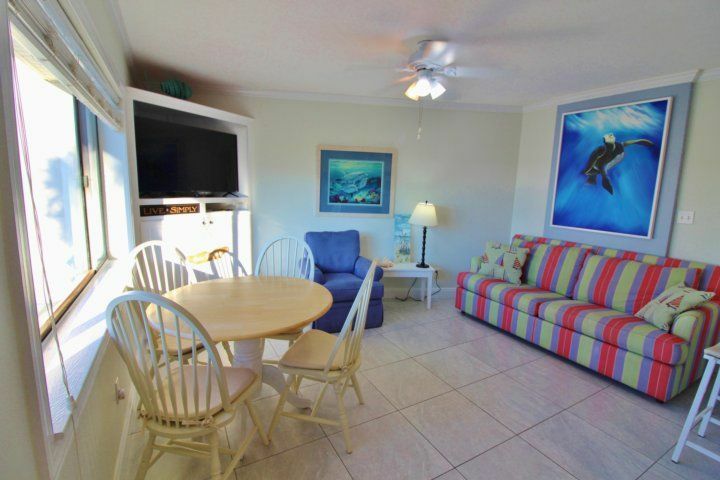 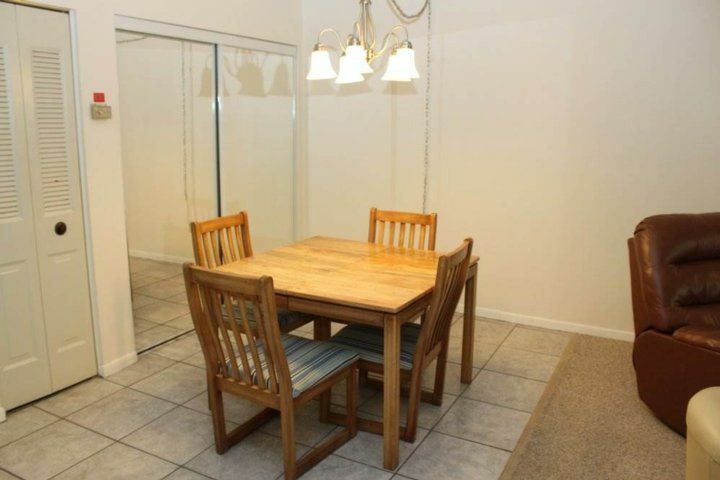 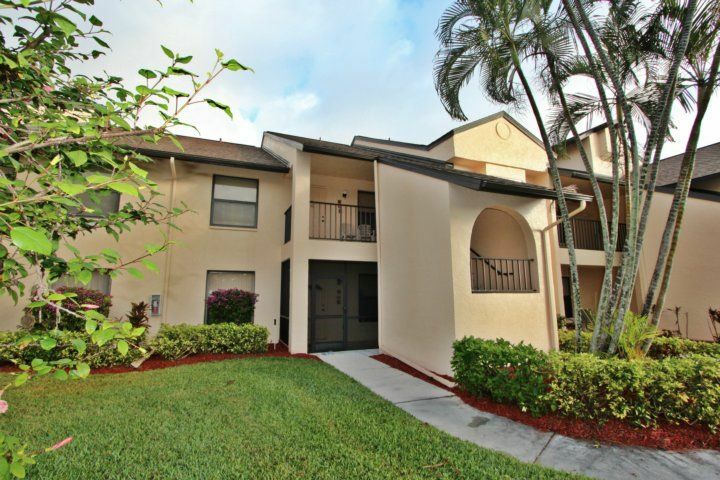 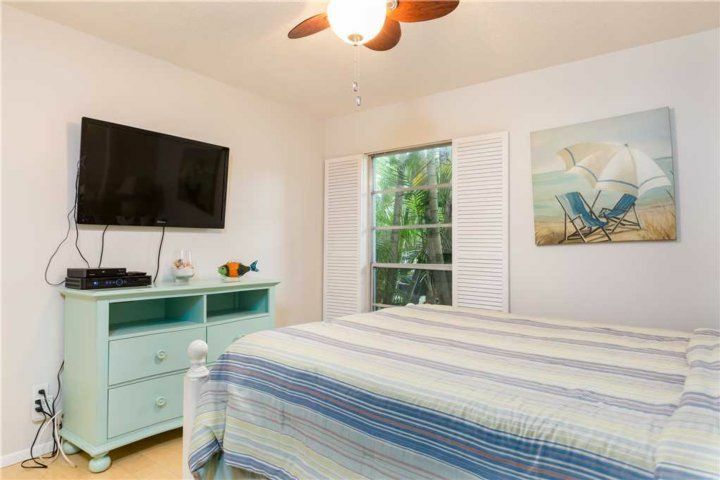 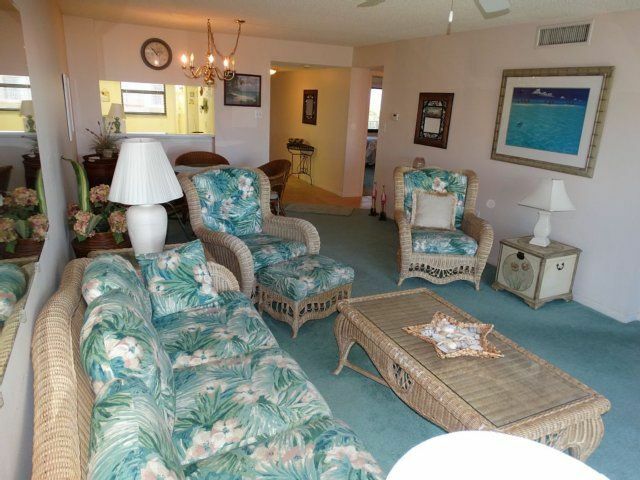 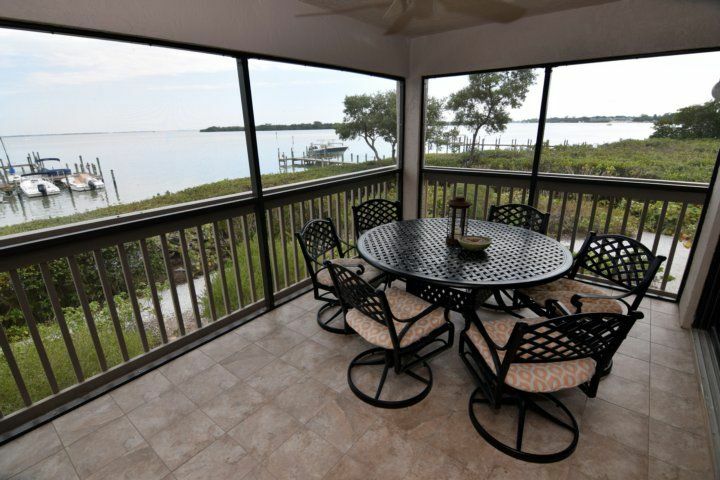 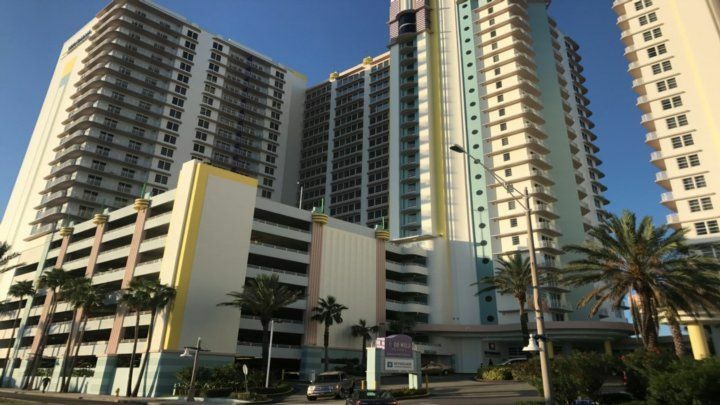 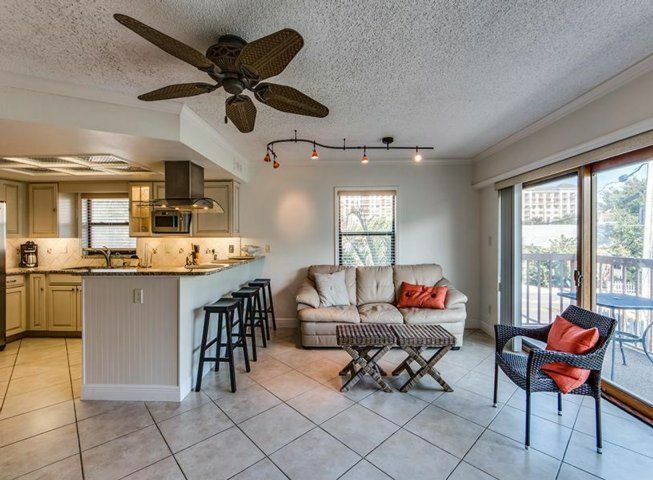 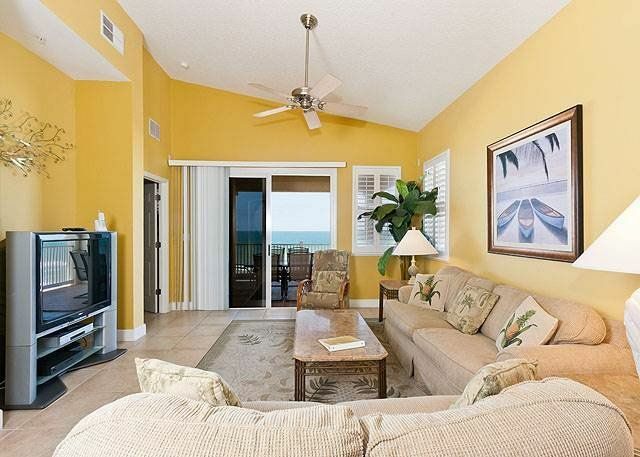 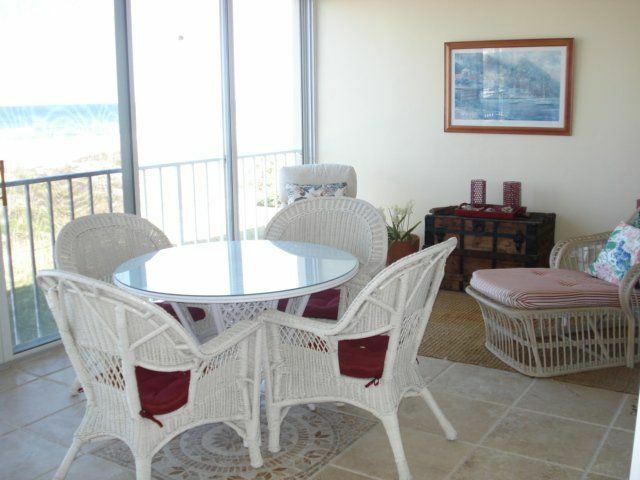 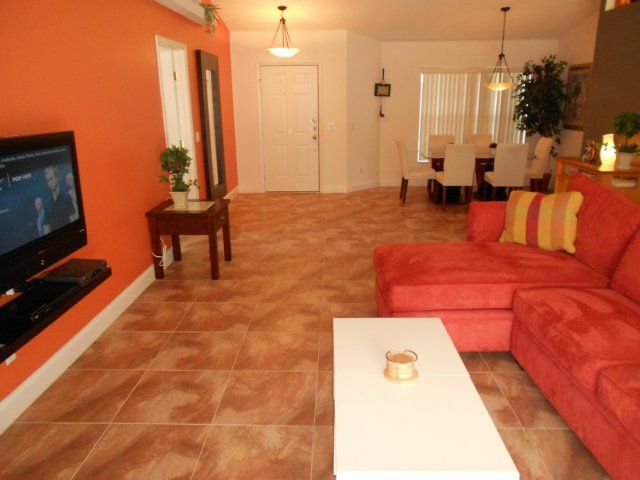 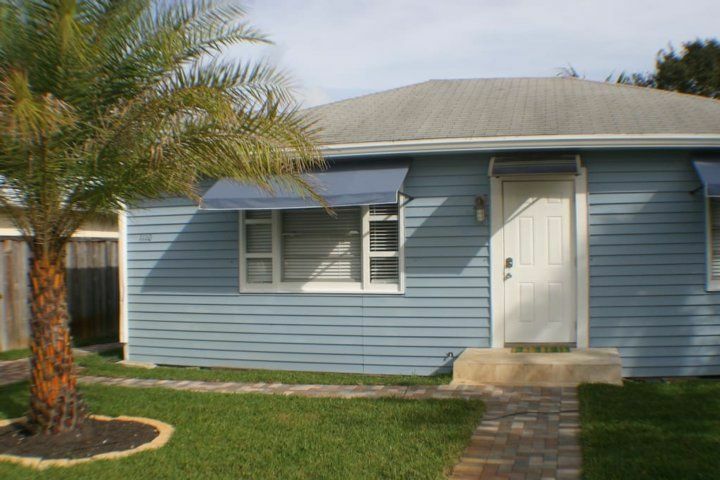 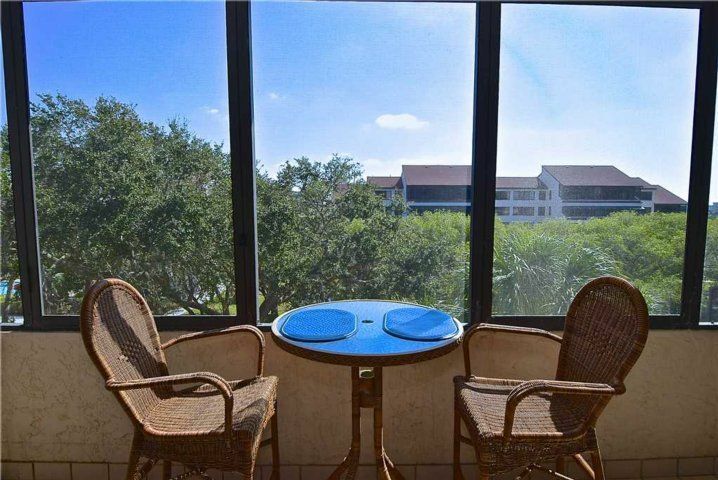 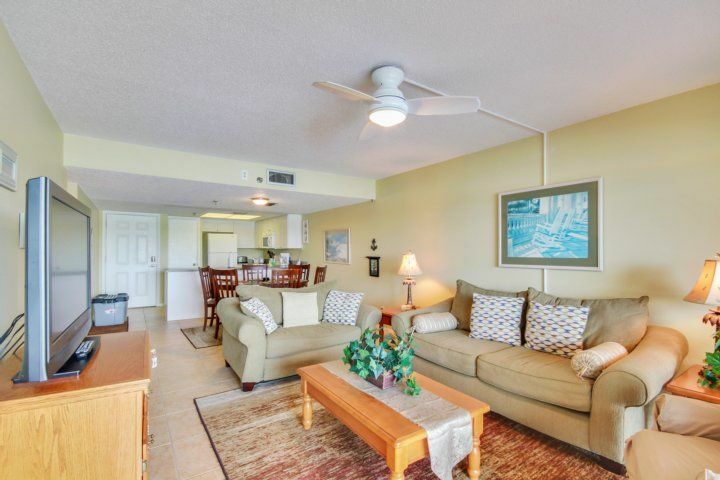 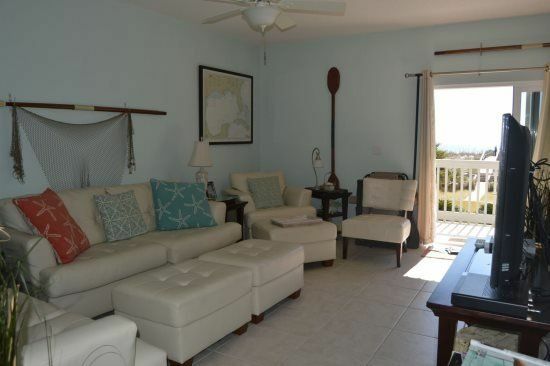 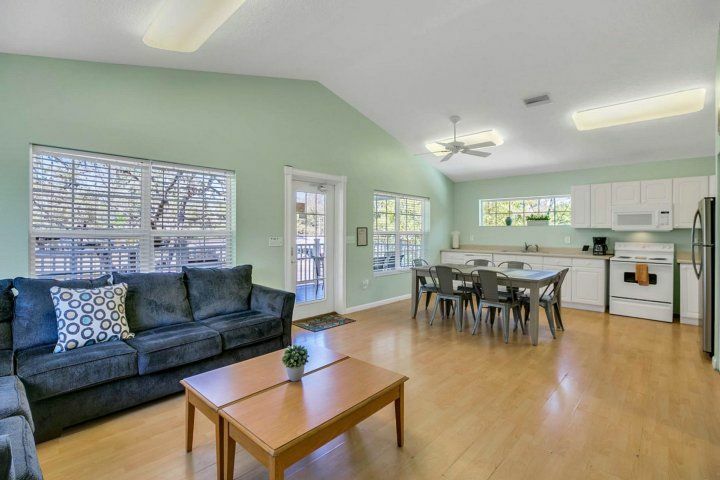 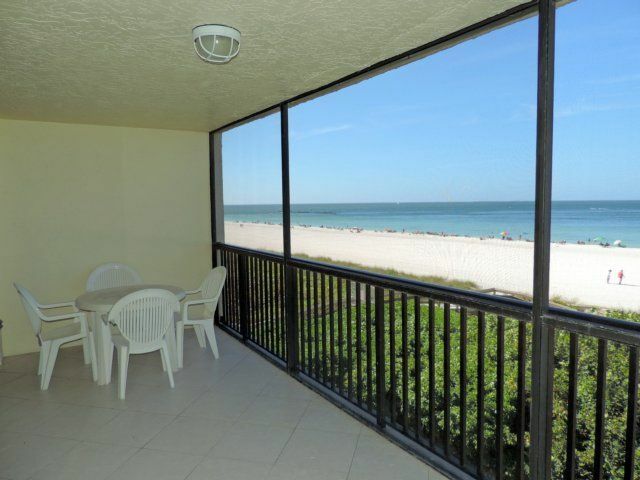 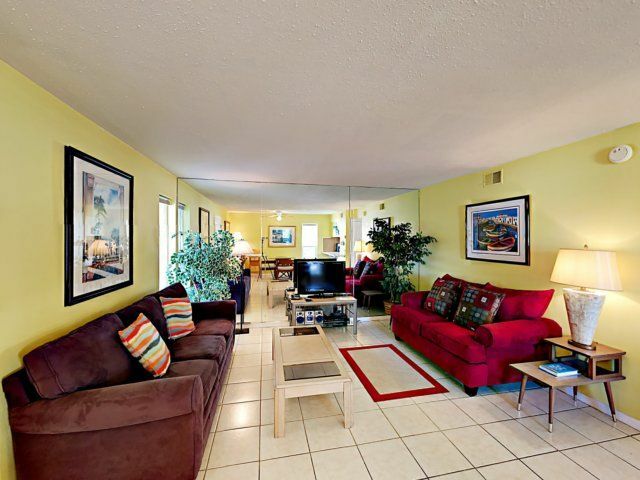 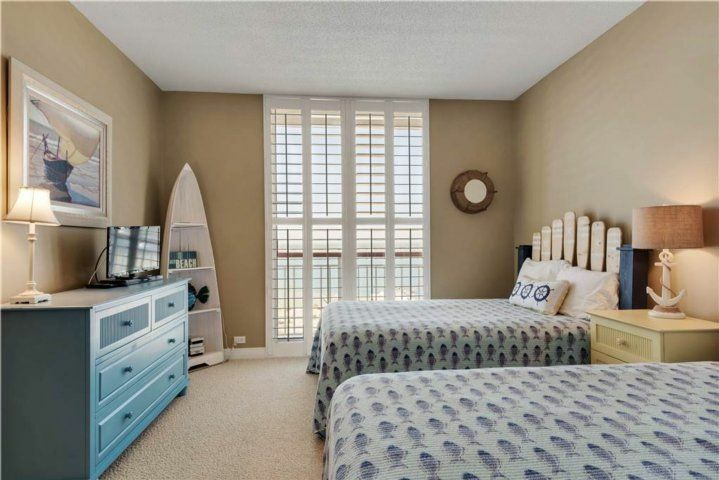 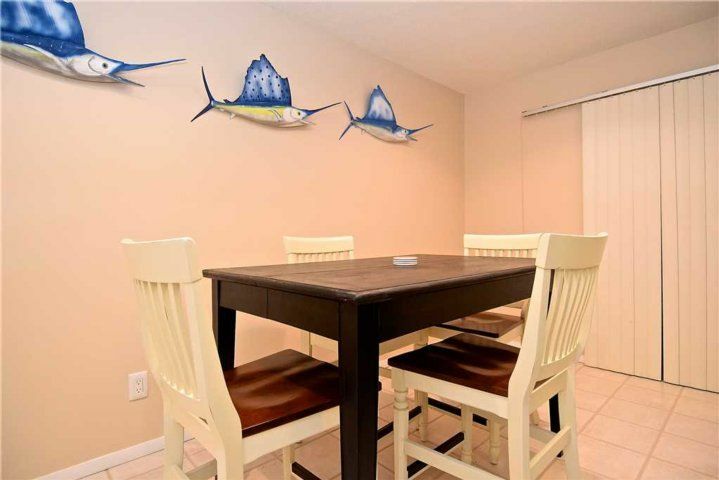 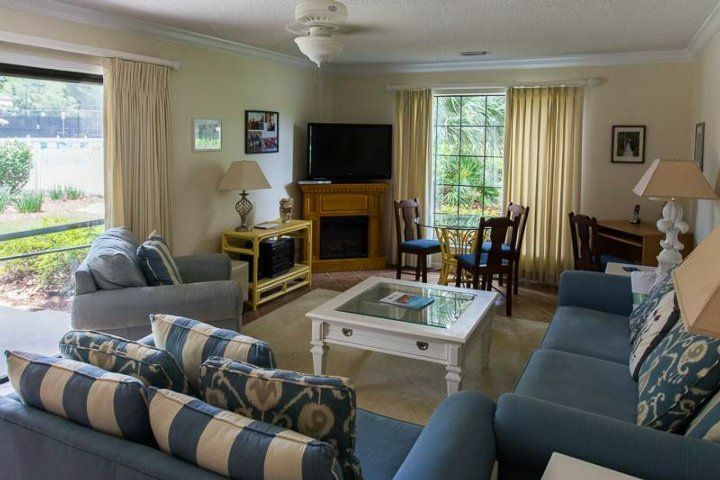 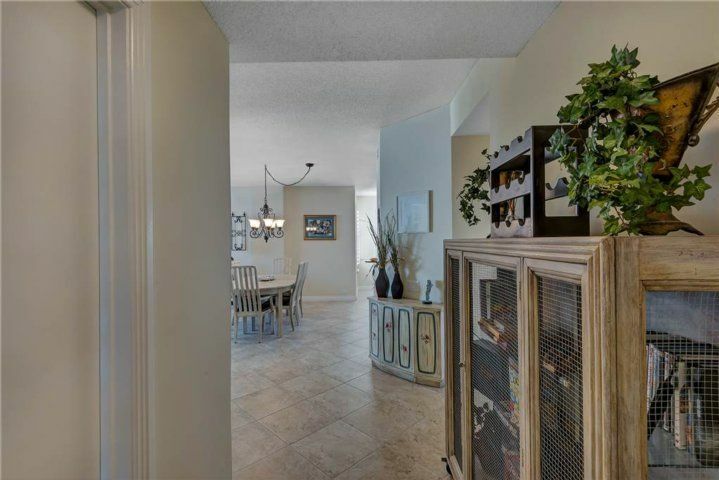 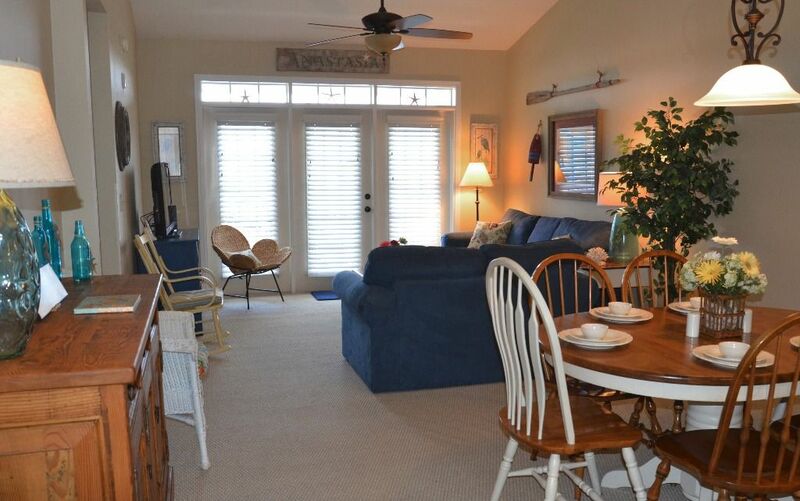 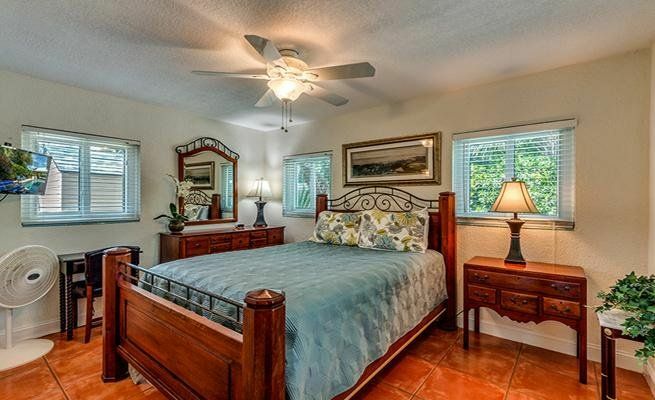 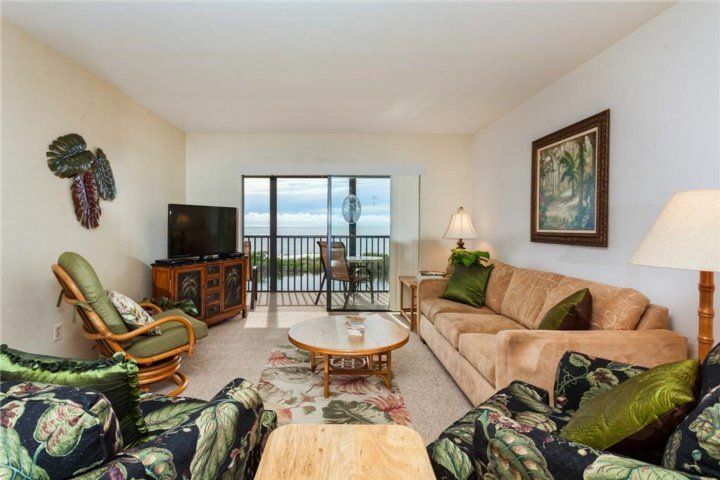 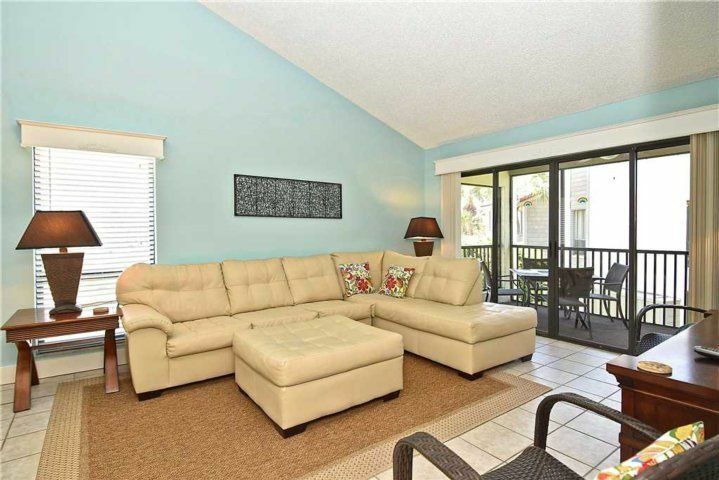 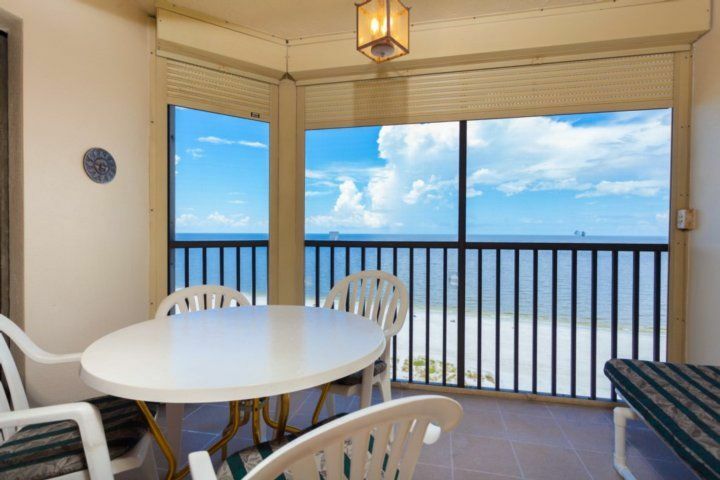 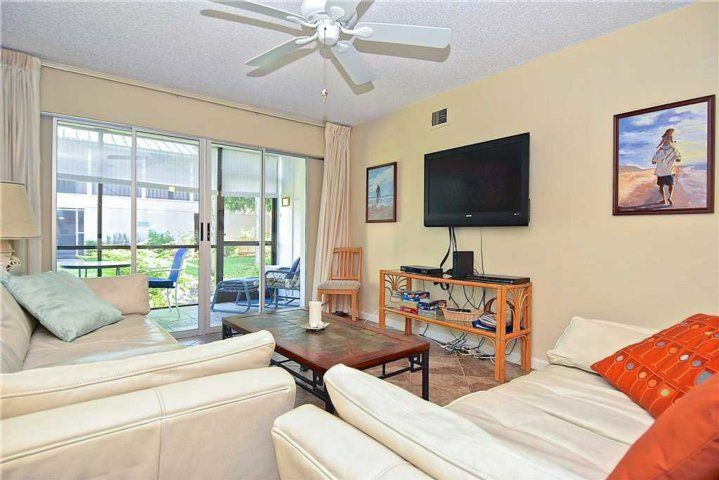 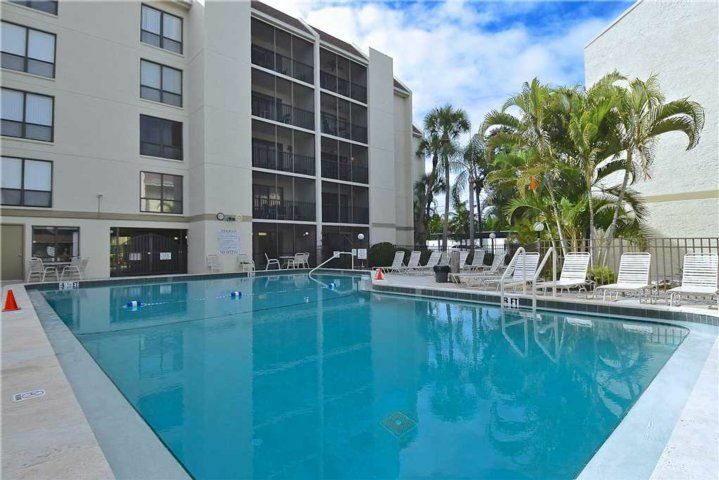 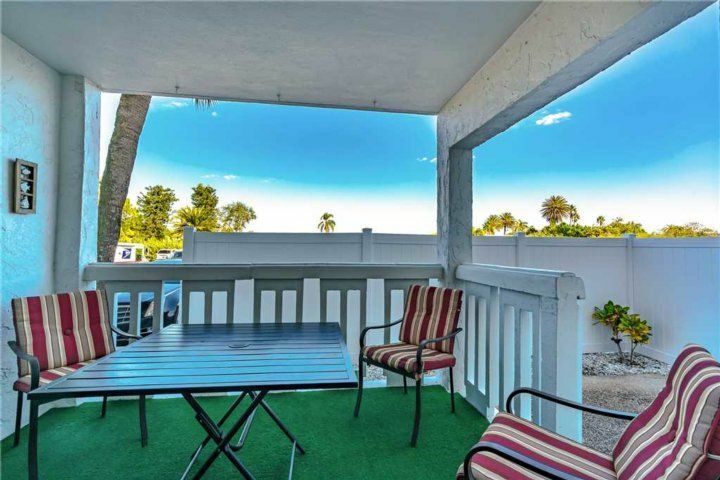 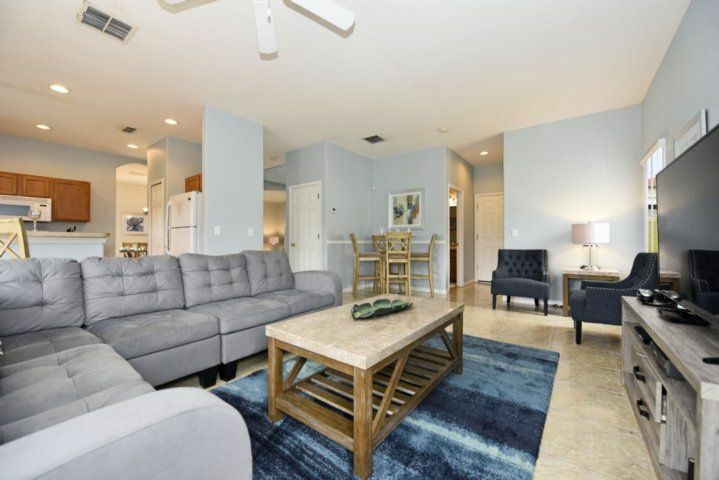 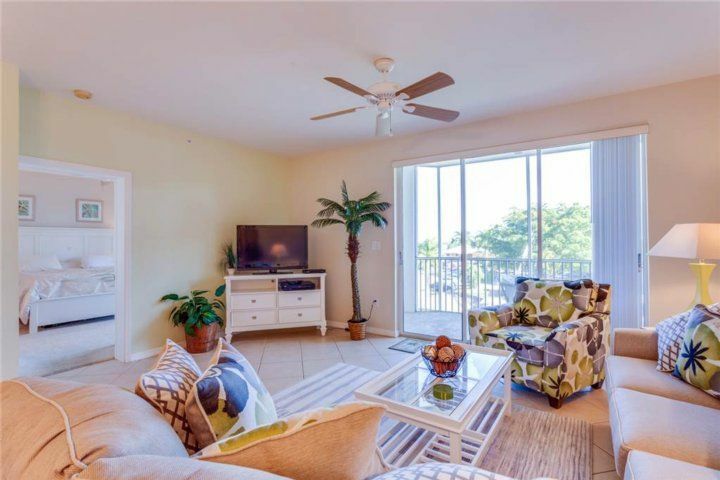 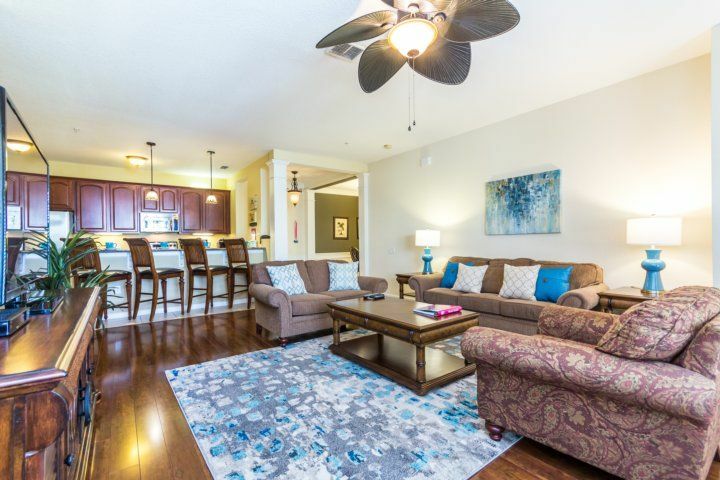 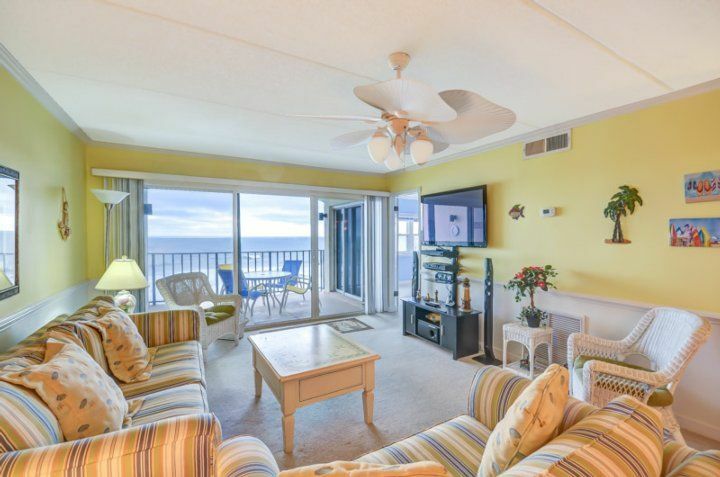 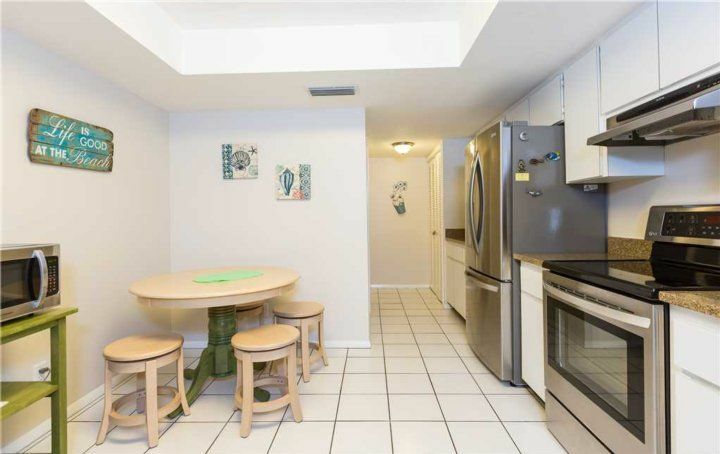 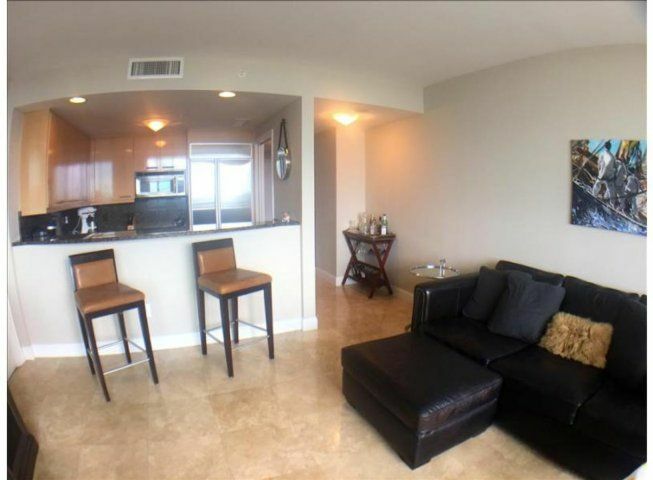 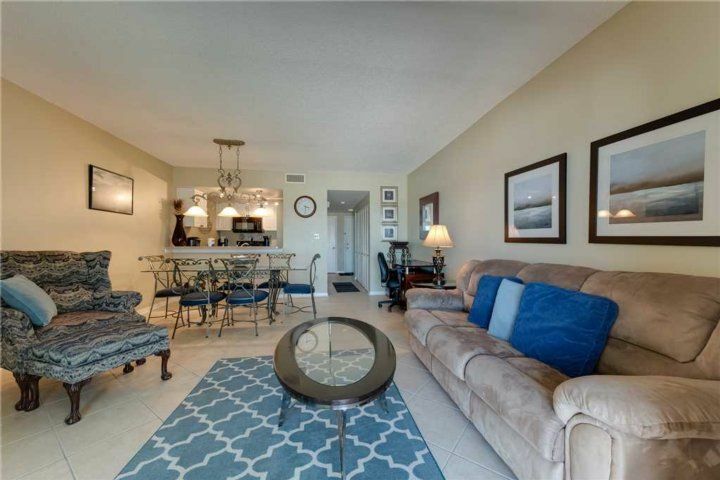 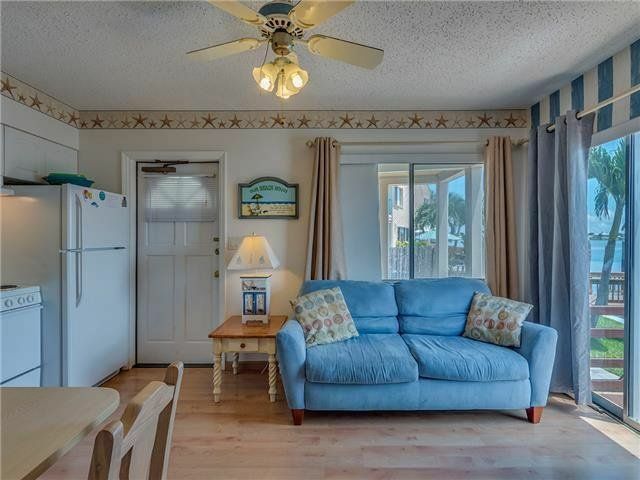 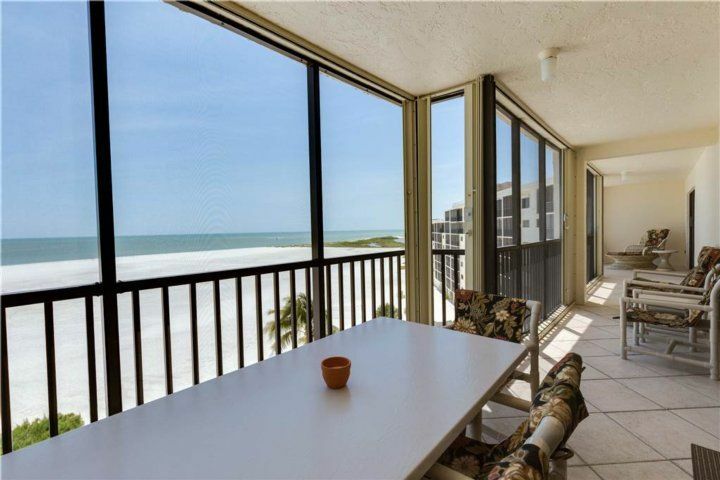 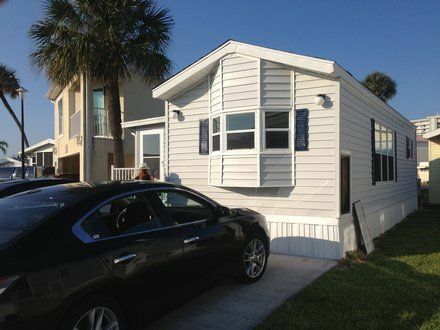 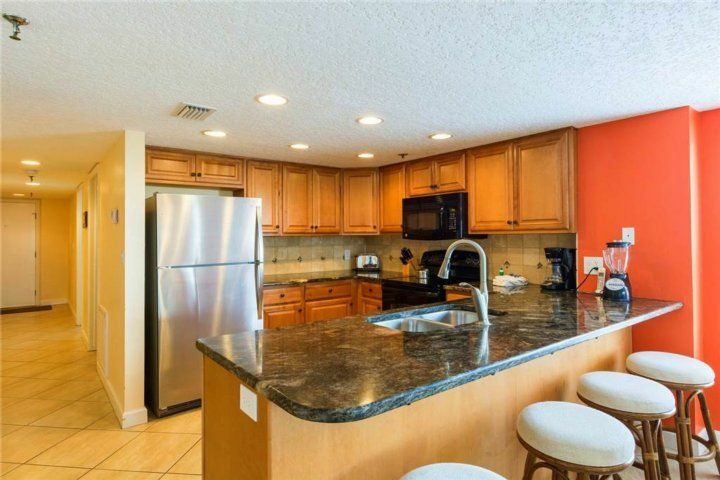 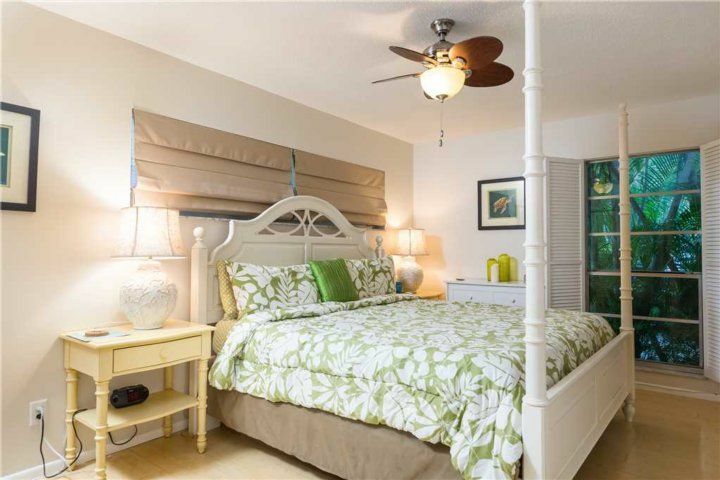 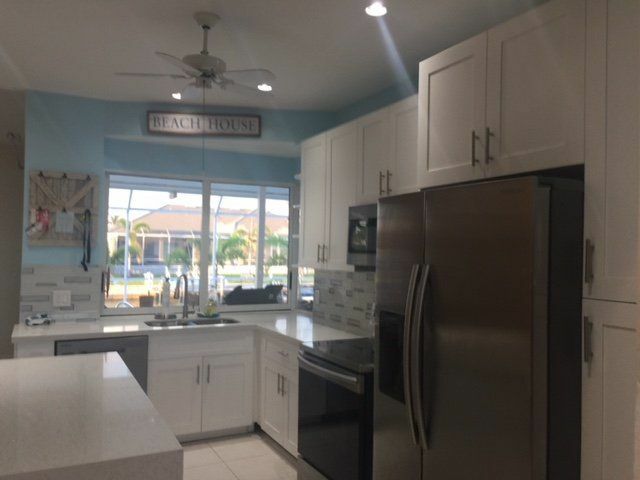 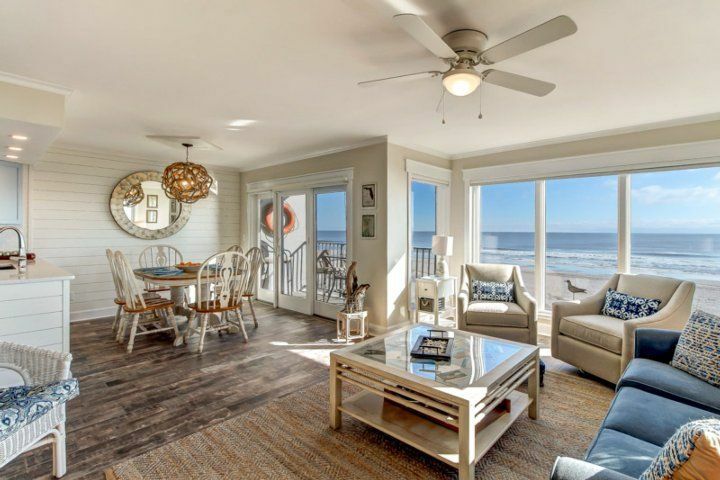 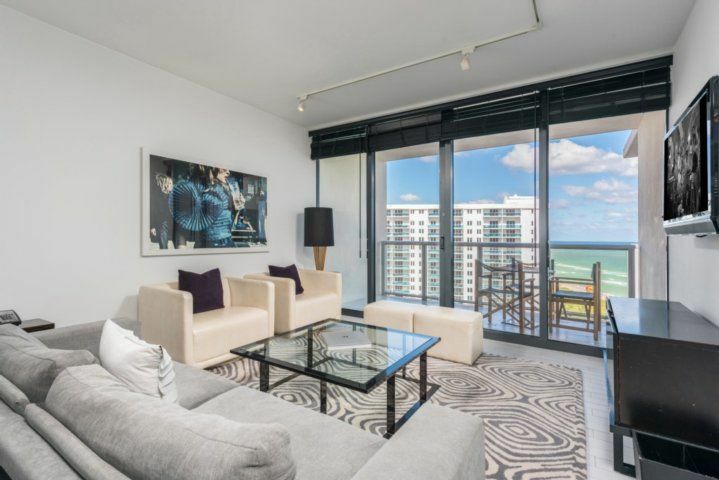 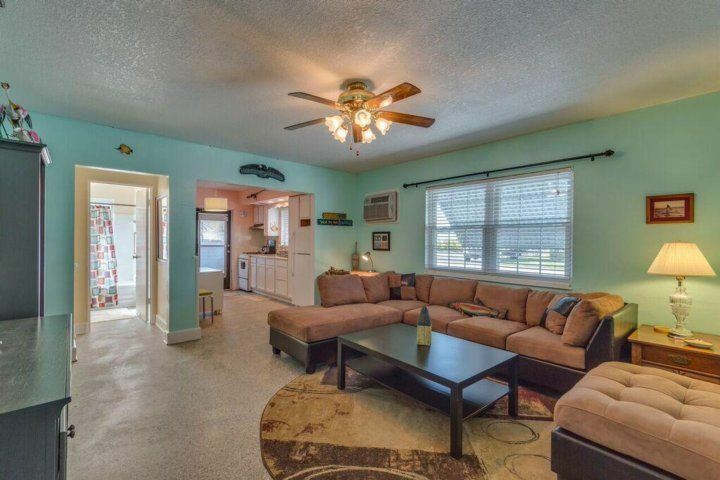 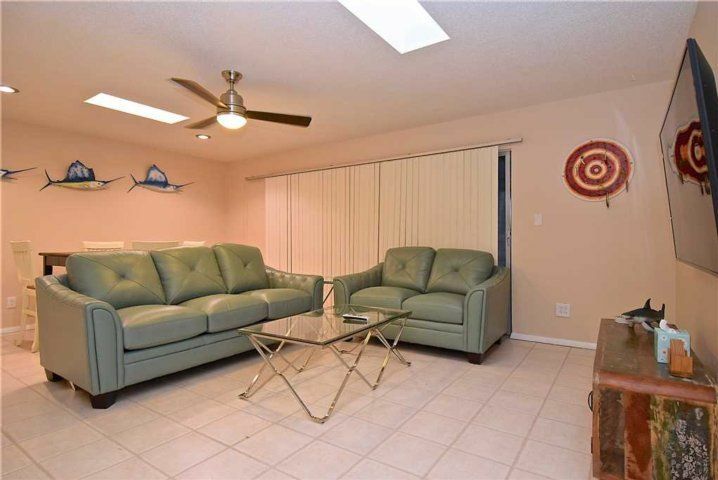 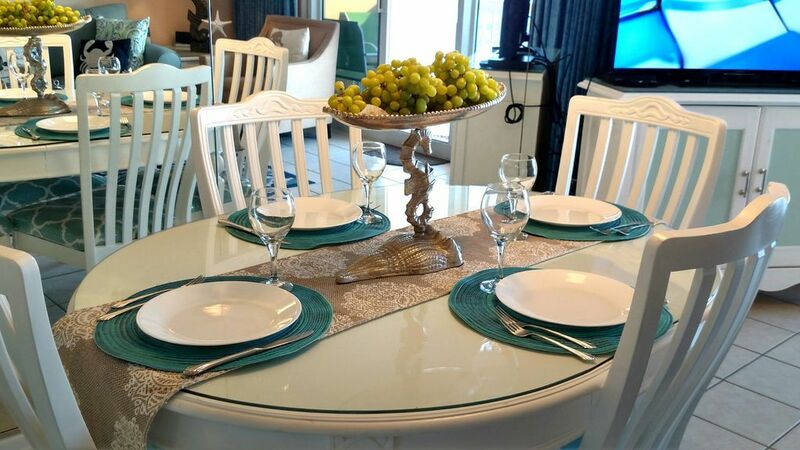 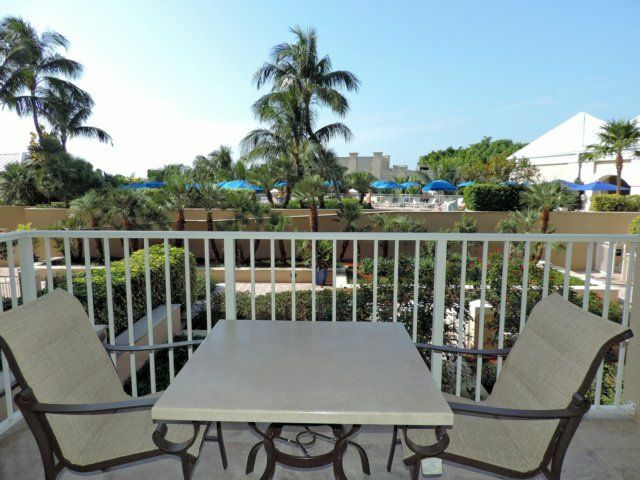 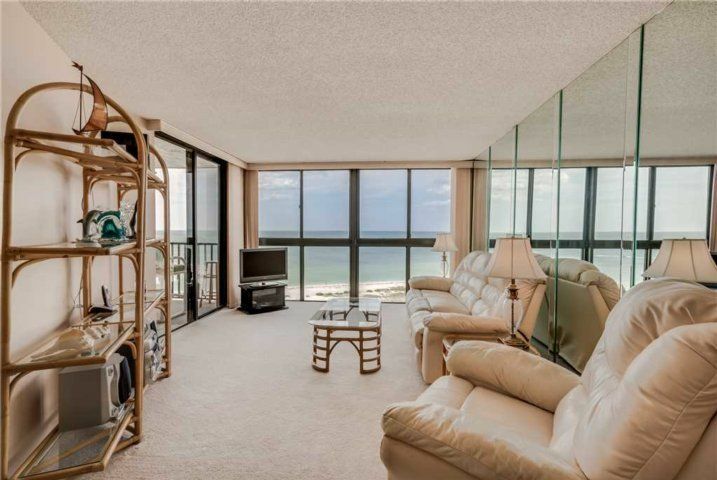 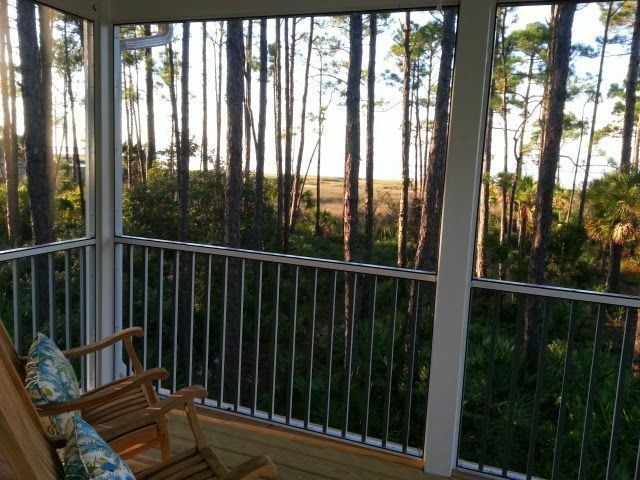 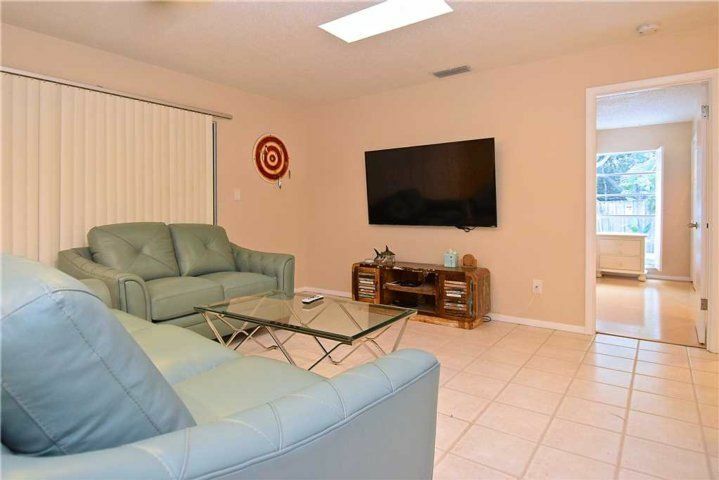 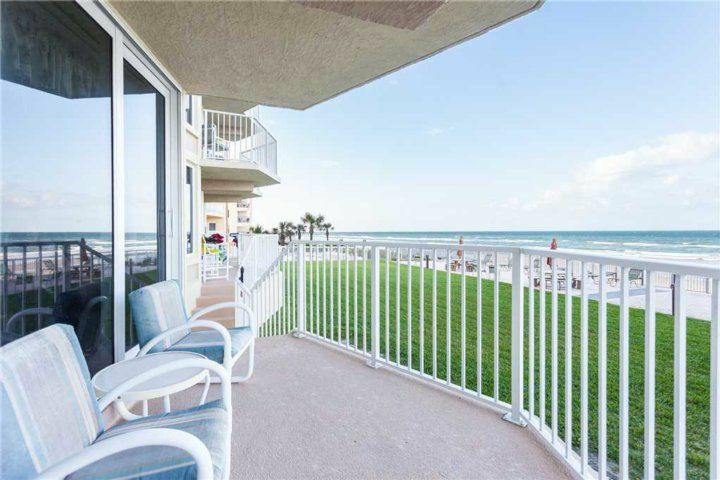 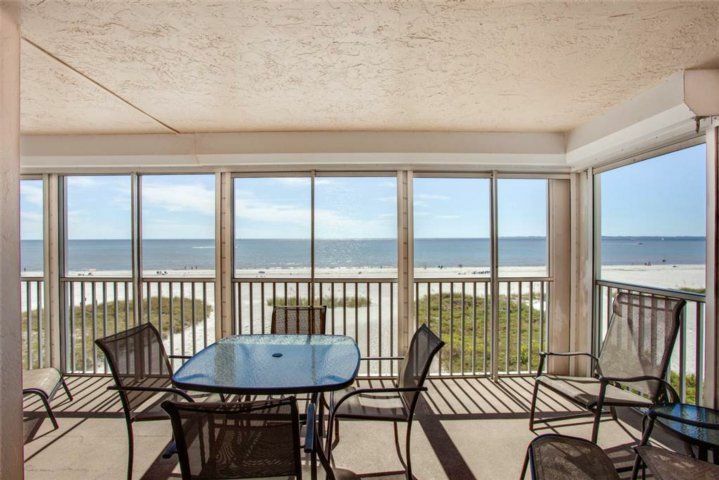 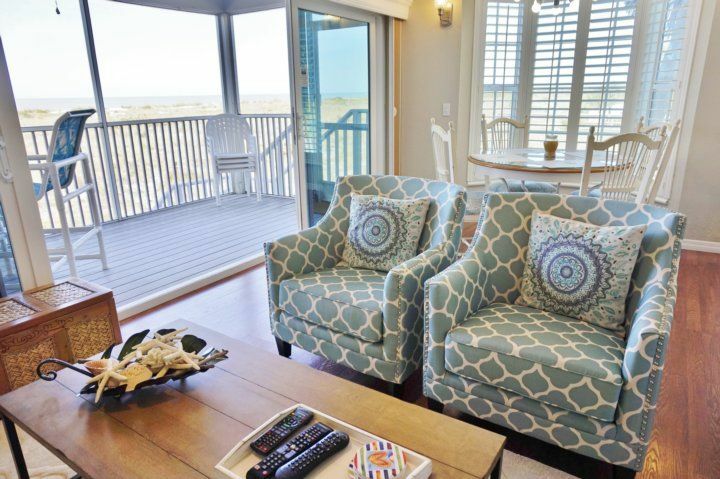 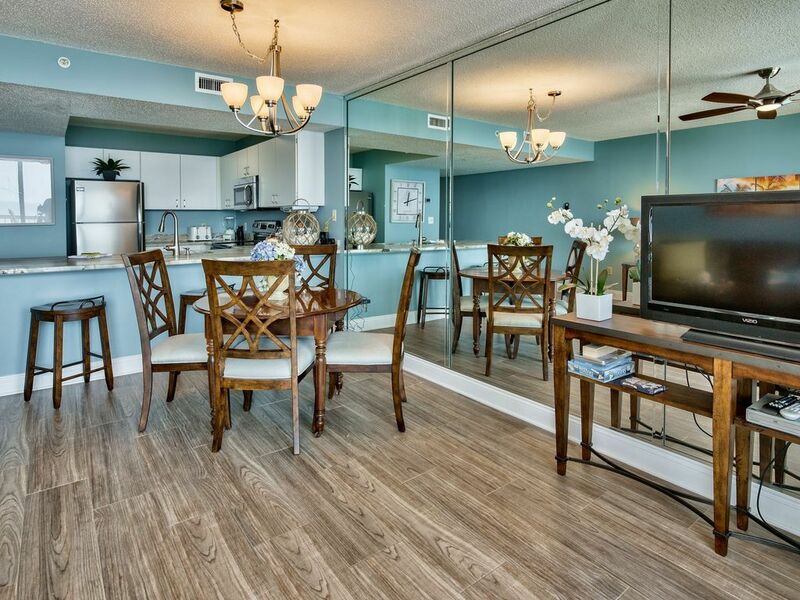 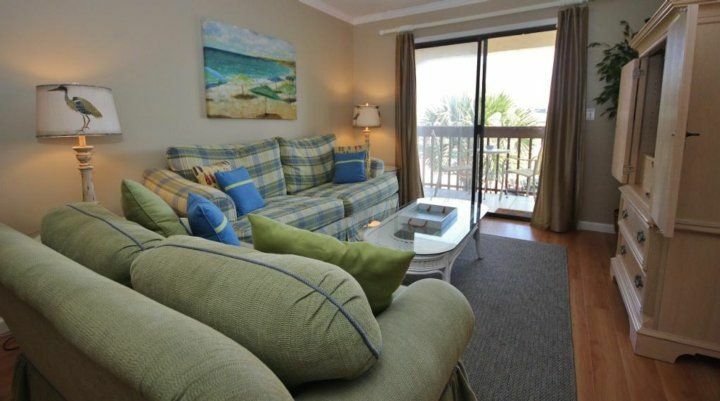 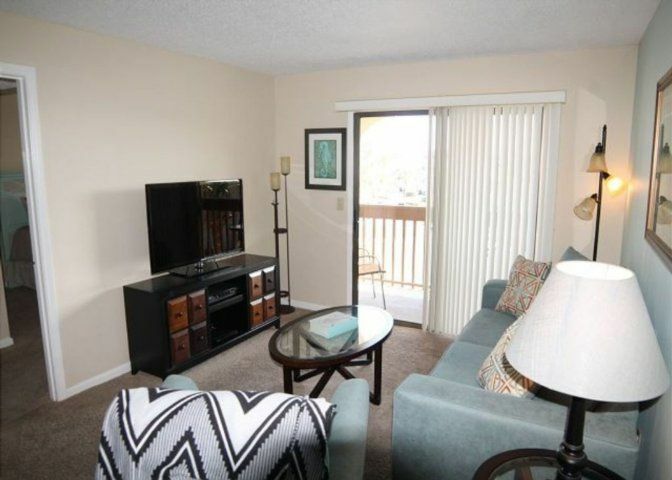 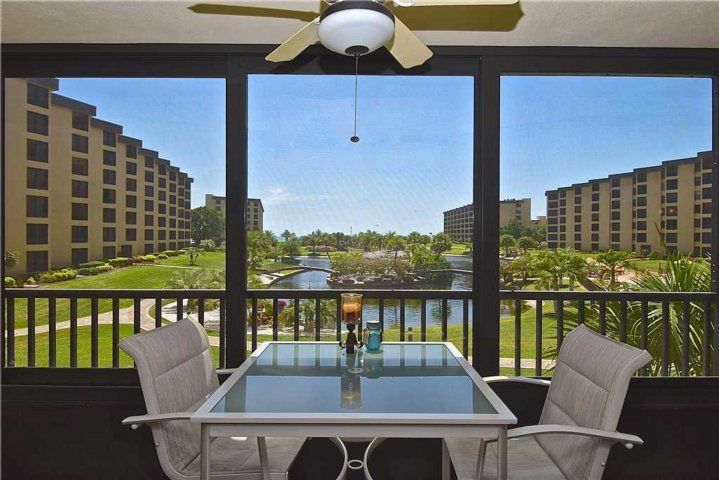 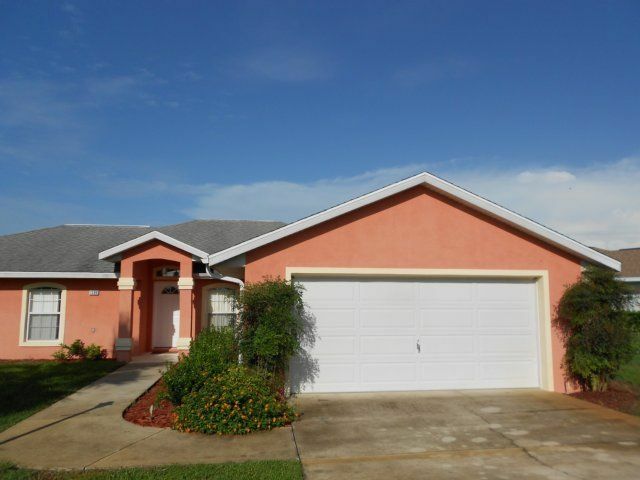 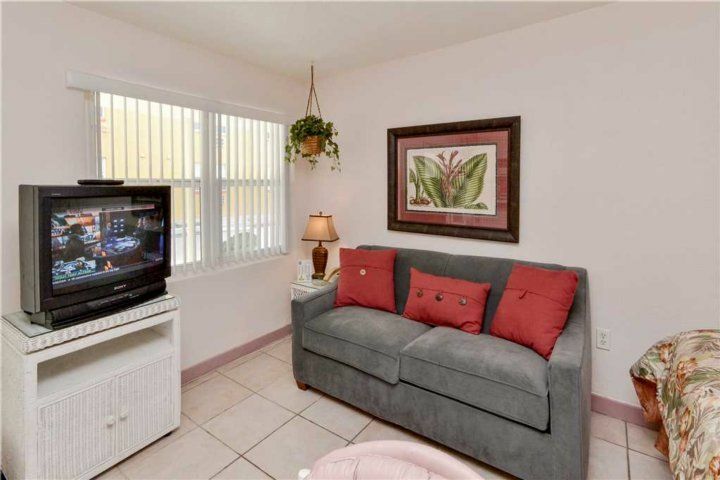 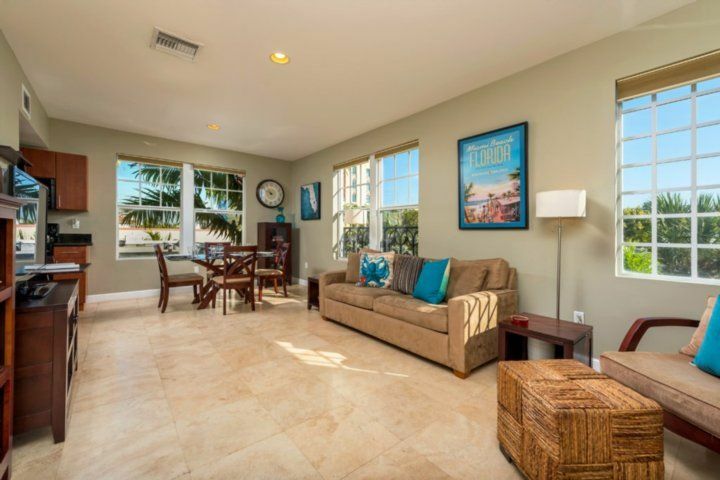 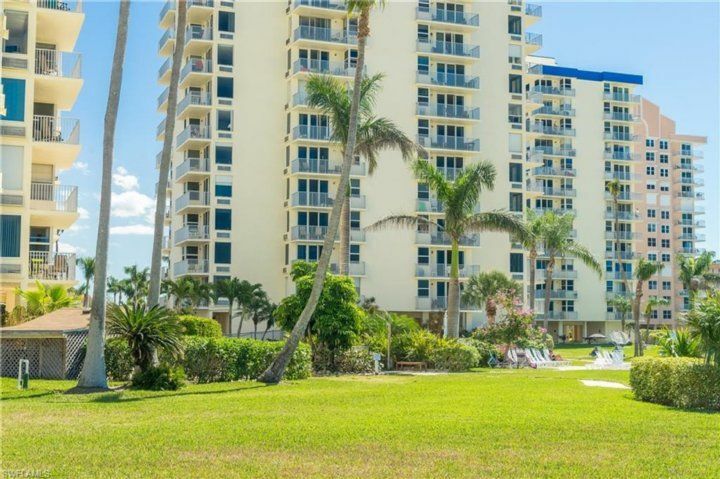 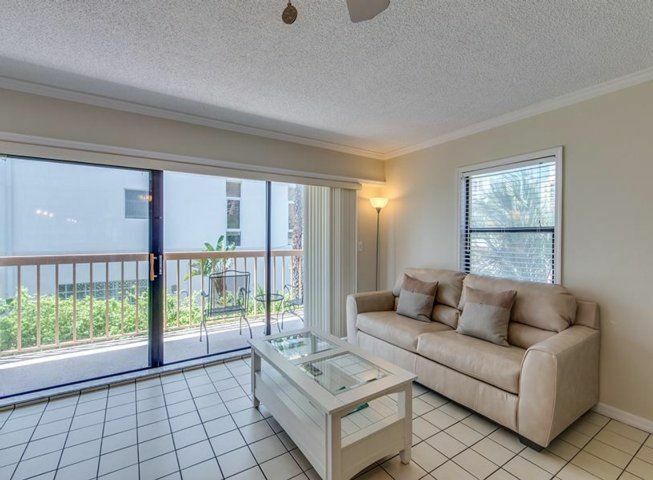 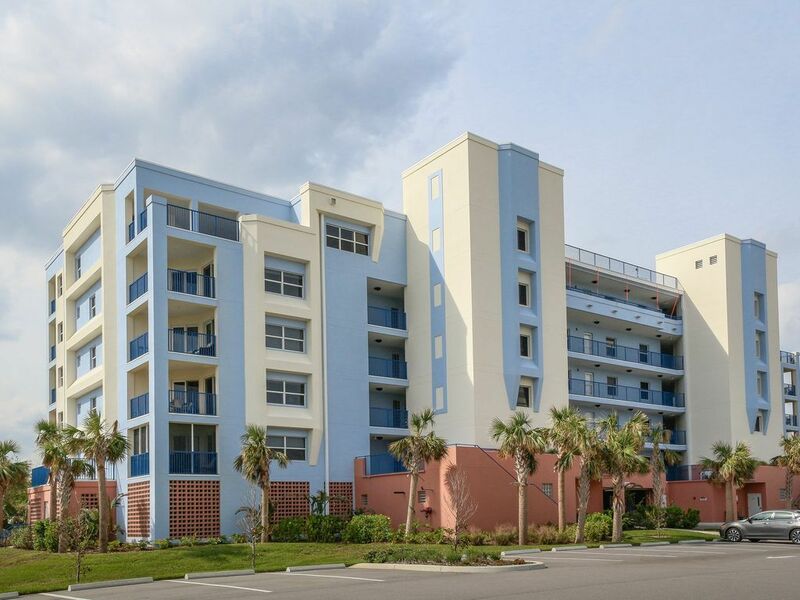 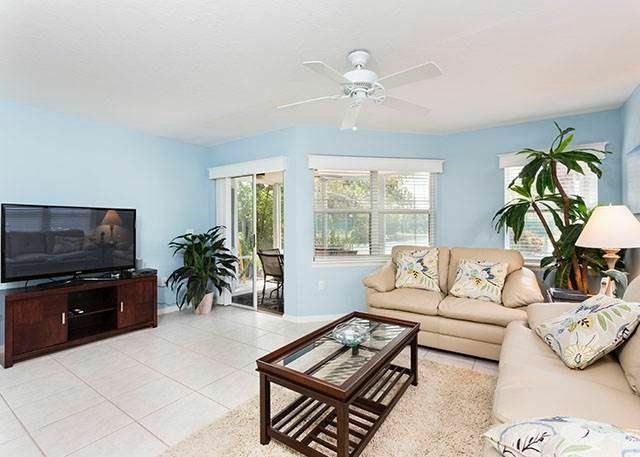 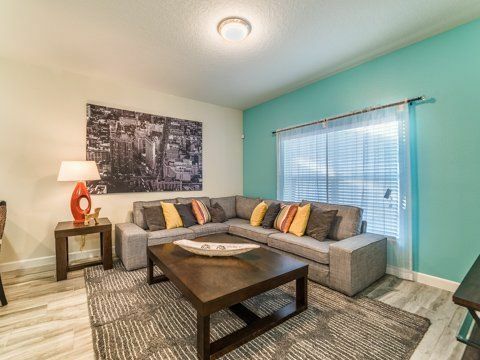 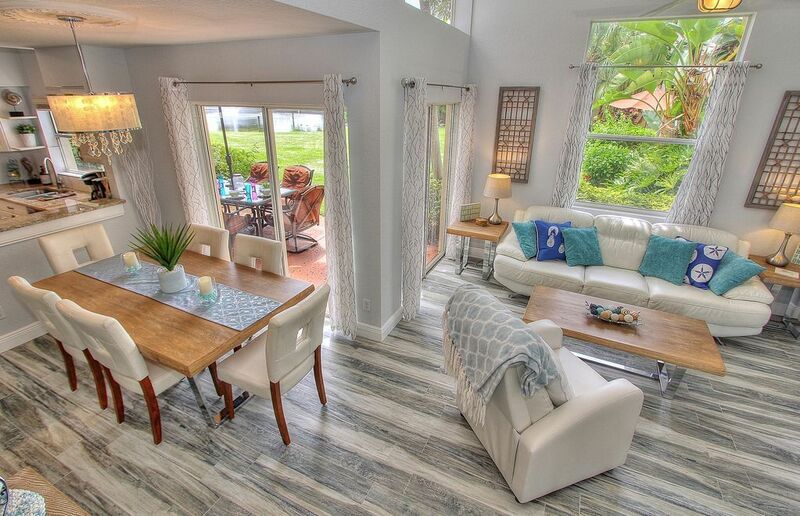 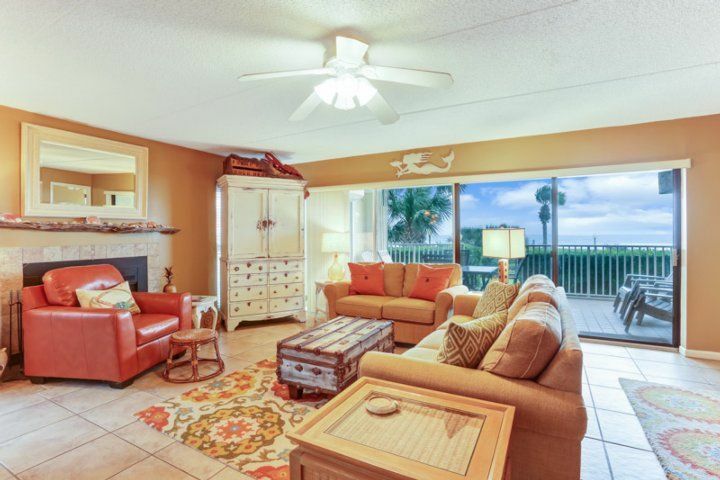 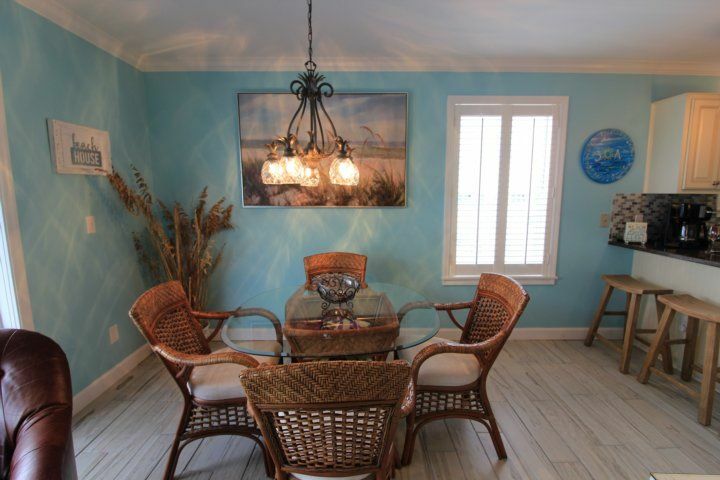 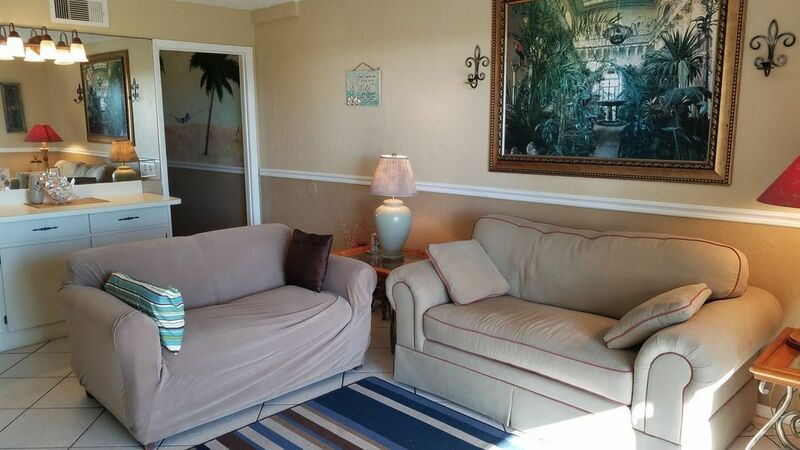 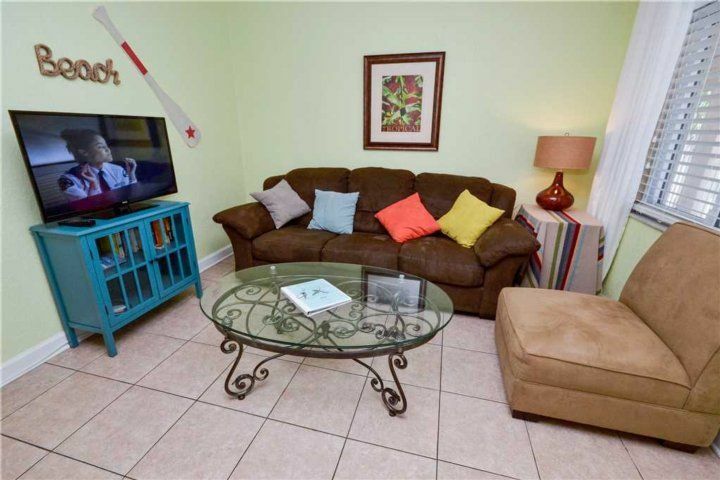 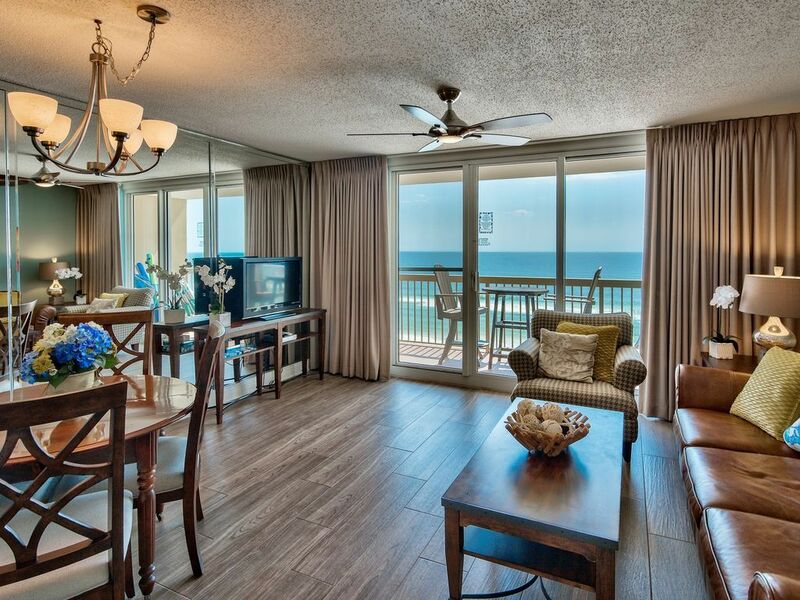 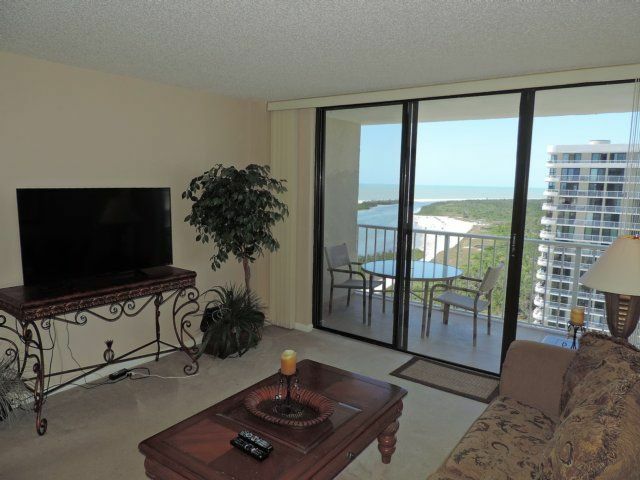 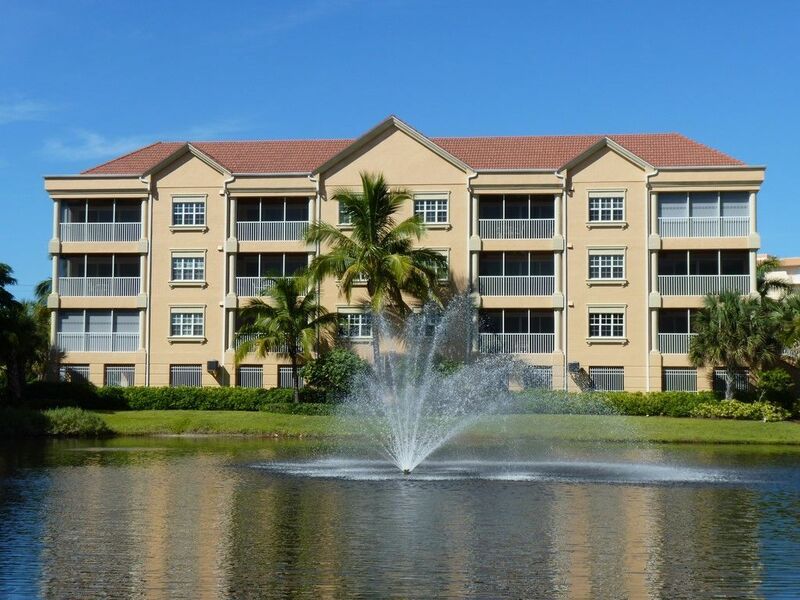 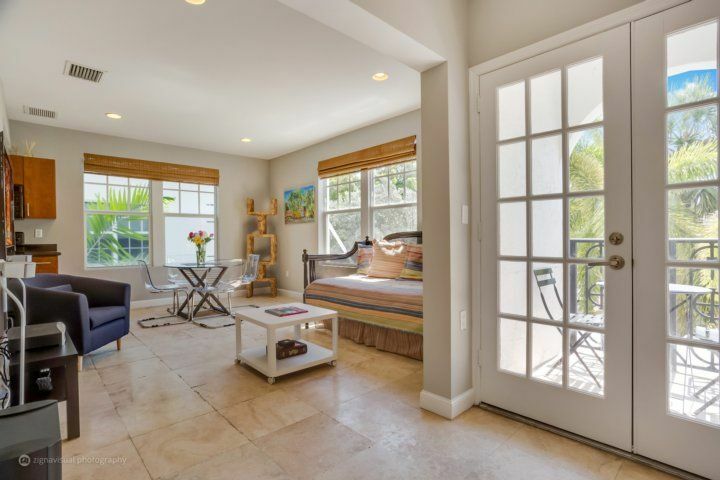 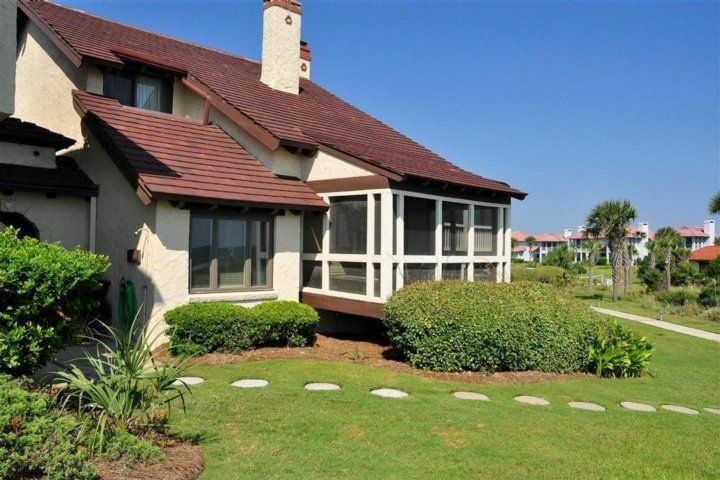 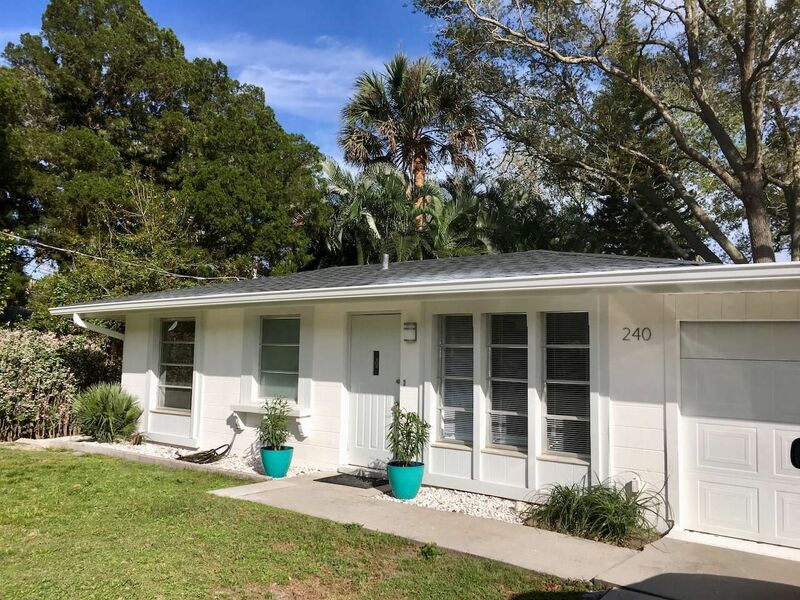 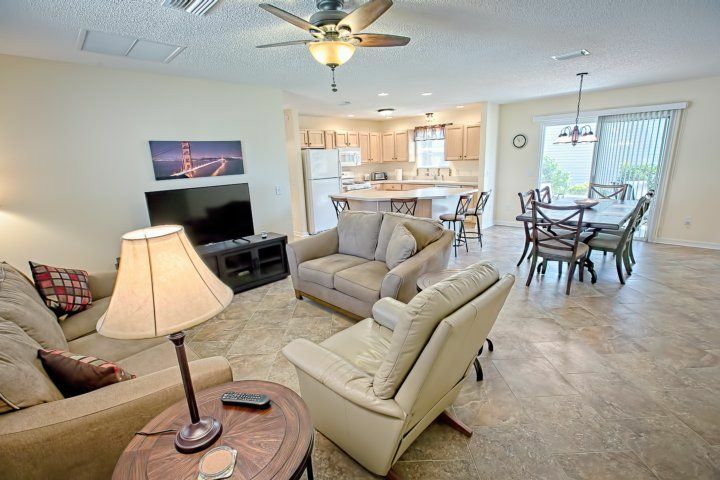 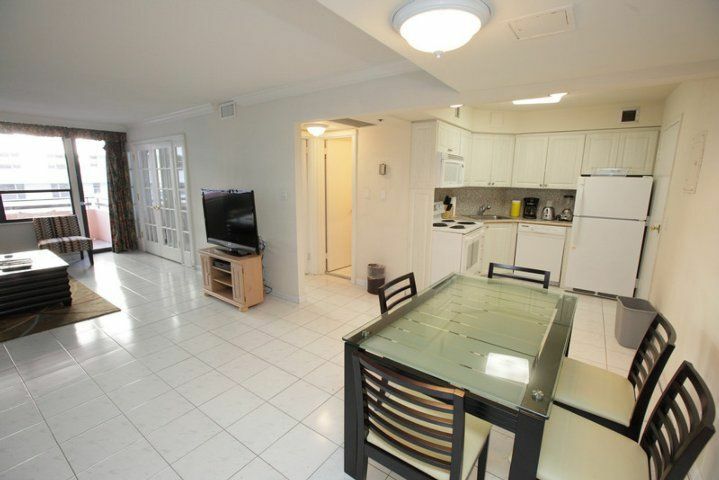 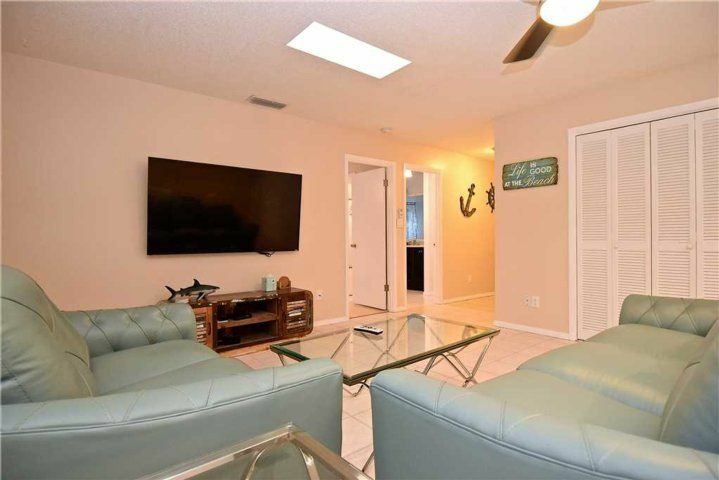 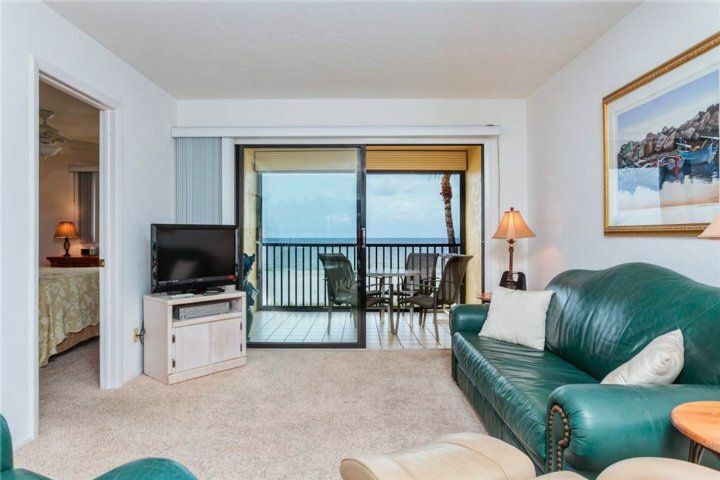 The 2 bedroom unit, with its tiled floor, soft color scheme, and large windows framed by shutters to keep out the midday, midsummer heat, the airy living/dining area is everything you want in a Florida getaway. 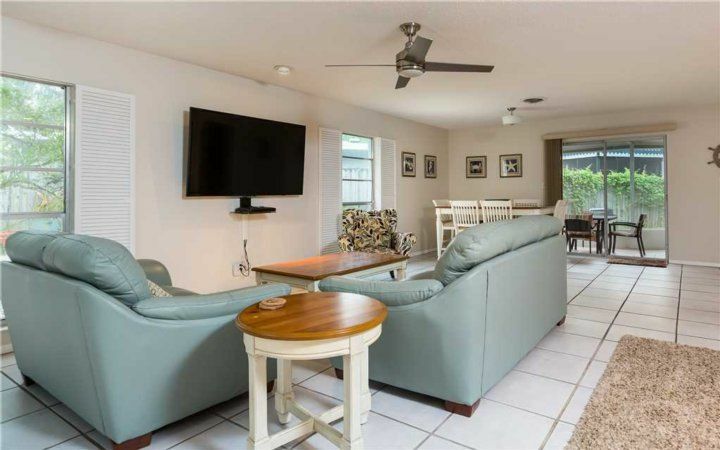 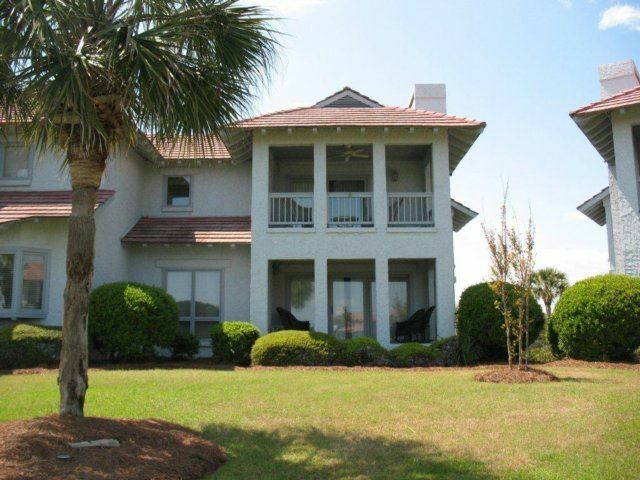 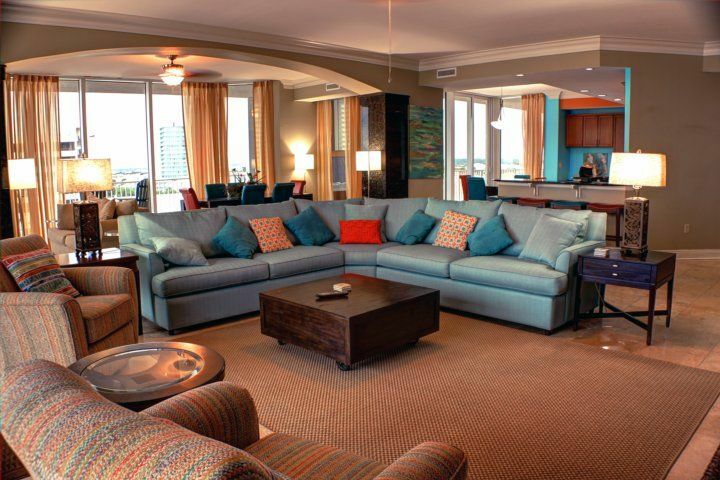 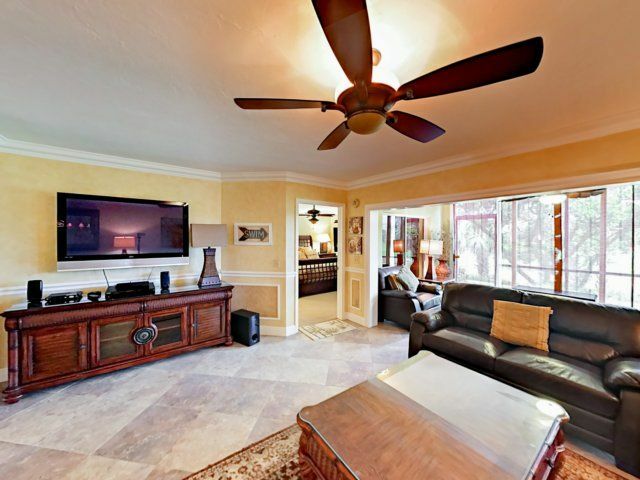 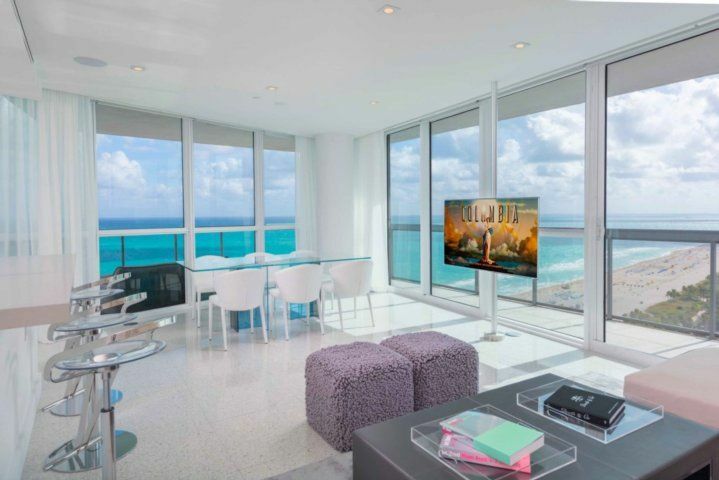 Curl up in the armchair with your tablet to take advantage of the free WiFi, gather everyone together on the well-cushioned couches to watch a movie on the 60” HDTV with the NFL package included, or sprawl out under the ceiling fan for a well-deserved nap—don’t feel shy; you’re on vacation! 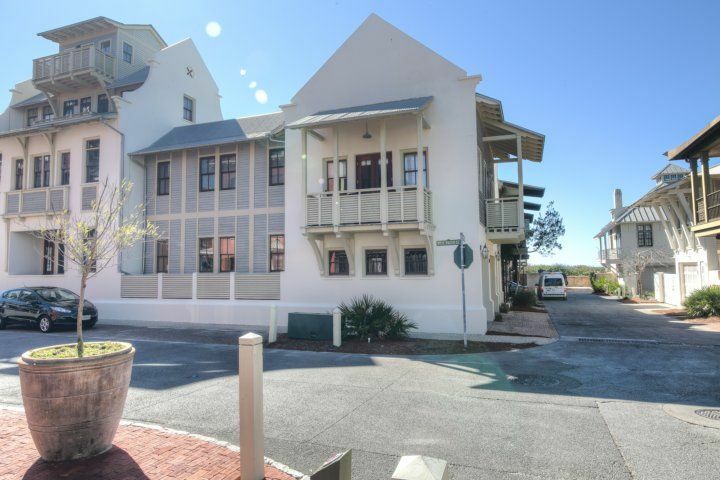 Another benefit of Crescent Street’s locale is that there are numerous restaurants just a short walk or drive away. 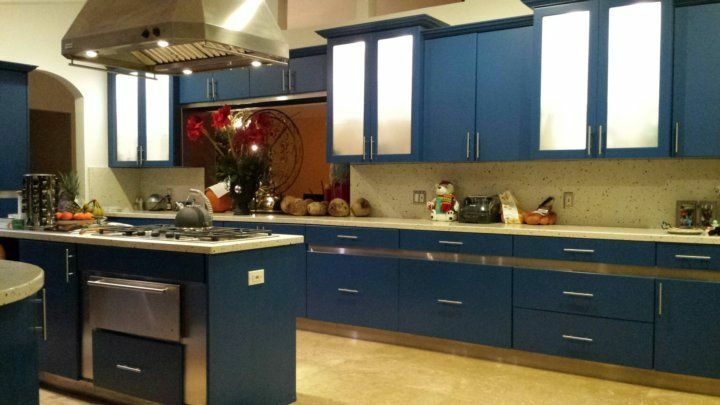 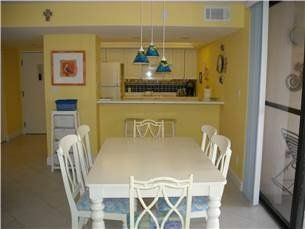 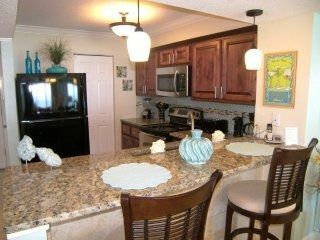 But sometimes nothing beats a home-cooked meal, and the spacious kitchen makes cooking a pleasure. 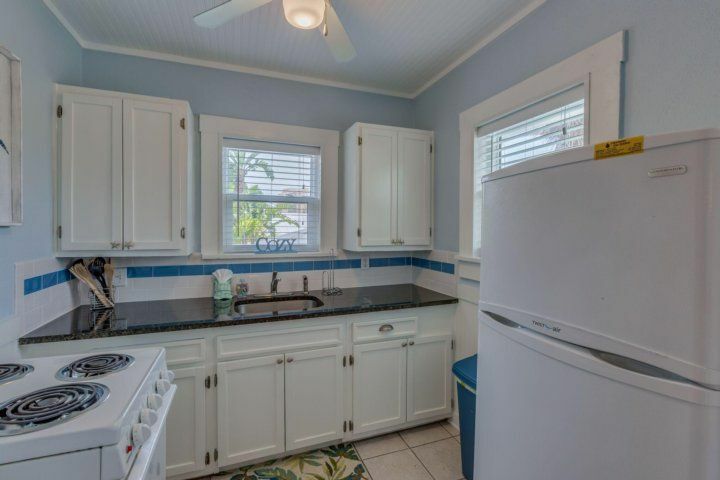 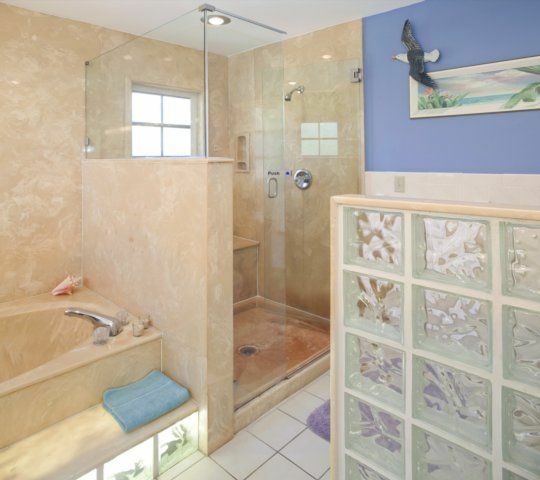 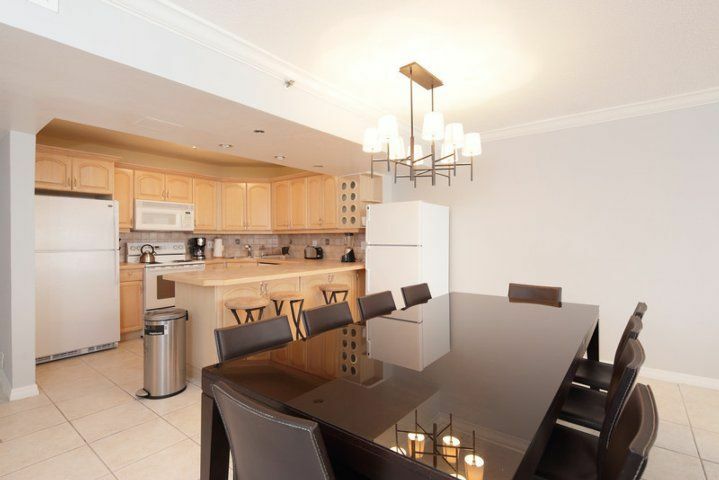 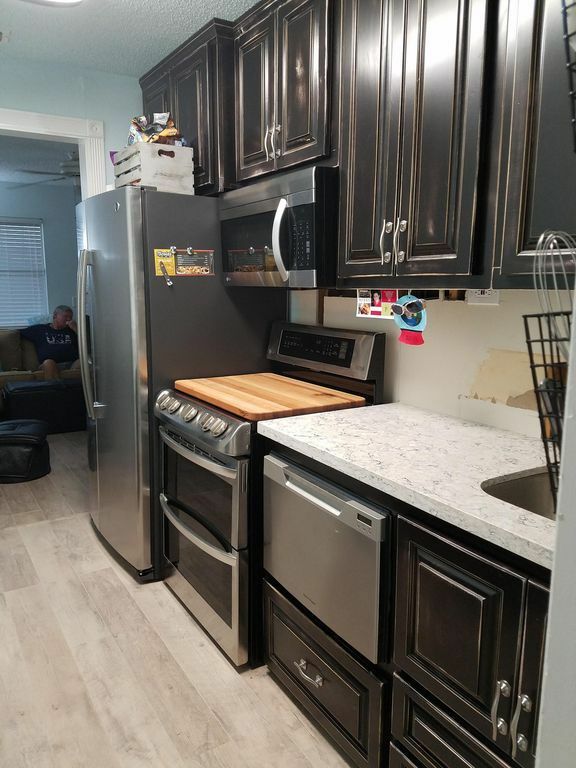 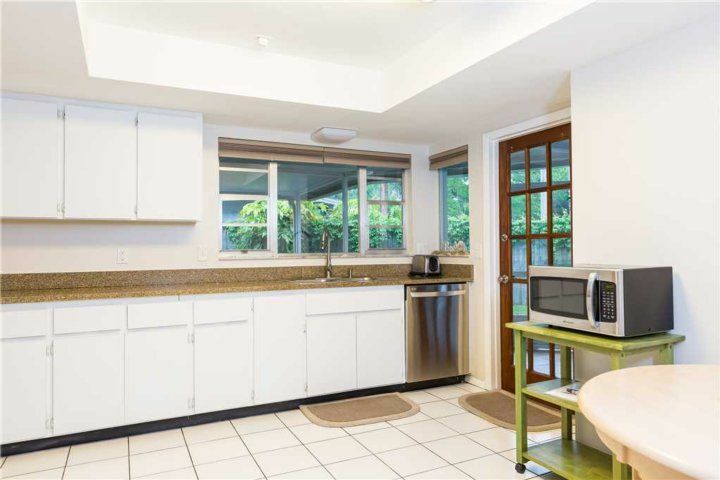 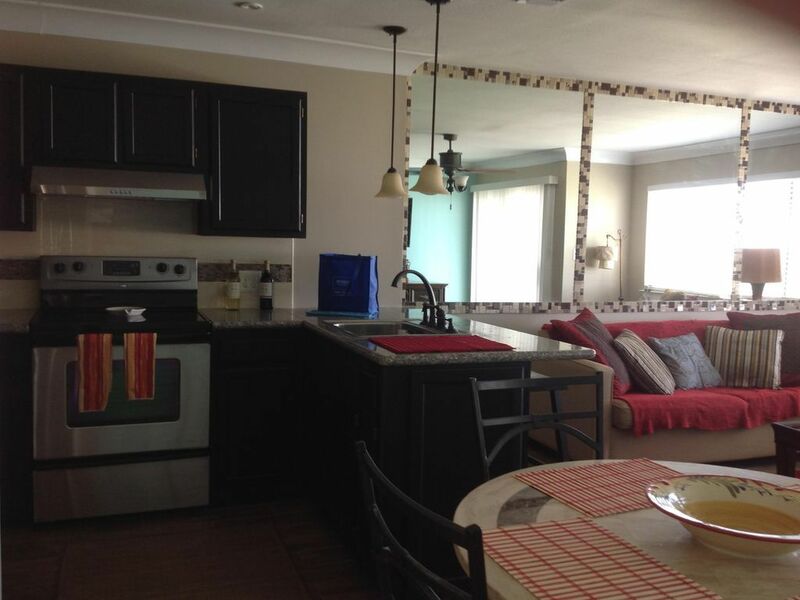 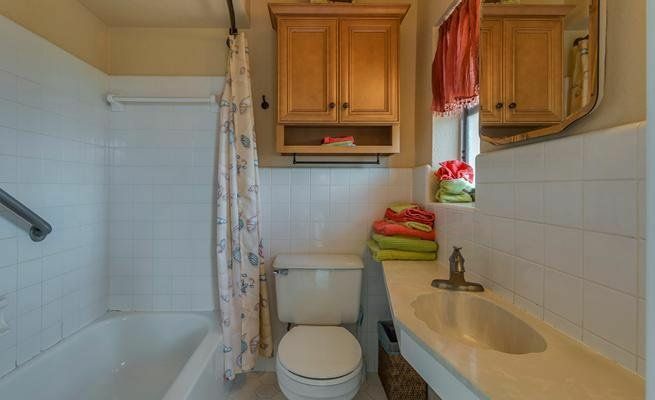 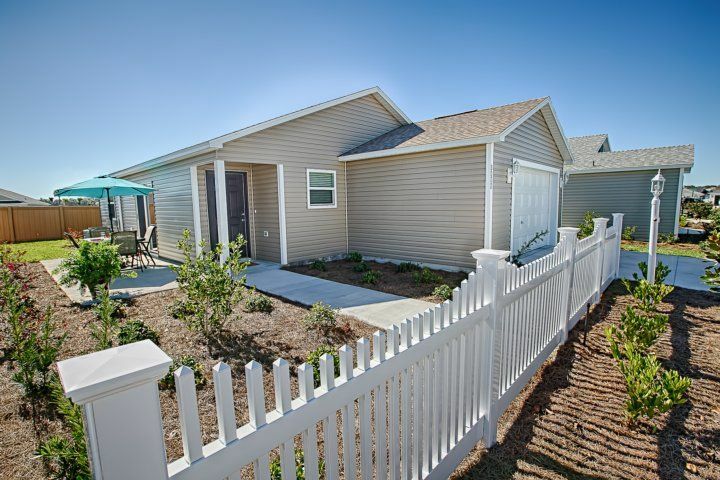 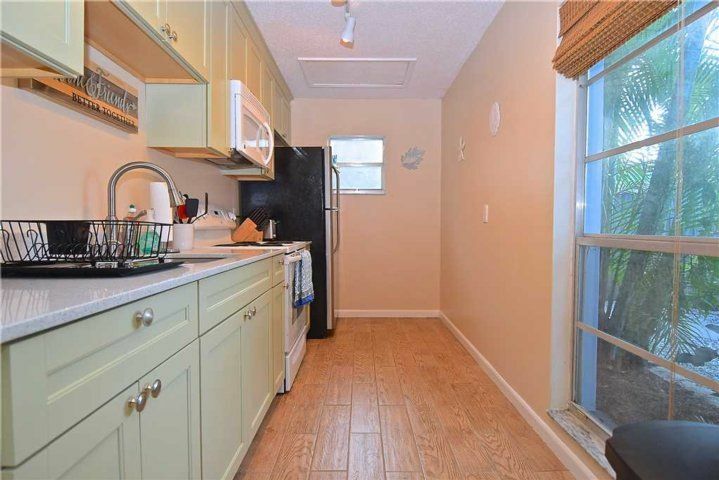 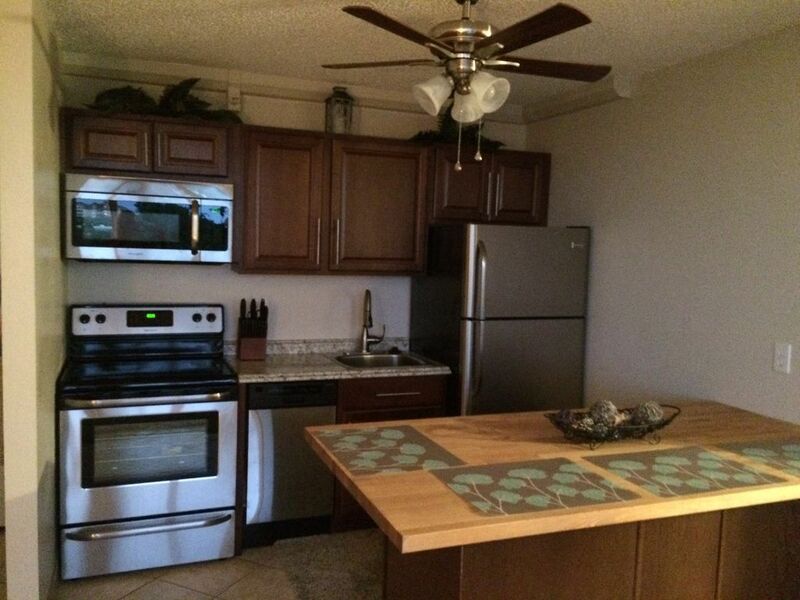 It’s equipped with stainless-steel appliances, cookware, and tableware aplenty, plus loads of counter space. 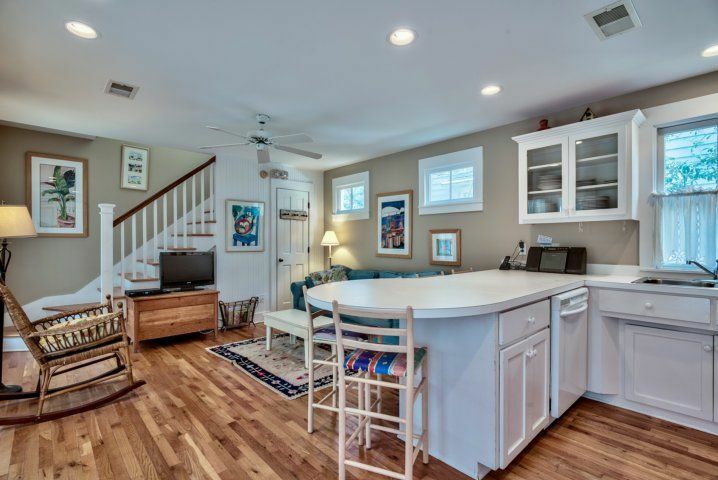 There are a handy kitchen table and chairs too, so you can enjoy some quiet time with a book and a snack while waiting for the dough to rise or the water to boil. 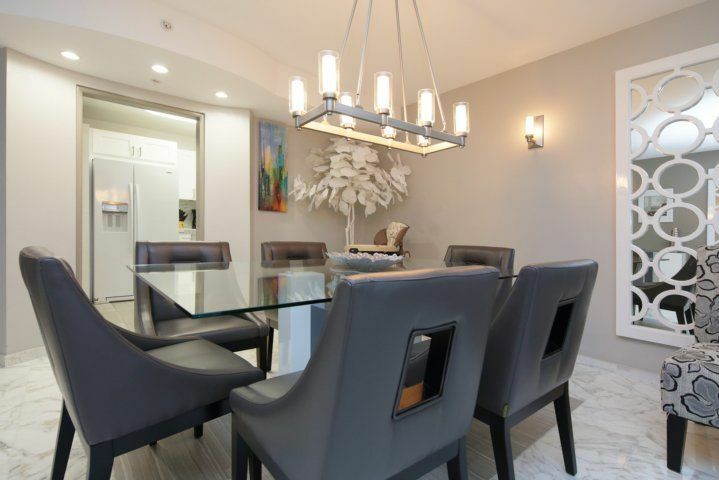 When it’s time to dig in, bring your feast out to the roomy dining table, which seats 6 in comfort and style. 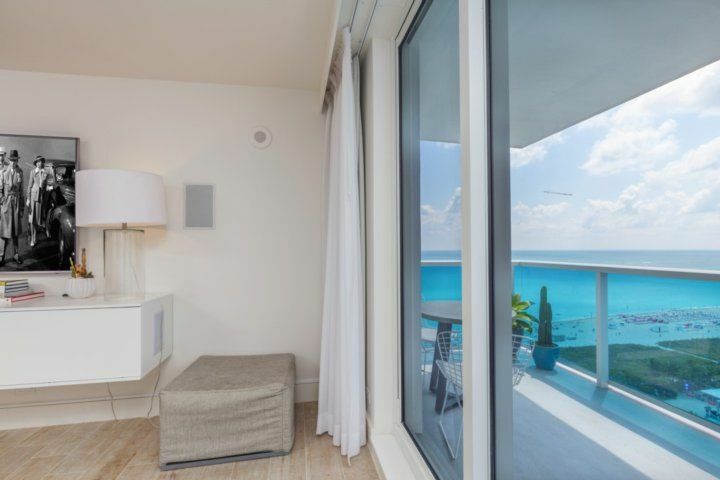 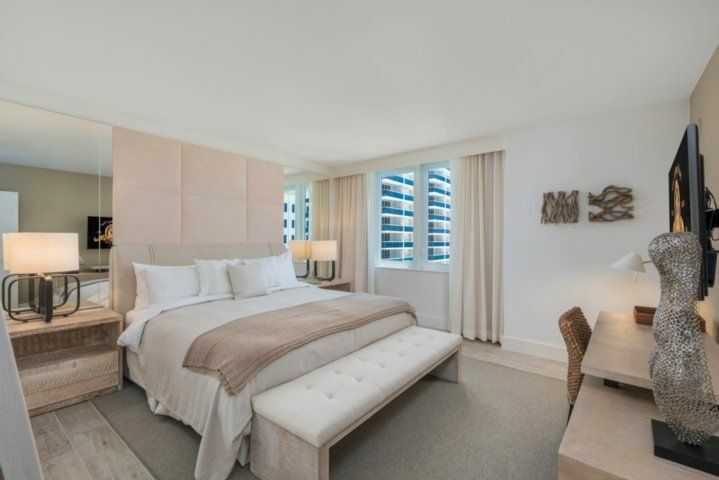 Catching up on your sleep is often a favorite part of a vacation, and Crescent Street’s 2 bedrooms make doing so a cinch. 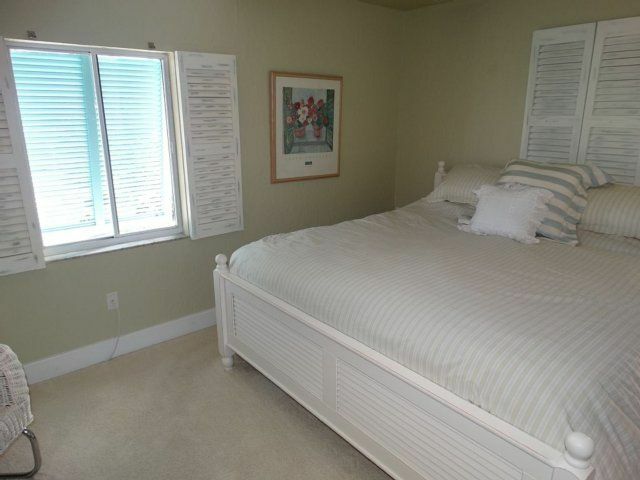 Both bedrooms have a king size bed. 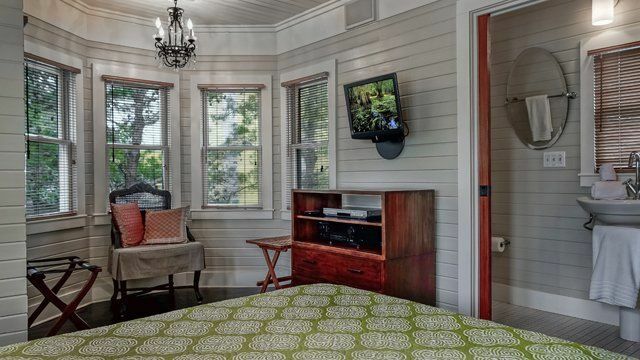 Each has a flat-screen TV, a large window so you can wake up to the sunshine and the chirping of wrens and warblers, a ceiling fan, and flanking night stands with lamps—this way one of you can stay up reading while the other drifts to sleep. 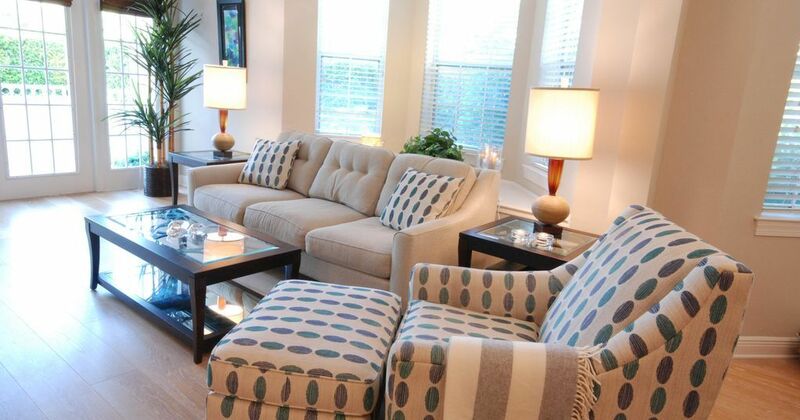 If you have additional overnight guests, the living room sofa converts to a queen-size bed, enabling the 2 bedroom unit of Crescent Street Manor to sleep 6 people. 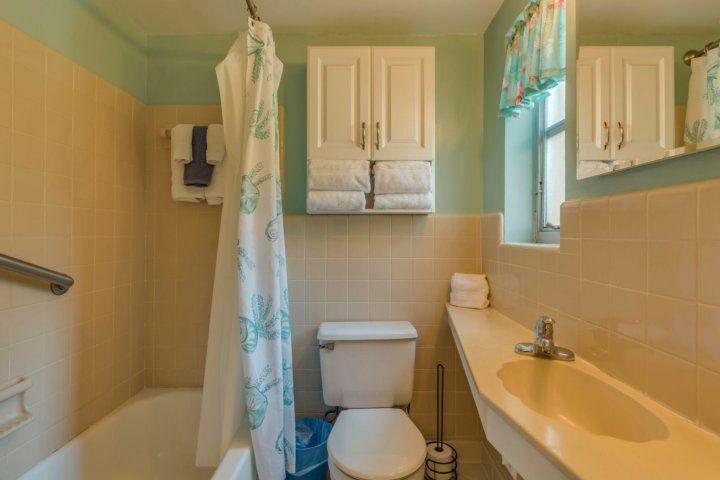 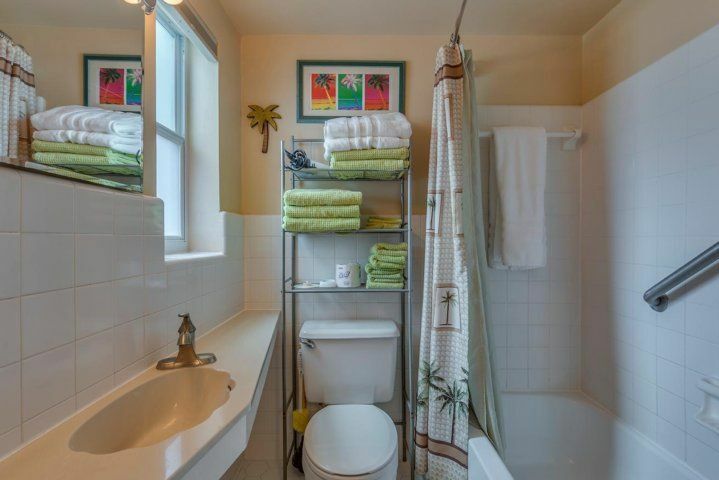 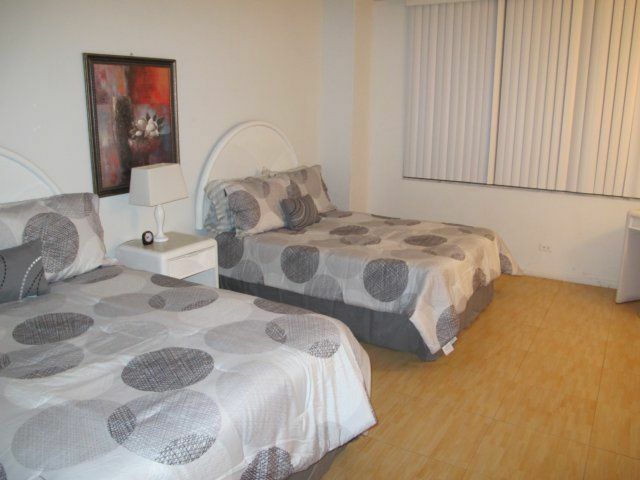 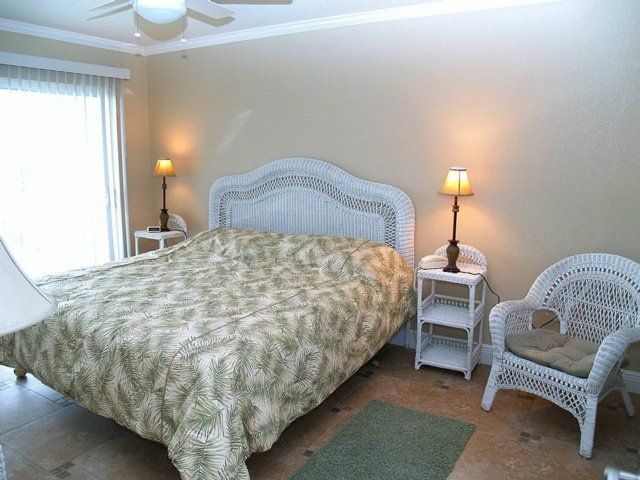 When you arrive, you’ll find the beds neatly made up and plenty of freshly laundered towels in the bathroom. 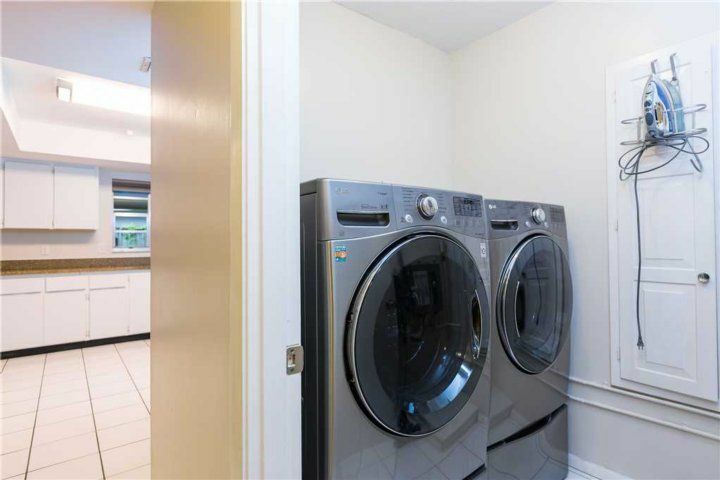 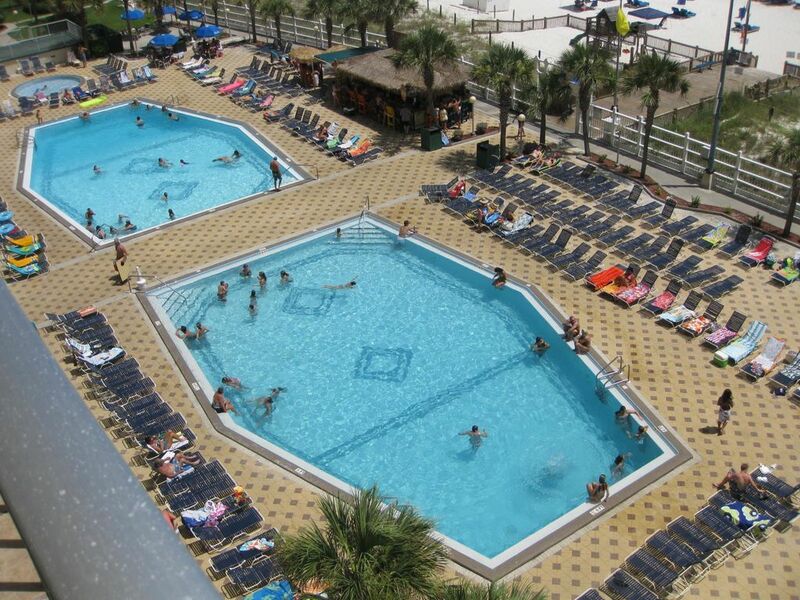 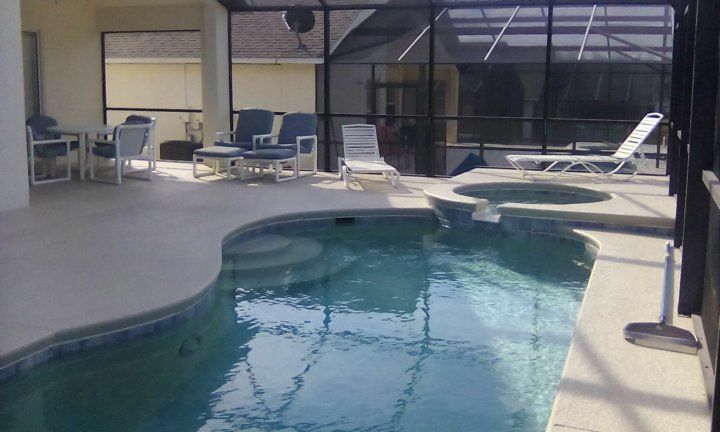 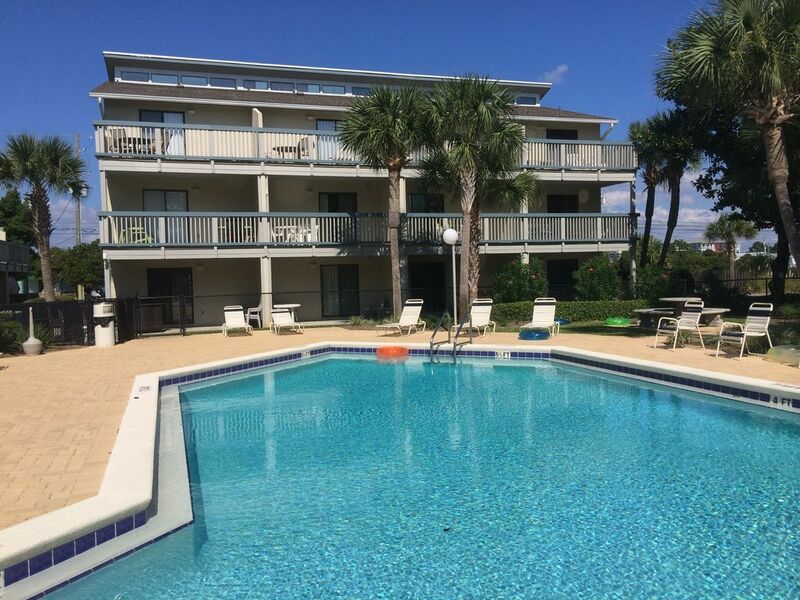 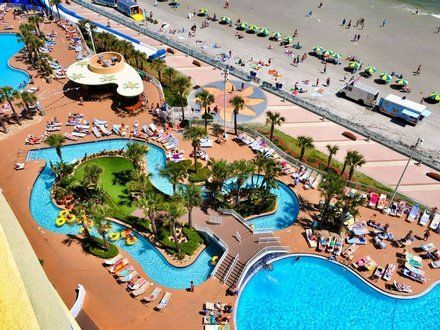 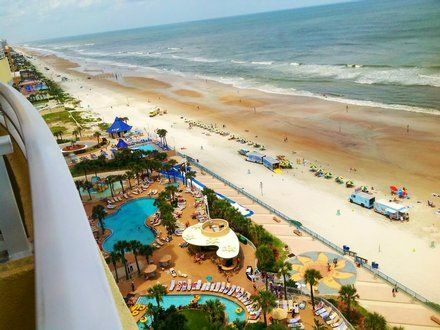 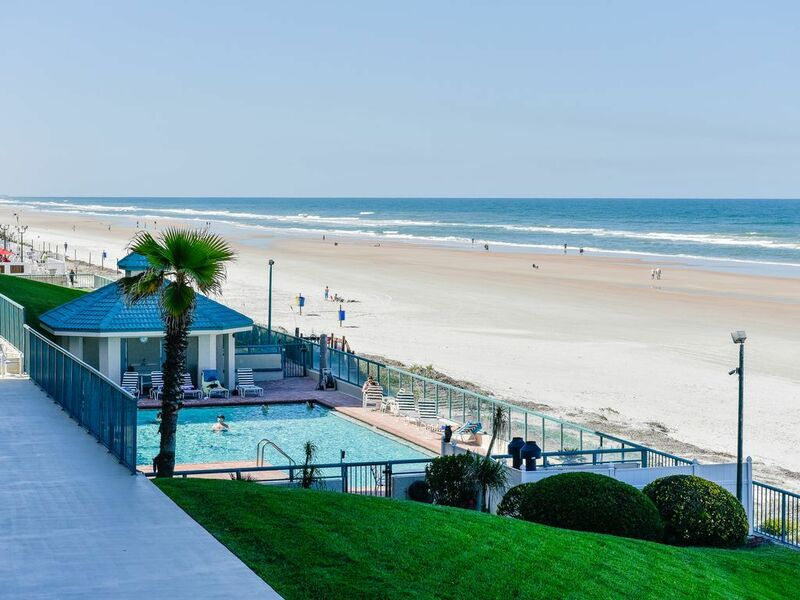 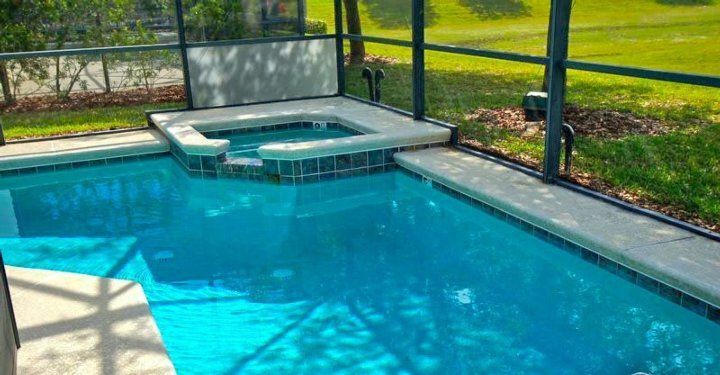 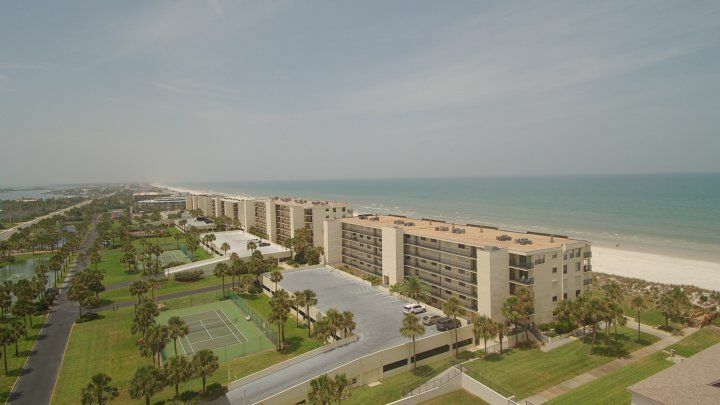 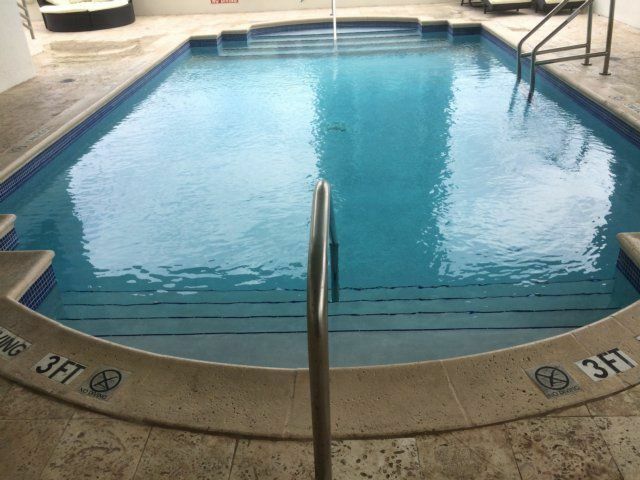 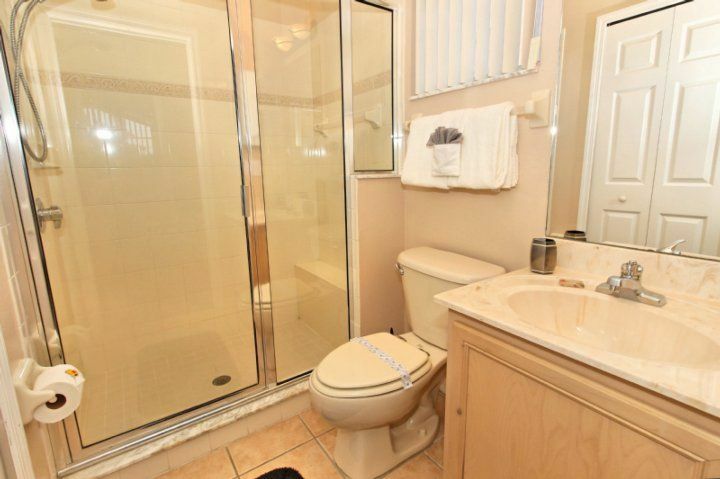 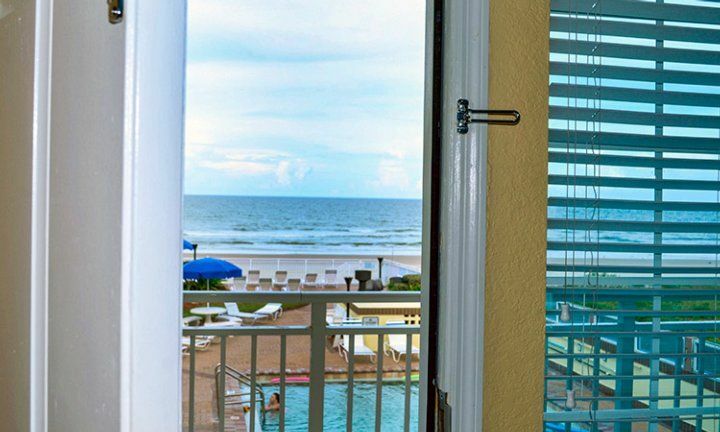 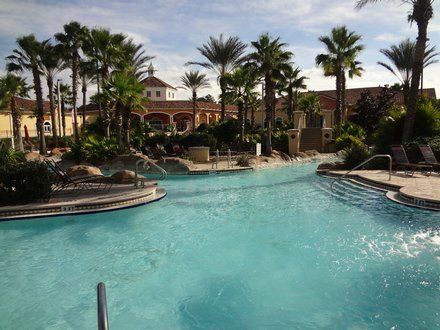 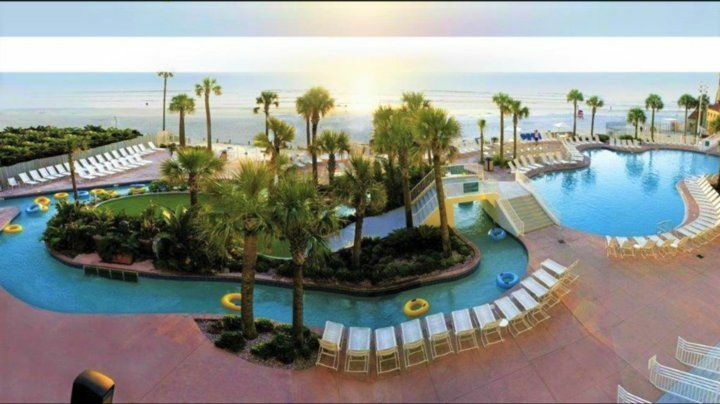 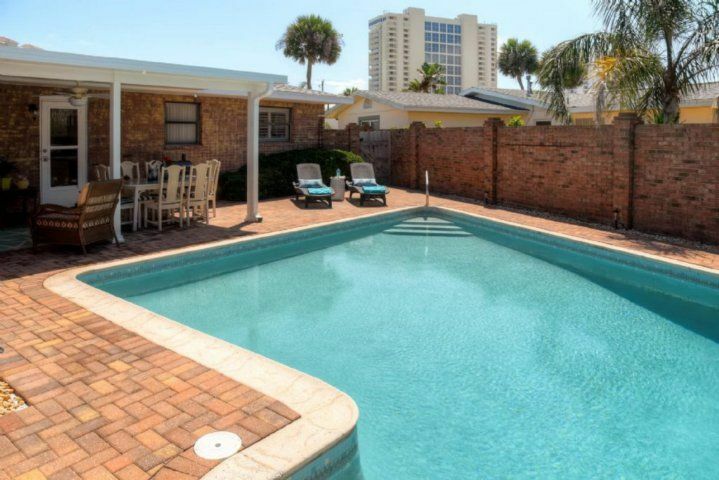 For even more convenience, there’s a private washer and dryer—given how often you’ll be jumping in and out of the pool and the gulf, that’ll come in handy for making sure you have enough swimwear for your stay! 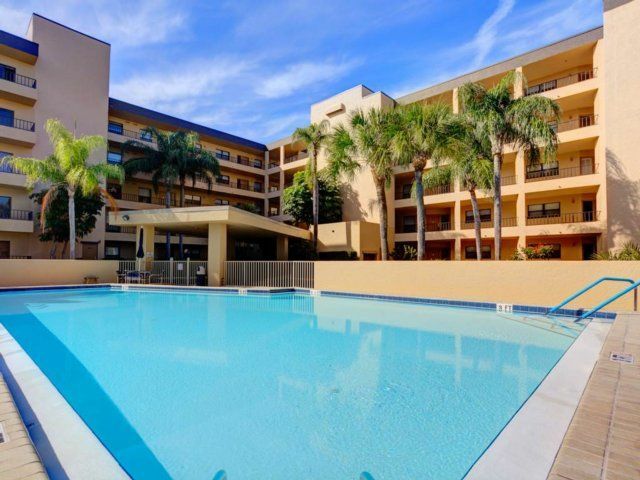 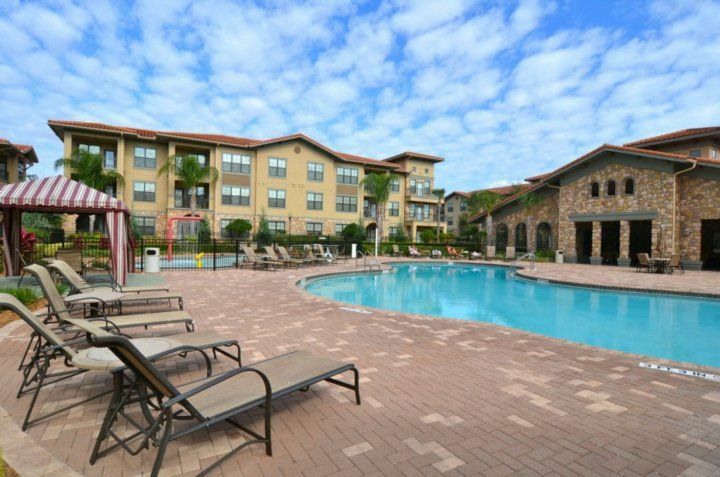 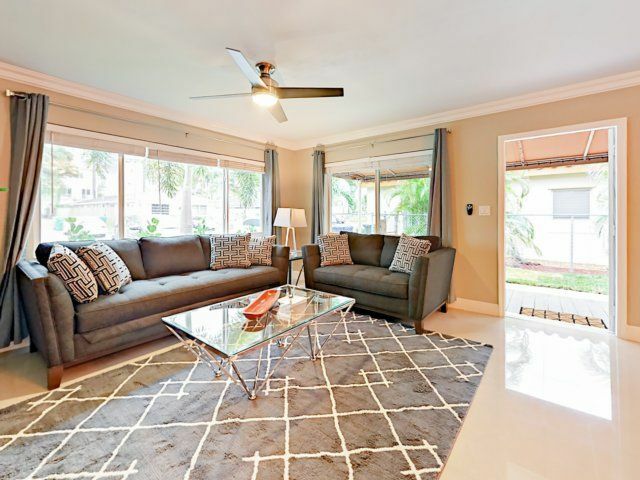 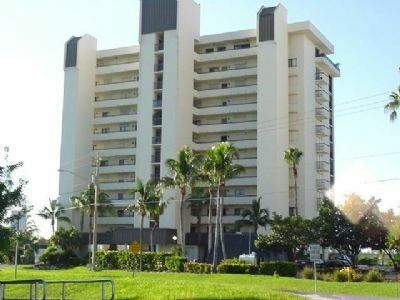 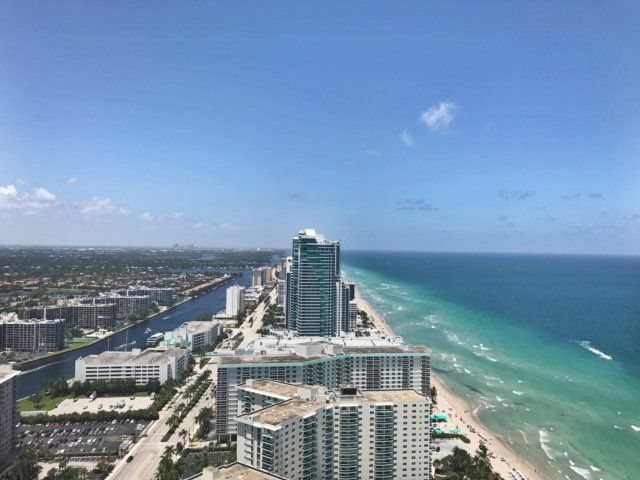 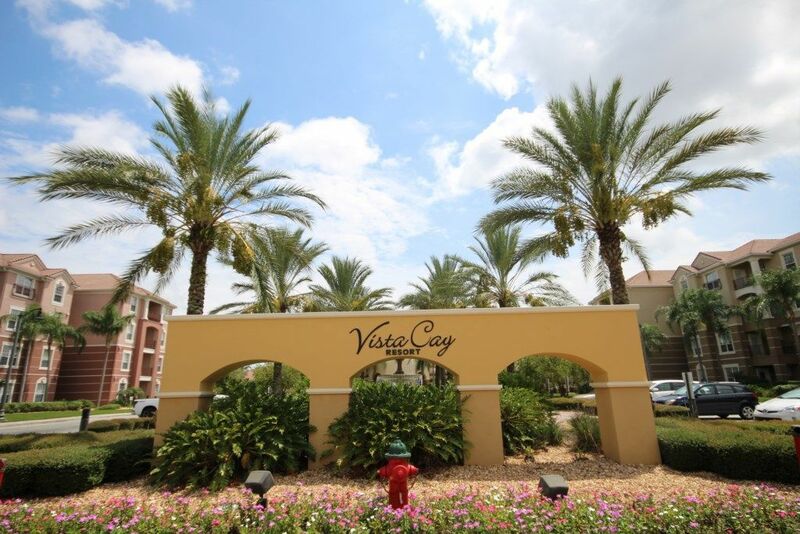 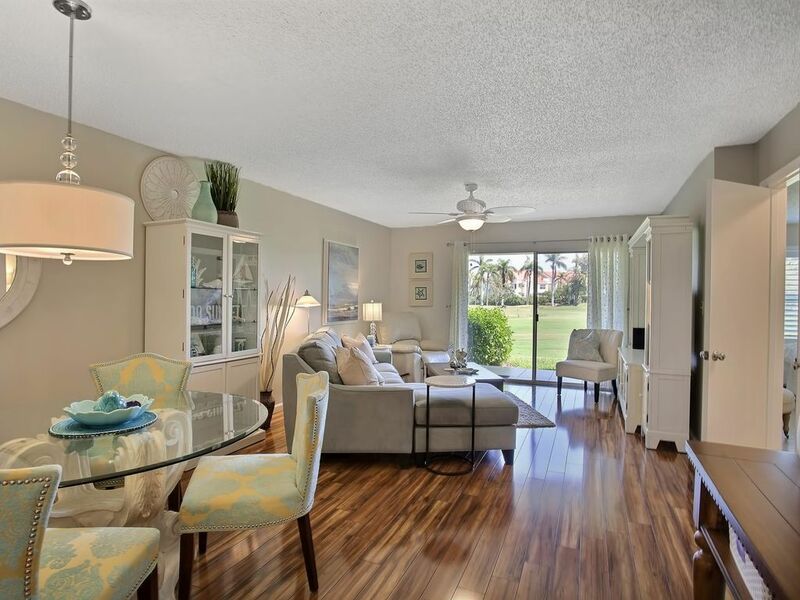 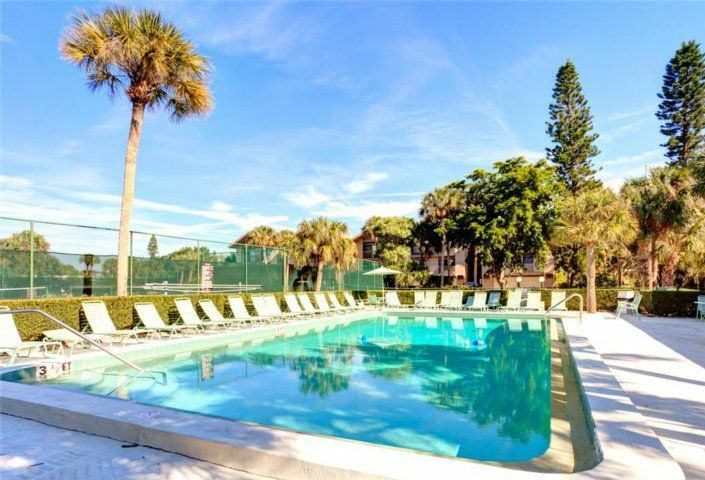 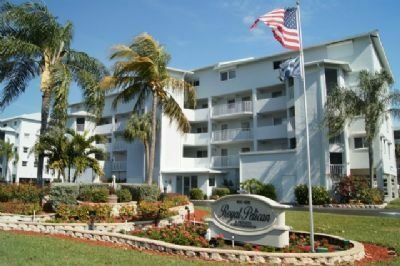 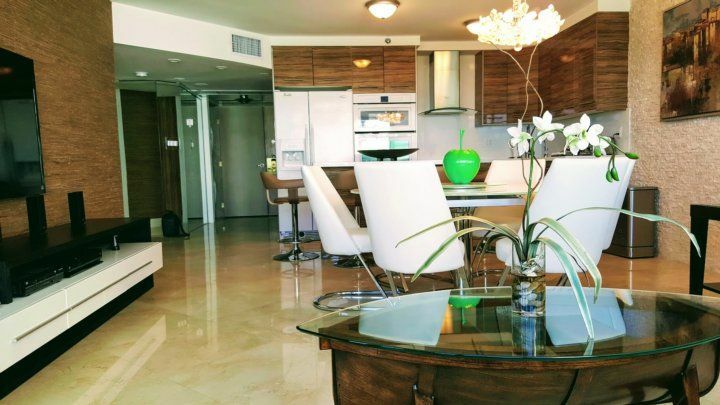 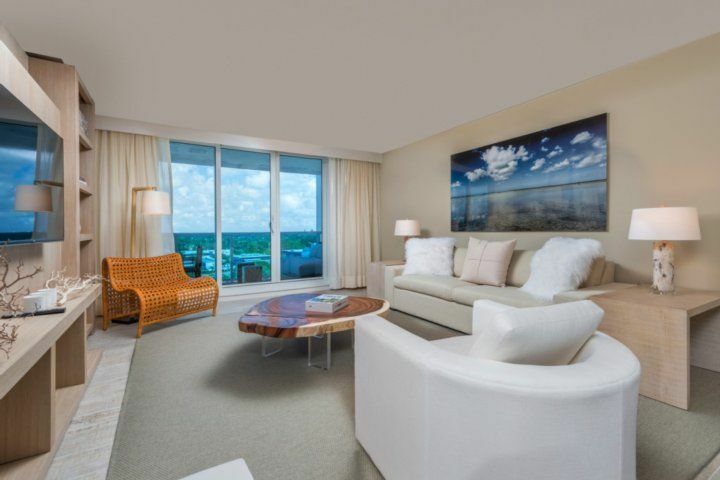 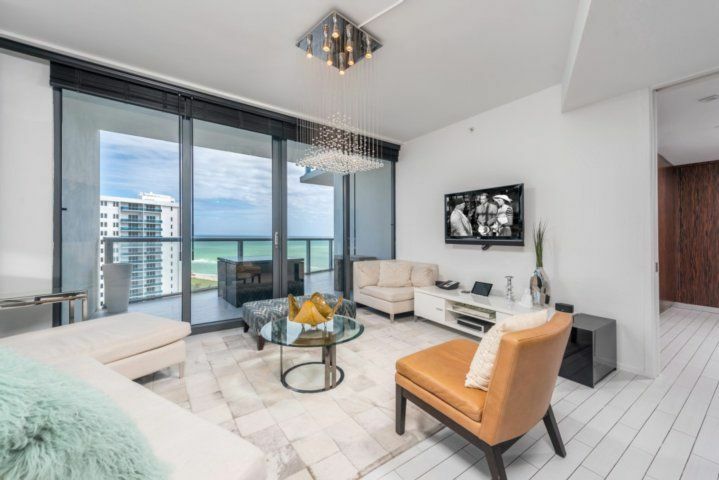 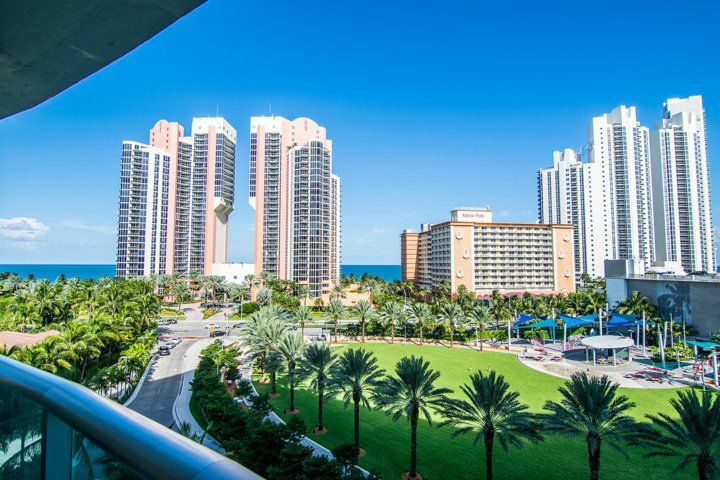 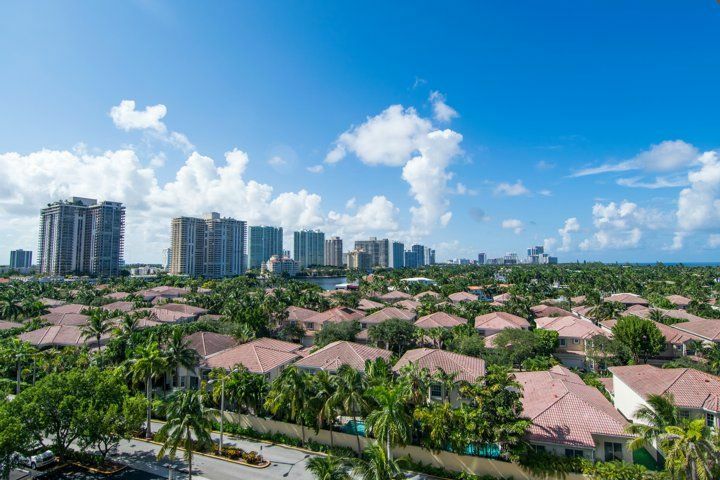 The 1 bedroom unit offers a splendid view of leafy palm trees and gorgeously manicured grounds, not to mention enough parking for your entire family to come over. 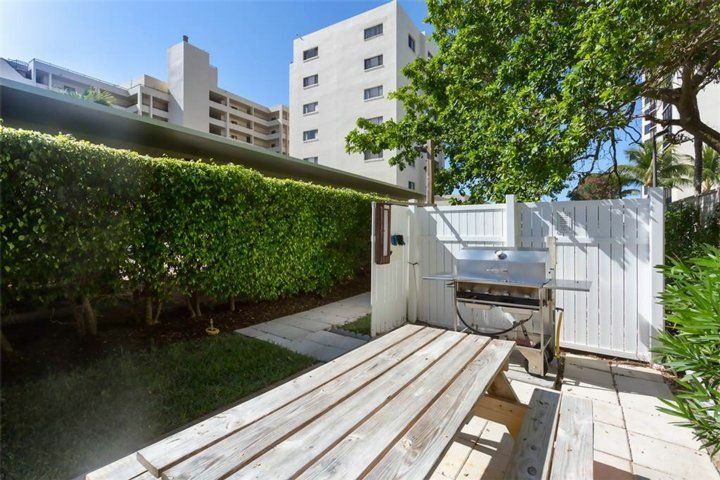 In the backside, you’ll find an exclusive barbecue area with plenty of chairs, charcoal grill, and a large table for dining with the extended family. 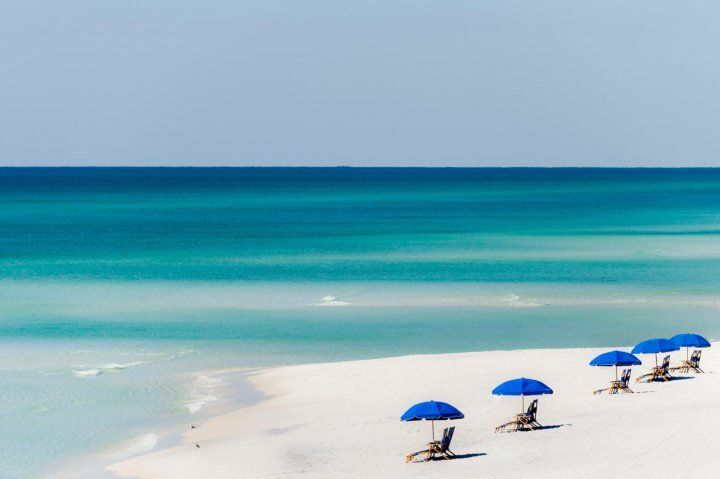 There is simply no way you can pass up the opportunity to go on a vacation of a lifetime. 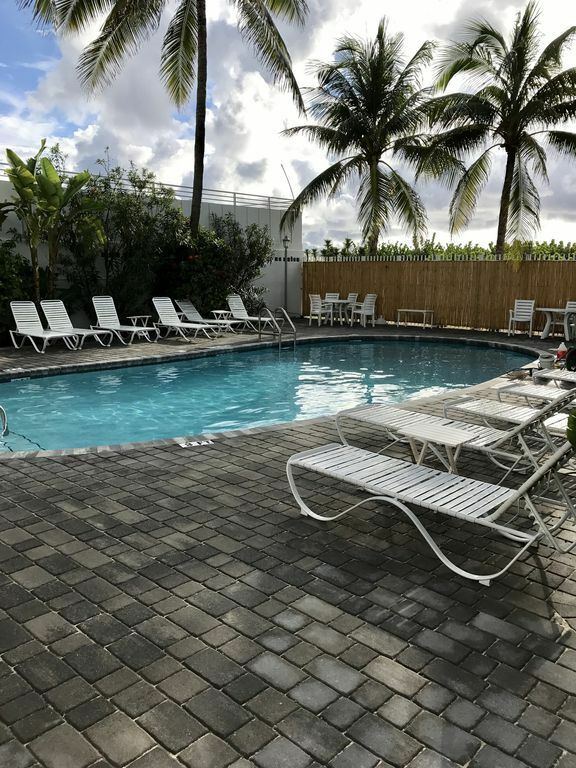 This luxury resort will give you 1 bedroom that sleeps 4 persons, 1 bathroom, a gorgeous view of the indoor garden, and the best of all, a heated in-ground pool that the kids absolutely love! 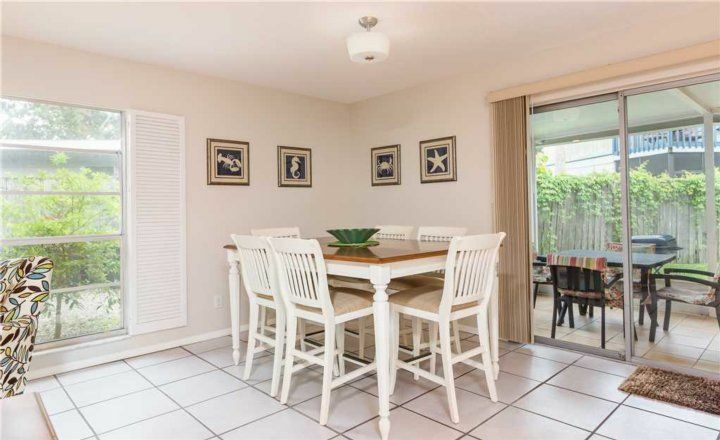 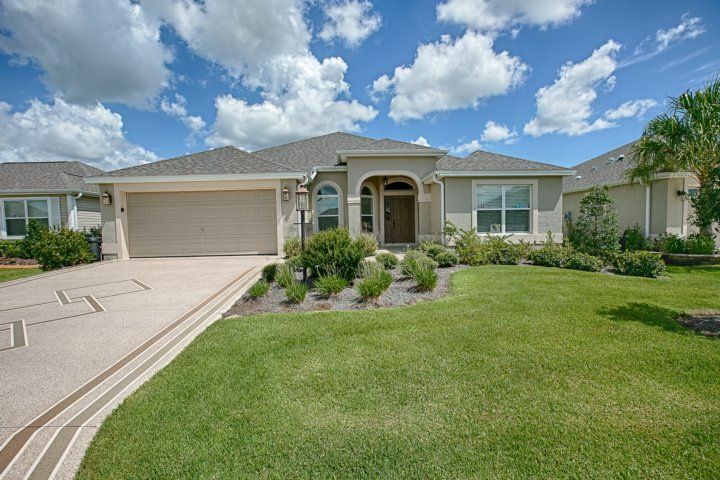 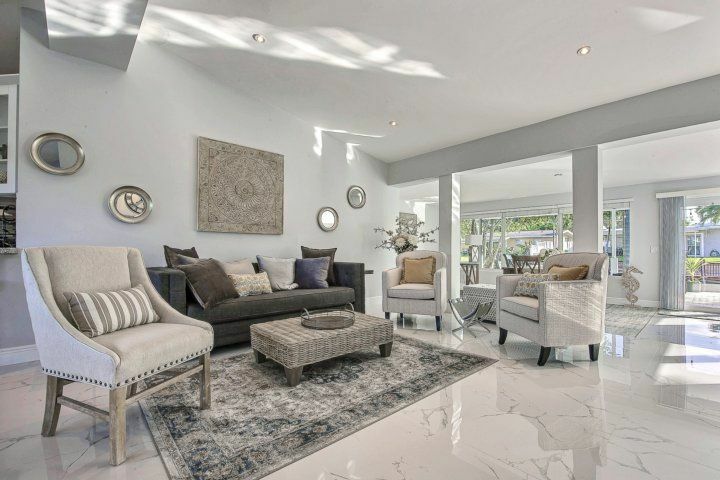 Moving inside you’ll find tiled floors, a neutral color scheme that’s not too harsh on the eyes, large windows to keep out dry midday summer, and a spacious living/dining area as well. 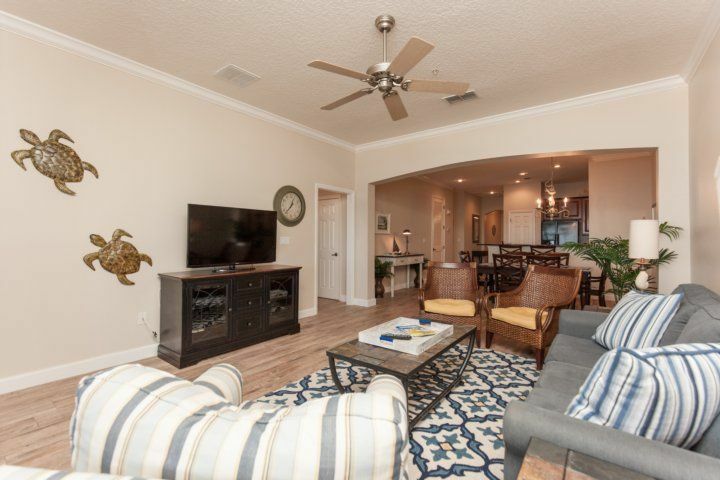 You don’t have to leave behind your pet cat or dog behind; bring them over to Crescent Street Manor because this location is pet-friendly. 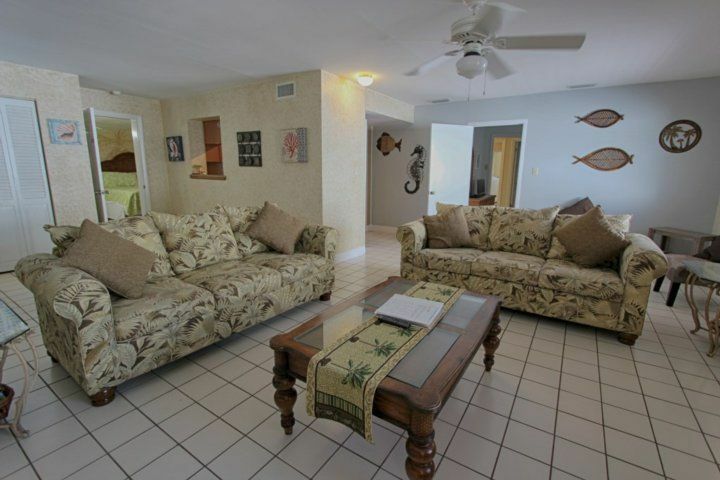 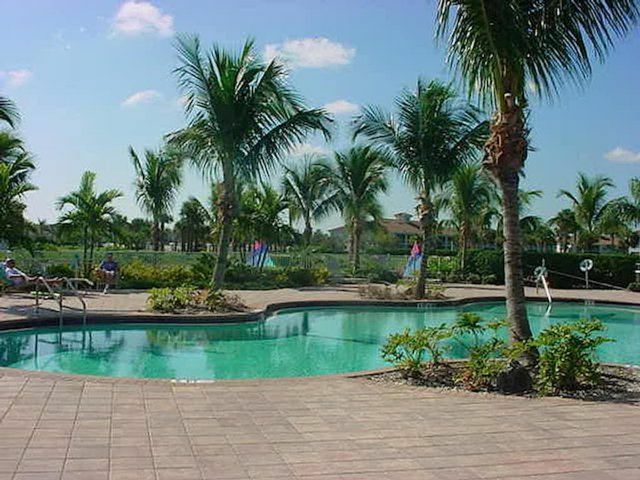 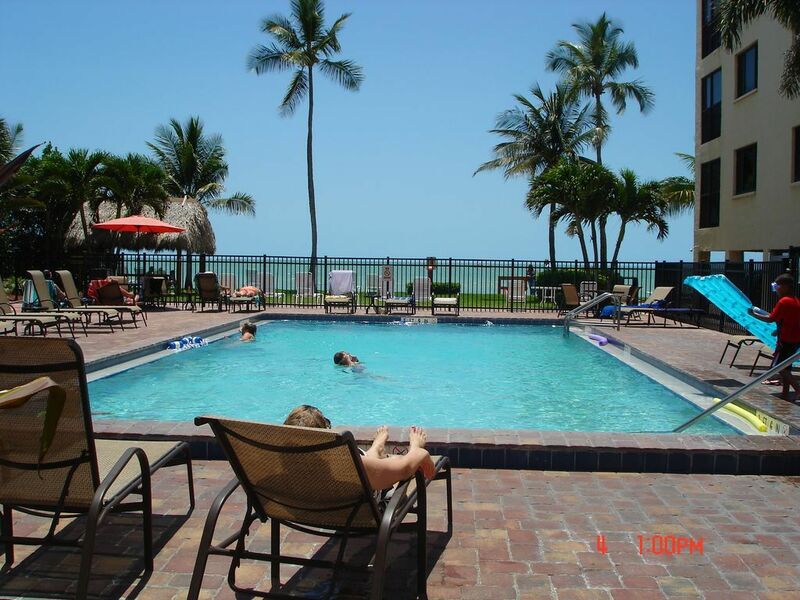 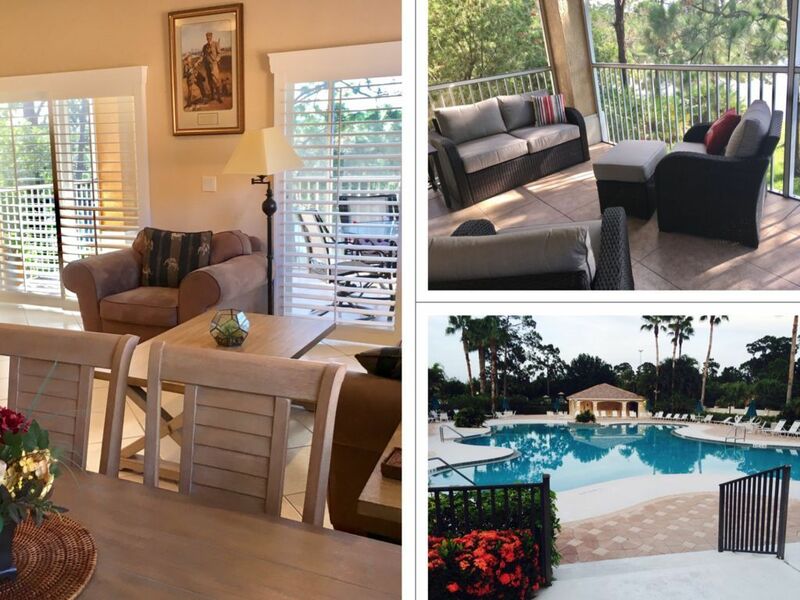 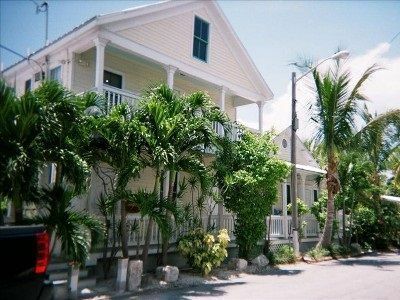 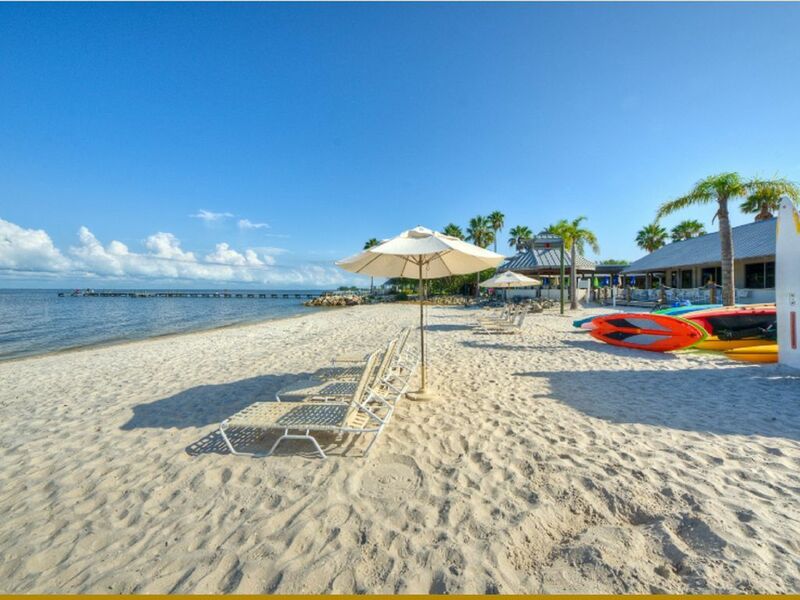 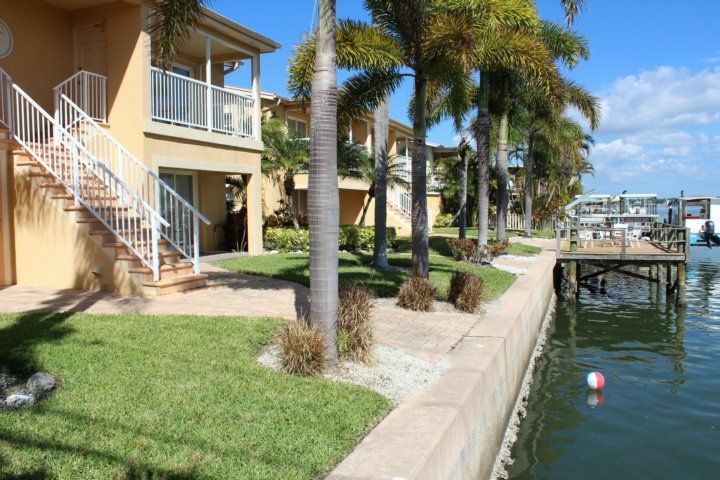 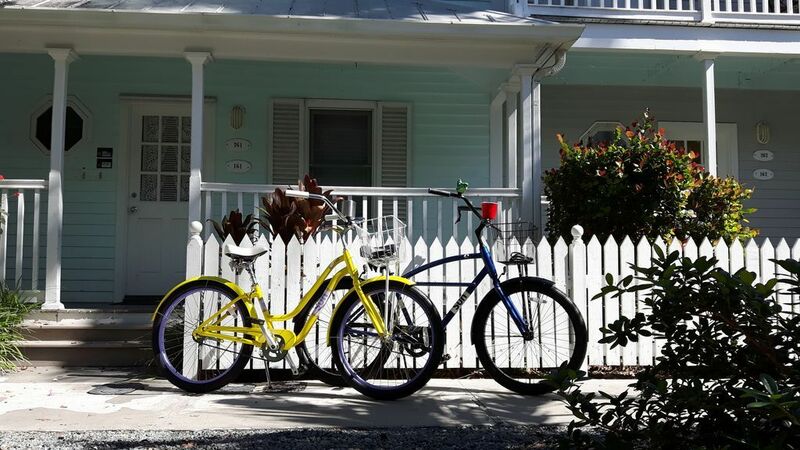 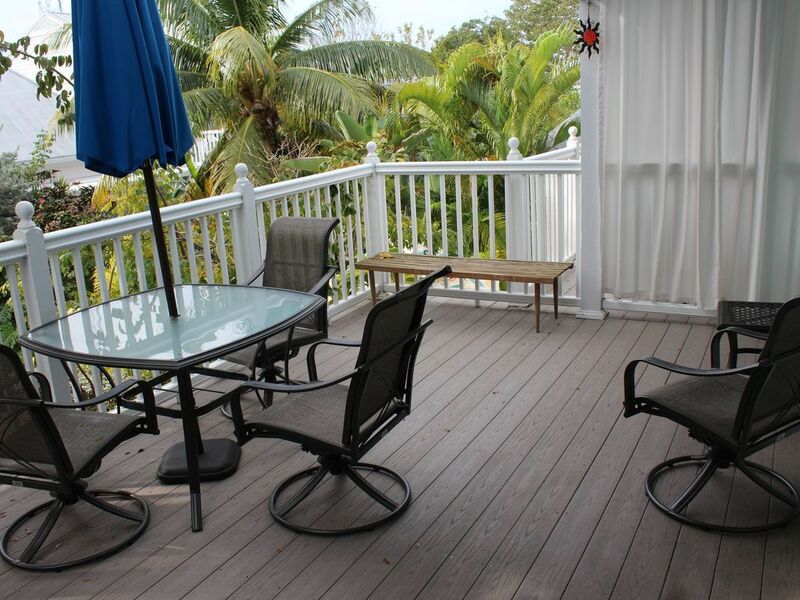 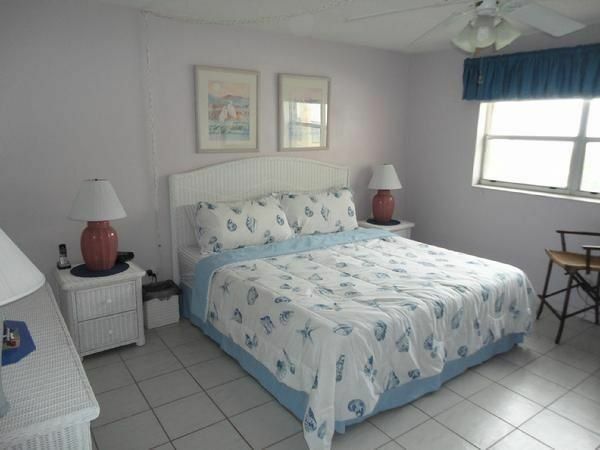 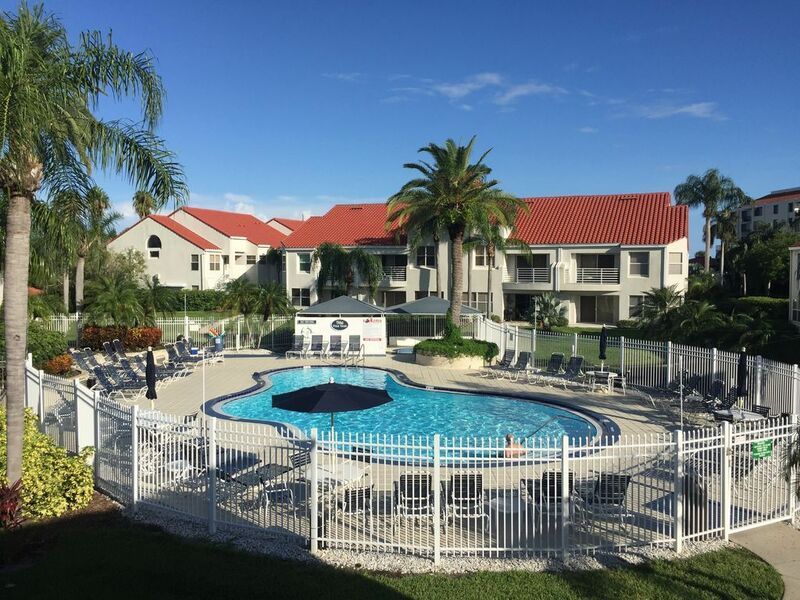 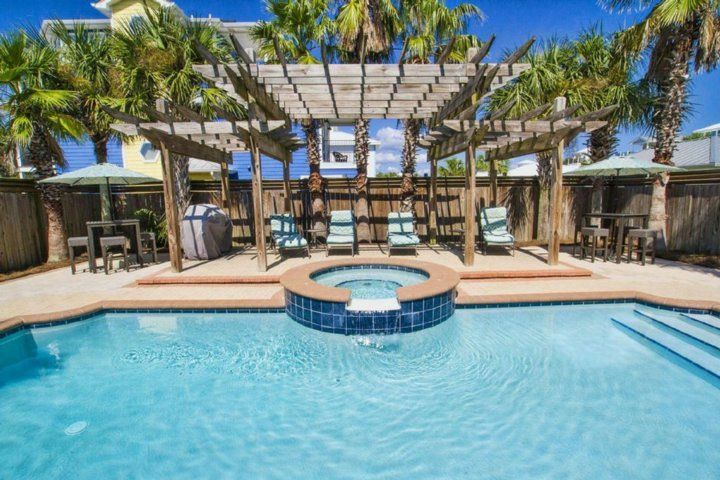 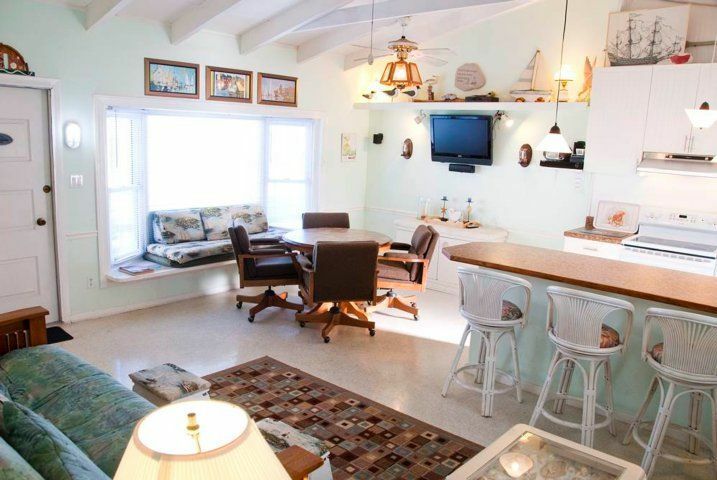 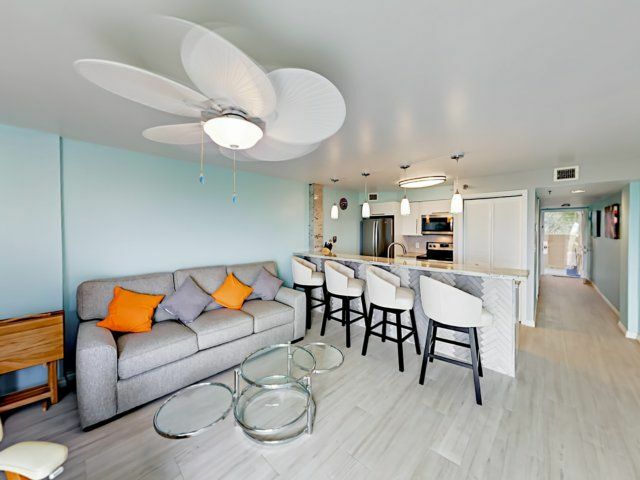 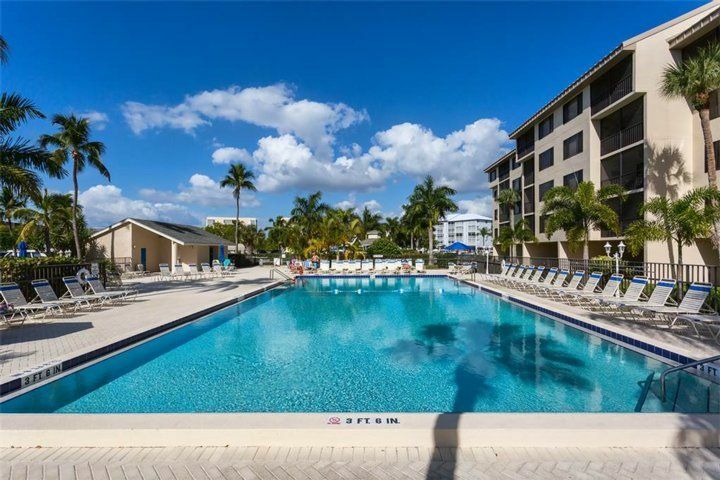 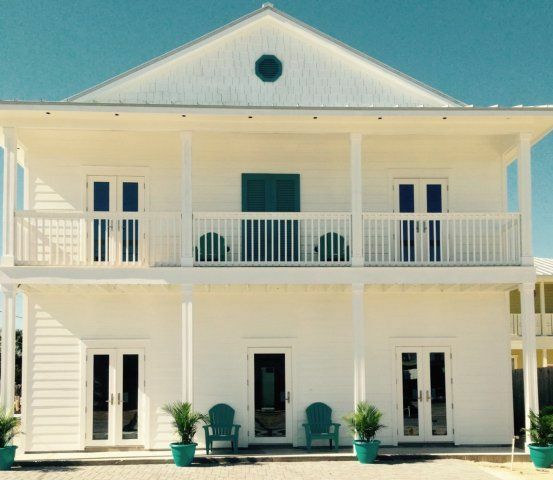 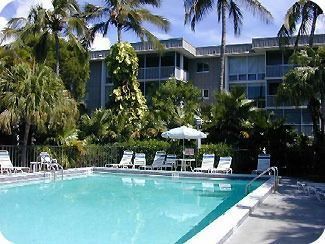 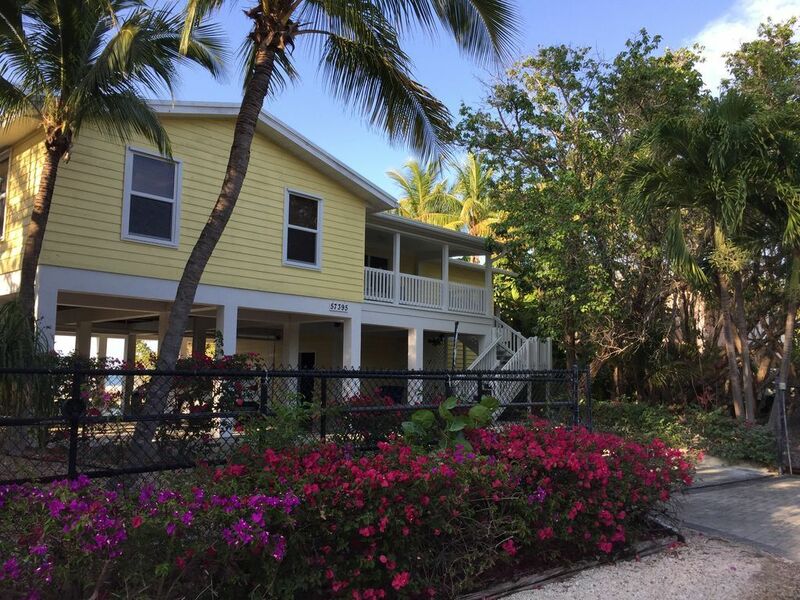 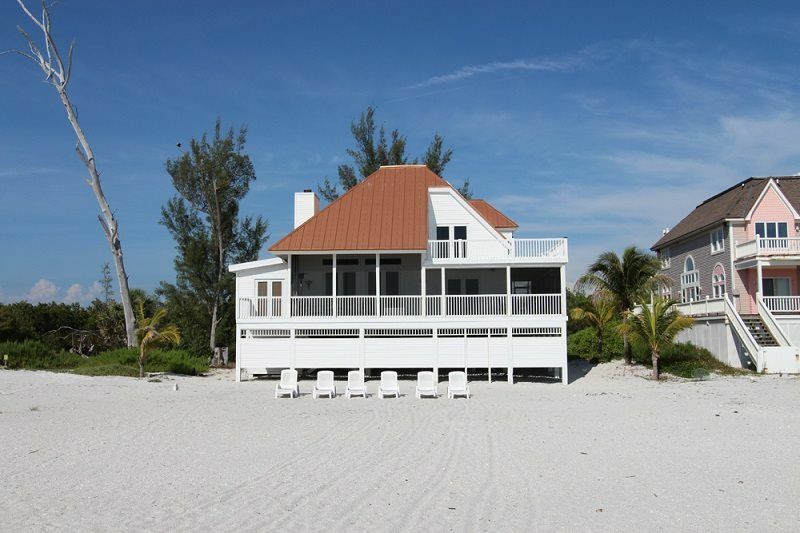 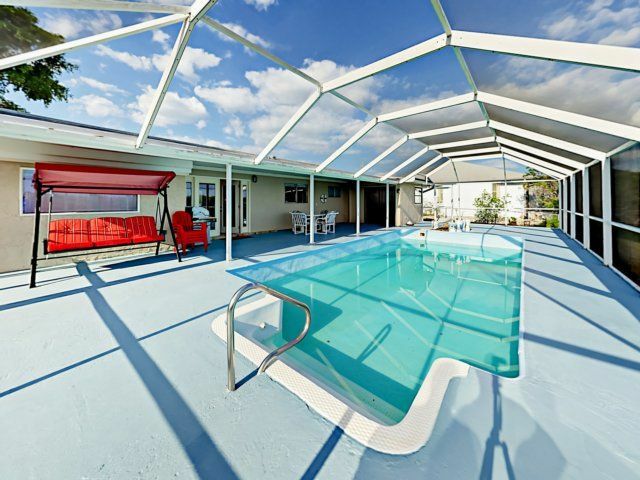 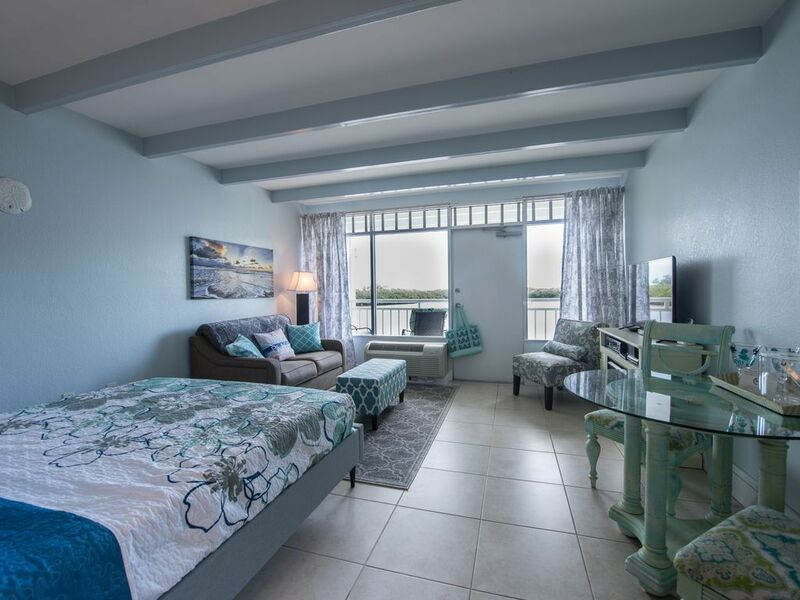 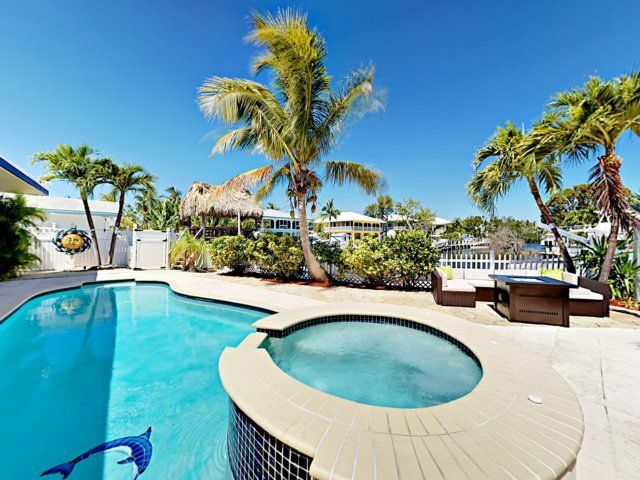 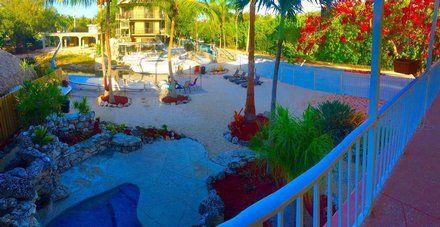 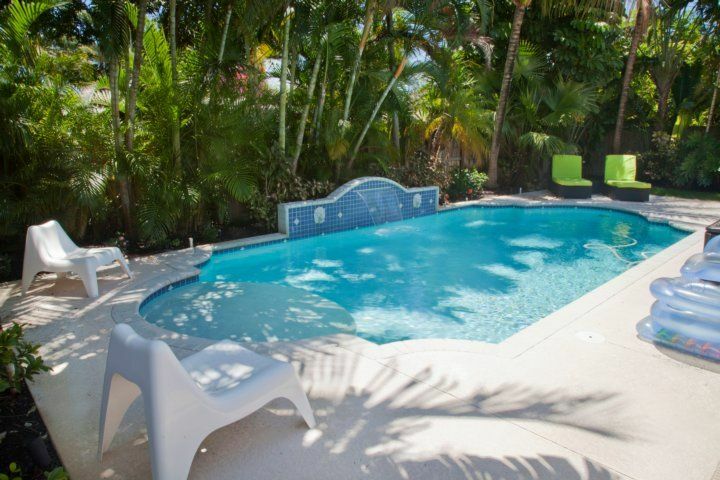 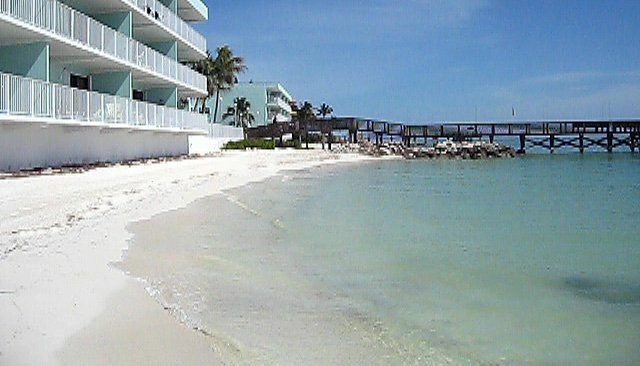 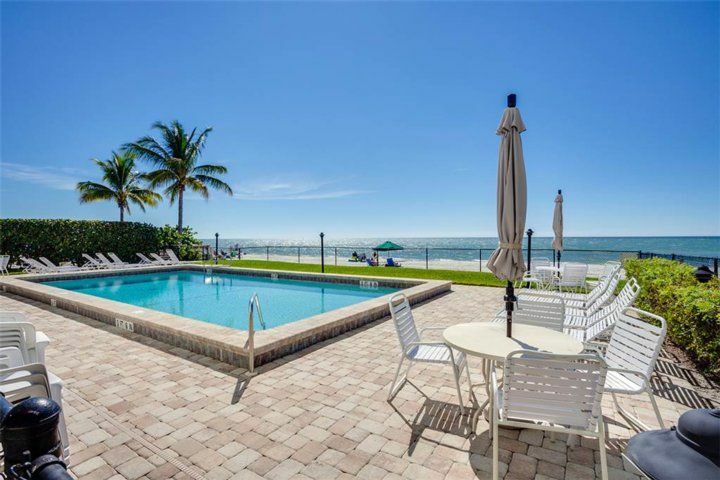 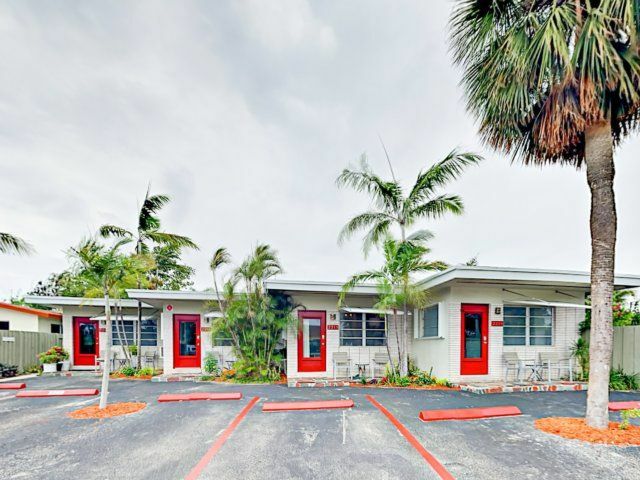 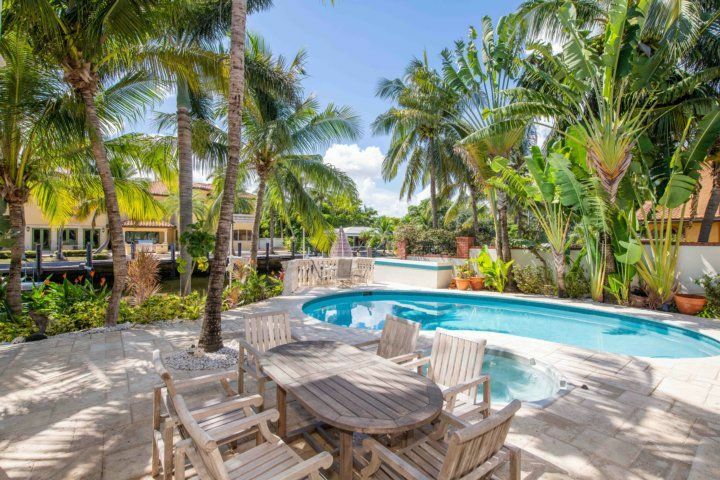 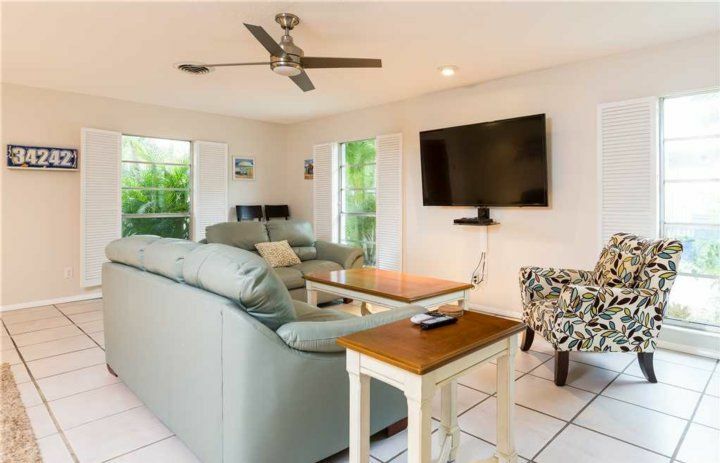 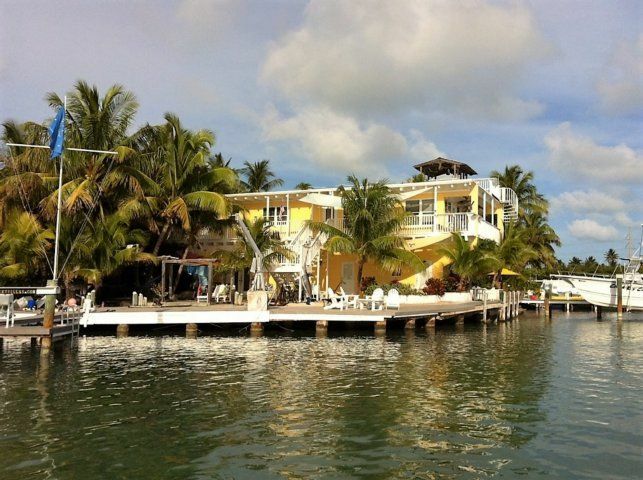 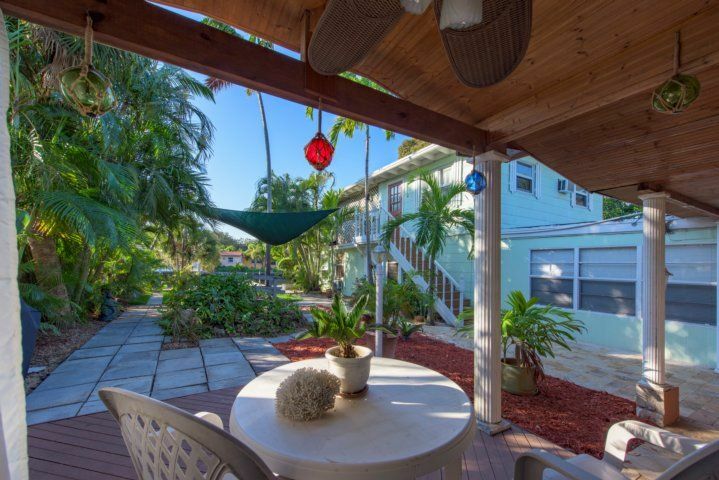 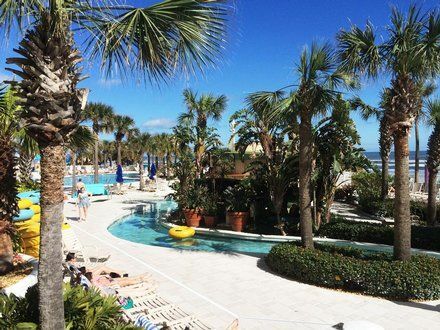 With charming setting, convenient location right at the heart of the town, and comfortable furnishings to keep you cozy all day long, there is no better way to celebrate a getaway than checking into this resort in Sierra Key. 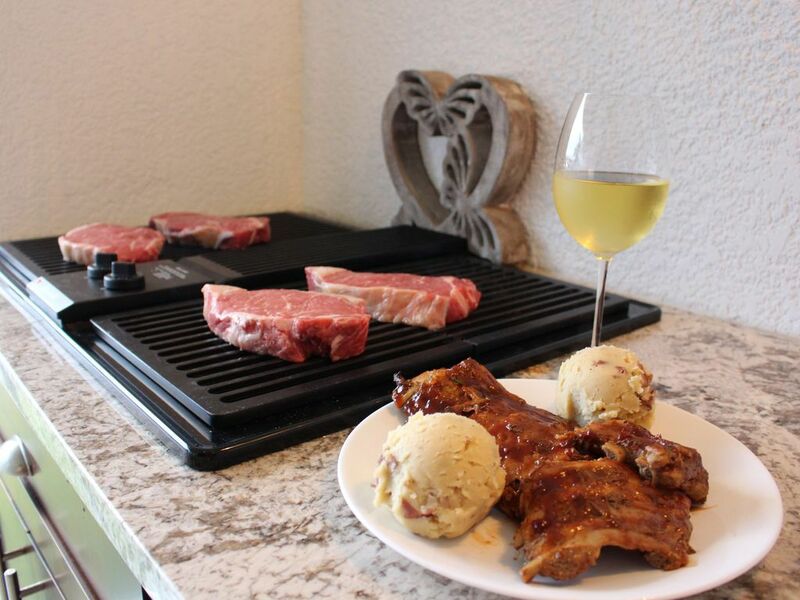 Feeling too lazy to go out to eat? 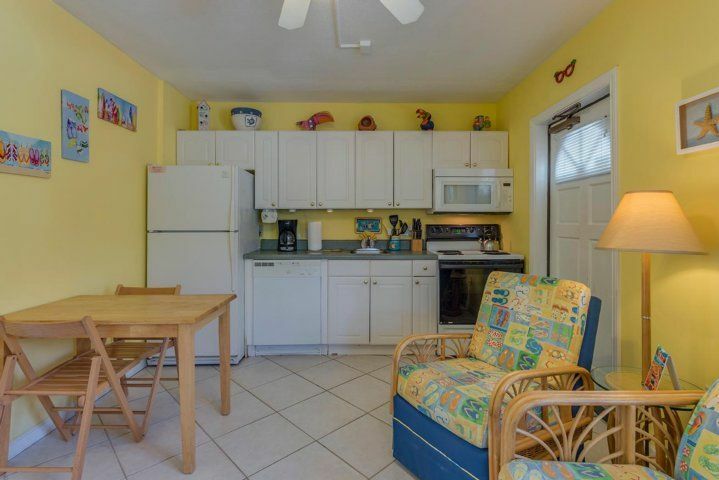 No worries, the spacious kitchen is equipped with all the items you will need to prepare delicious food without stepping outside. 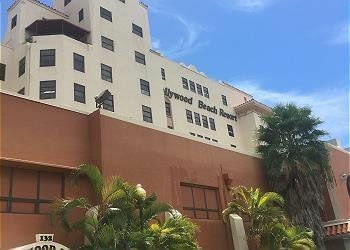 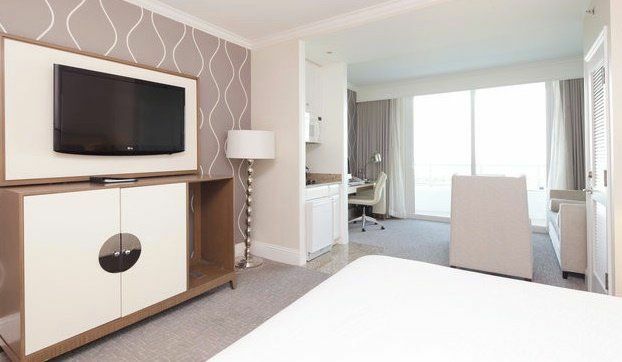 Enjoy other amenities like free Wi-Fi, a large flatscreen TV, comfortable convertible sofas, and room service on call 24/7. 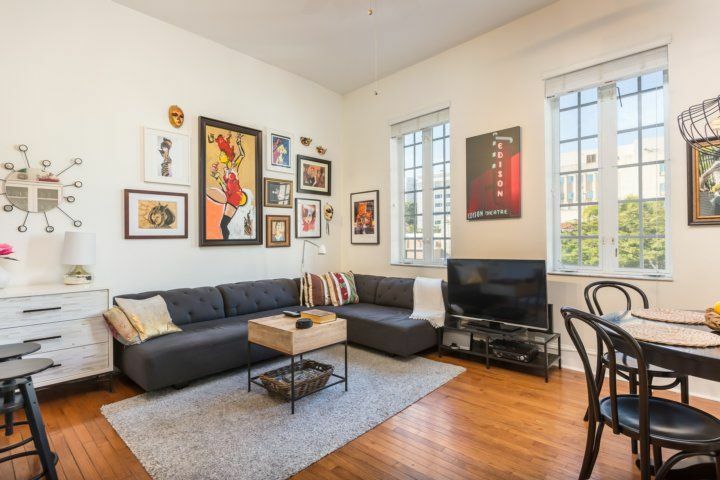 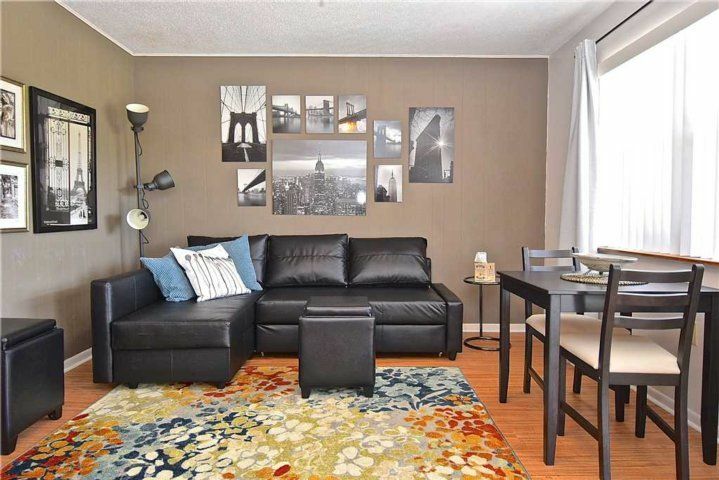 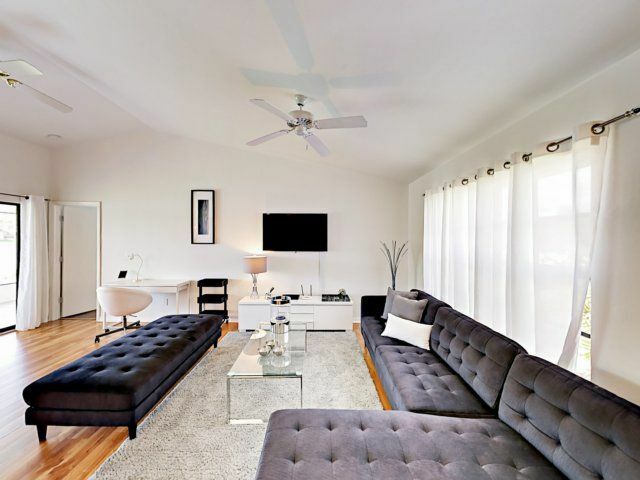 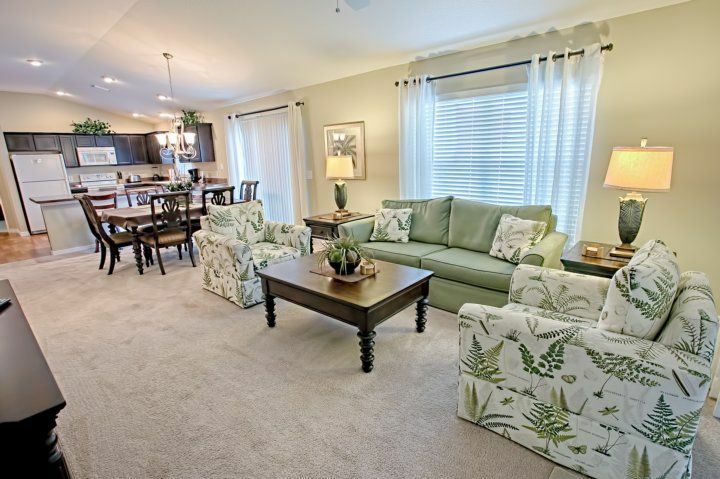 Crescent Street Manor is so incredible that you'll almost feel guilty for not missing your home. 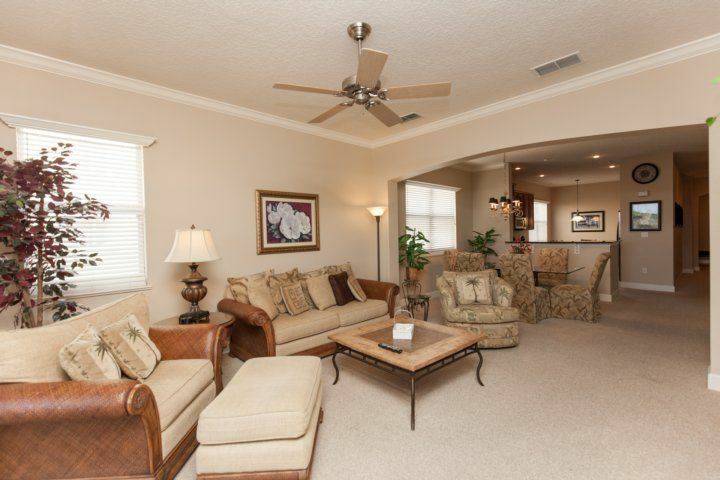 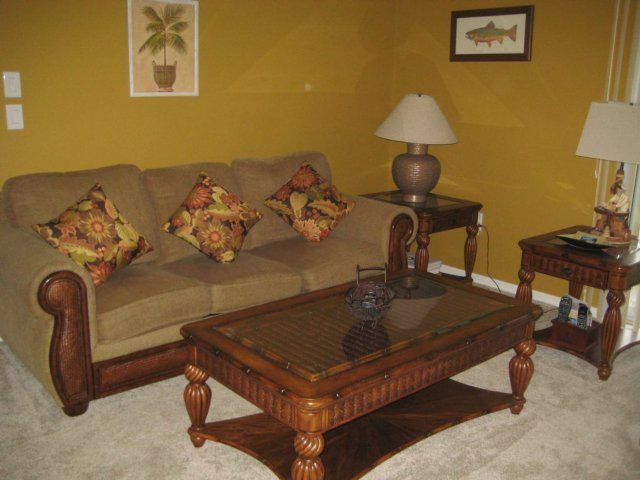 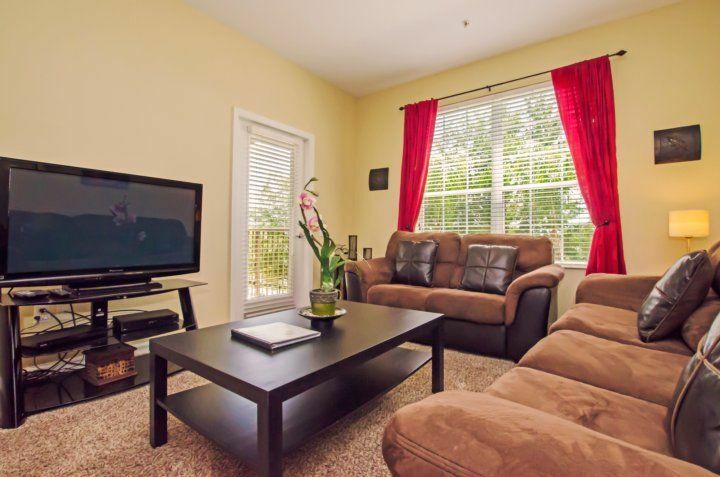 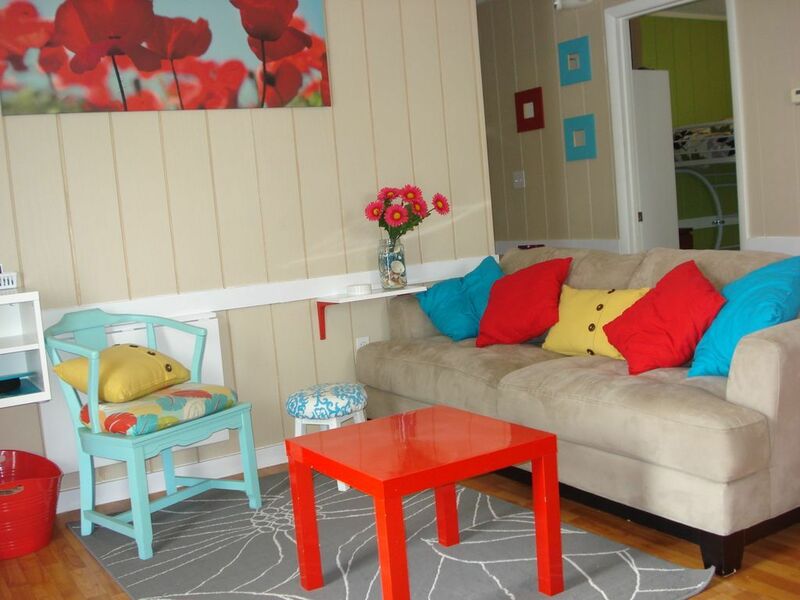 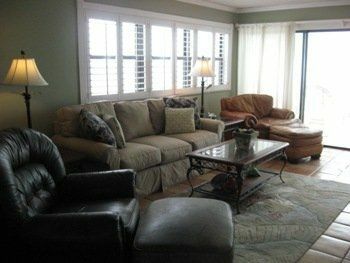 A charming setting, comfortable furnishings, and a beyond-convenient location: Crescent Street Manor has it all. 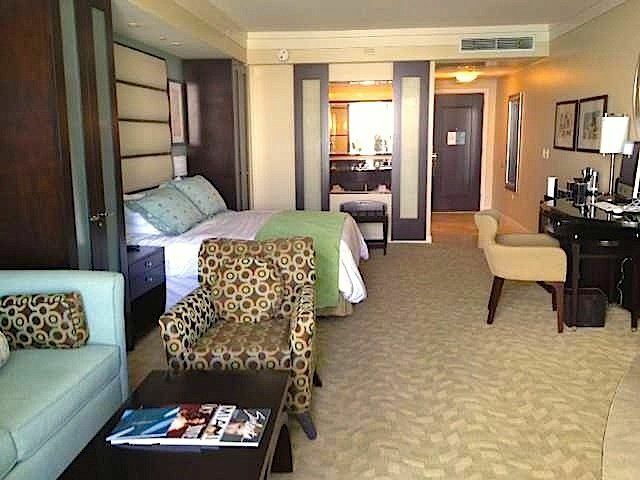 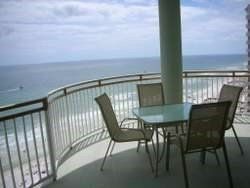 So don’t miss out: Book your stay today, before someone else beats you to it!